Kristina and Eman from the Chinook High School Interact Club. 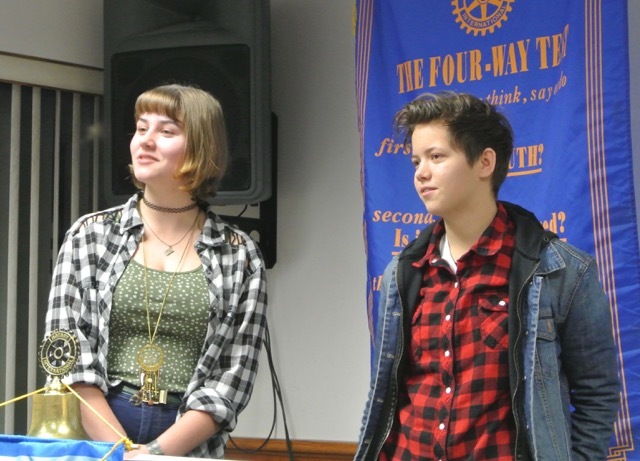 They shared how their club could help Los Amigo. 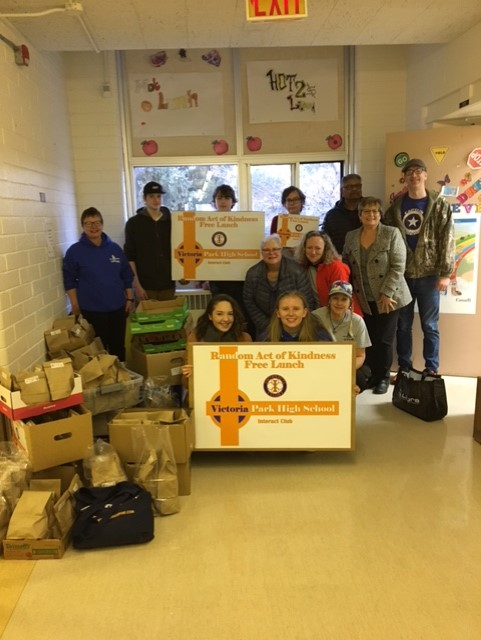 We would like to thank you for your help and support to the Lethbridge Food Bank. 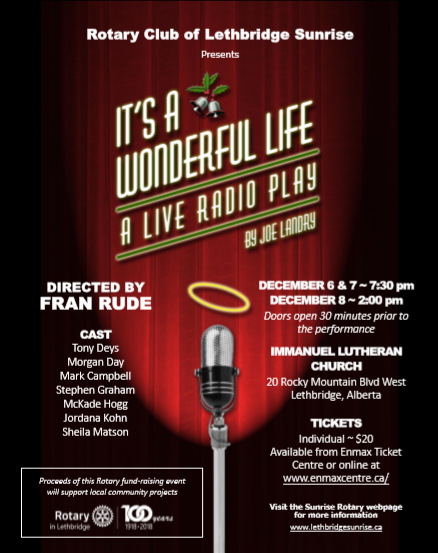 5:00-7:00 pm and enjoy light snacks and beverages at the Lethbridge Food Bank (1016 2nd Ave S). Don’t forget to RSVP as well. Thank you. We hope to see you there! 2:00 PM - What's Next? This is an excerpt from our 2019 Annual Letter. You can read the full letter here. We would probably say no. From especially devastating natural disasters on the one hand to record numbers of women campaigning for office on the other, 2018 felt to us like a series of surprises. The world looking backward from today is very different from what we pictured a couple years ago looking forward. Want to learn more about these surprises? Read our full Annual Letter at GatesLetter.com. 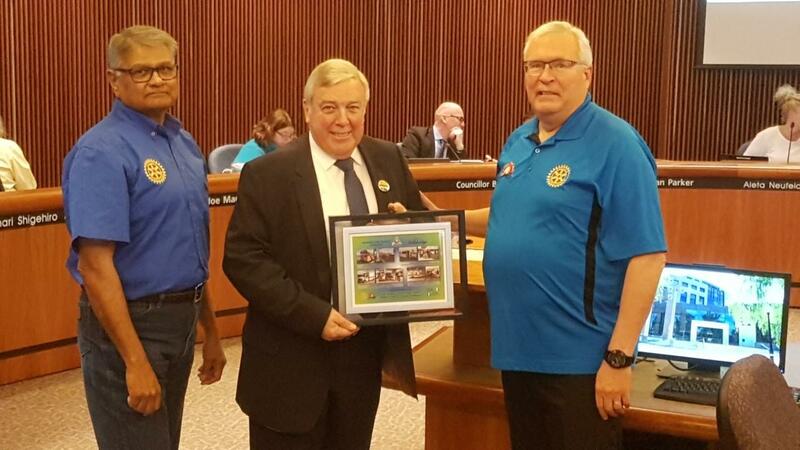 Karl and Jim do a presentation to the City of Lethbridge on behalf of Los Amigos. Karl shared his experiences in life. Hello! Lets get the supper club started. 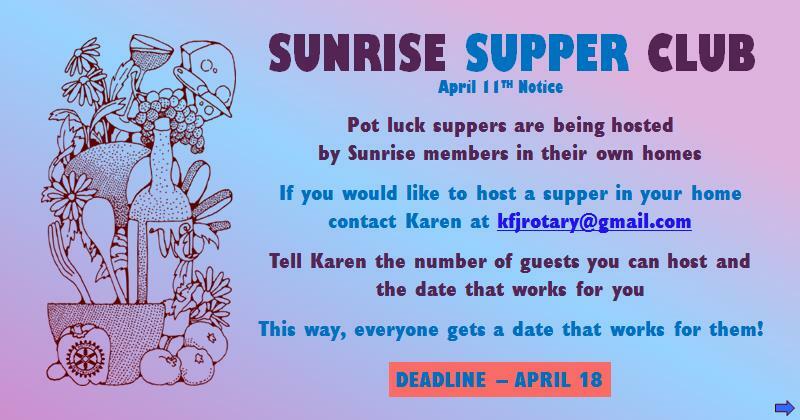 I am looking for members to host a pot luck dinner at their home. Here is what I need..
Once I have a few houses to host, I will send out a link for the appropriate number of guests to sign up at your house on the date you choose. This way everyone gets a date that works for them!! 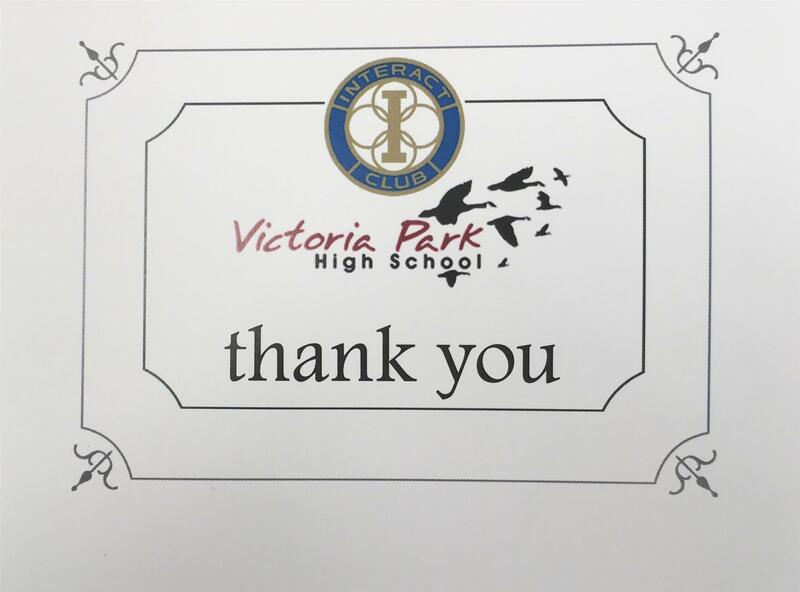 Thank you to the sunrise rotarians who donated to the Victoria park high school Christmas hampers. Great time by all, making and handing out 200 bag lunches in the downtown area. 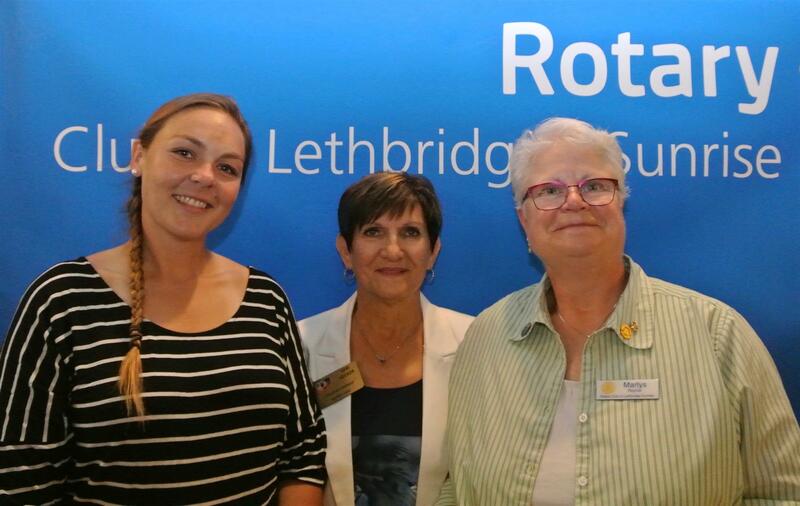 The Family Member Category allows more than one person in a family to become members of the Rotary Club of Lethbridge Sunrise at a reduced rate. Eligibility. Any household may apply for Family Membership and designees may include any household member who is at least 18 years of age. Family members do not need to join at the same time, but they can if they chose so. 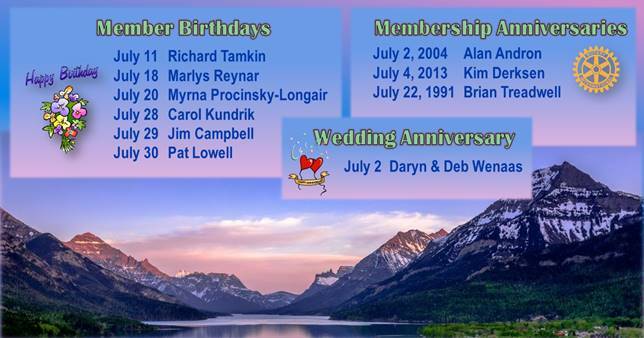 Current Individual Members may later add other family members. Approval. 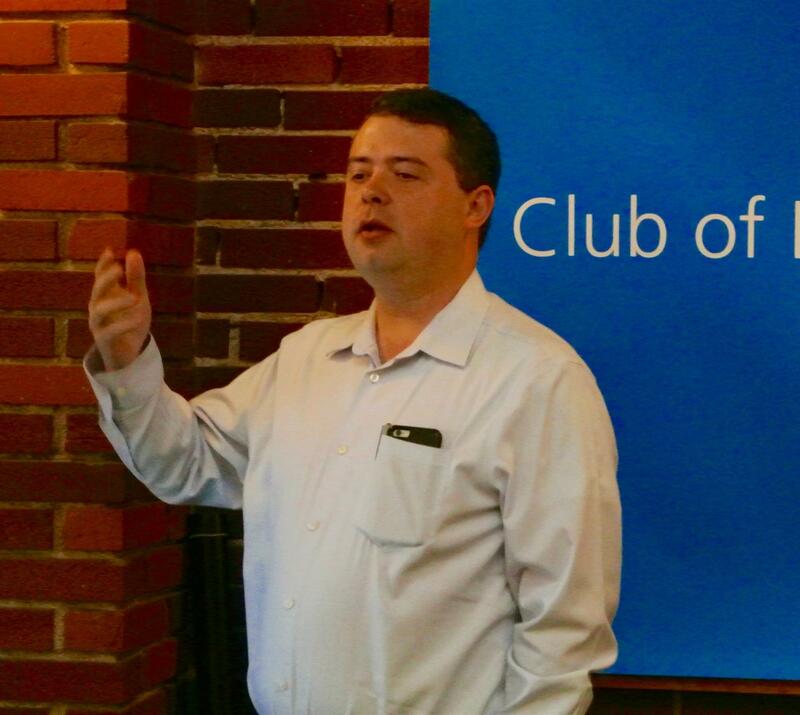 A Family Membership must first be approved by the Club’s Board of Directors. Inductions. 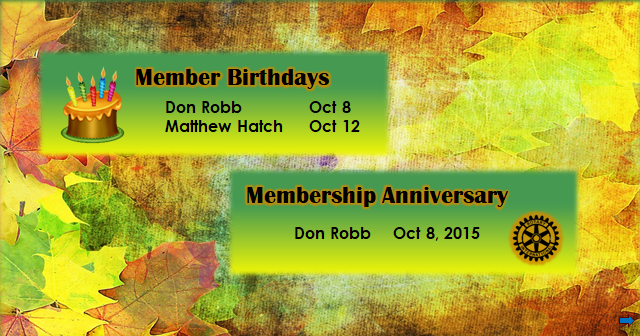 Each family member will be formally inducted into the club through the Club’s established new member process. RI Registration. 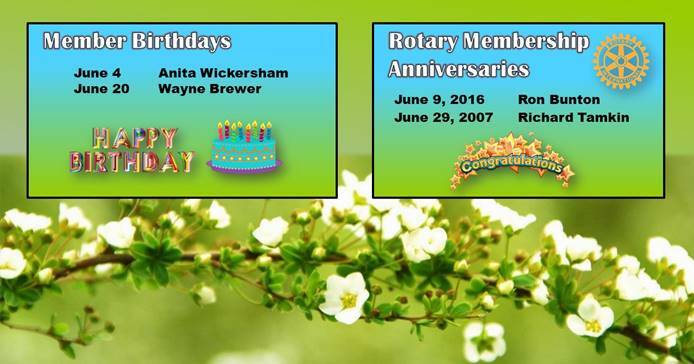 Each family member will be listed as an official member of the Rotary Club. Votes and quorum. 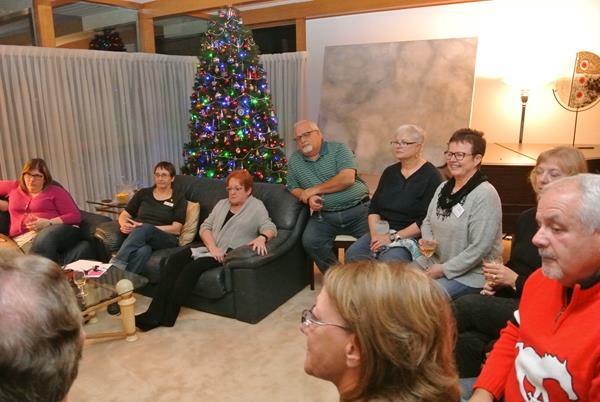 For the purpose of club meetings, each family member will be able to vote the same as an individual member. Holding office. 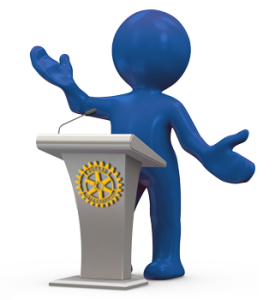 Each member, as an individual, can hold any office in the Rotary club to which the member is elected in the normal way. Annual club dues. One member pays full club dues and additional family members pay a reduced due that covers RI/District costs and insurance. Meals/beverage costs. Current meal fee structure is the same for all types of members. Bulletin and communication. 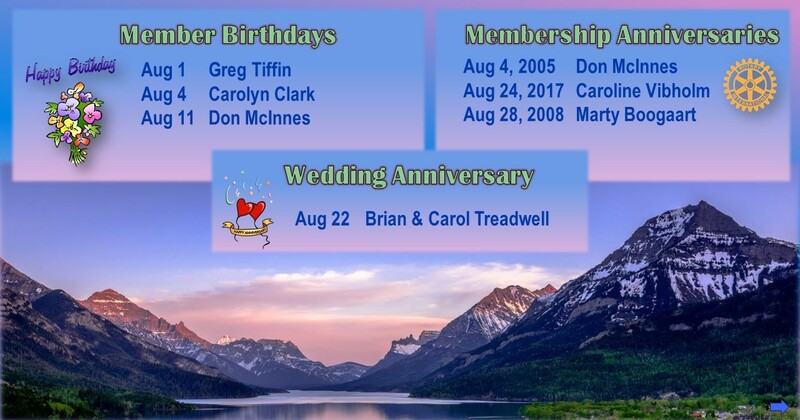 Family members will individually receive the club’s weekly bulletin/newsletter and regular club communications providing separate contact information is provided. The Rotarian magazine. 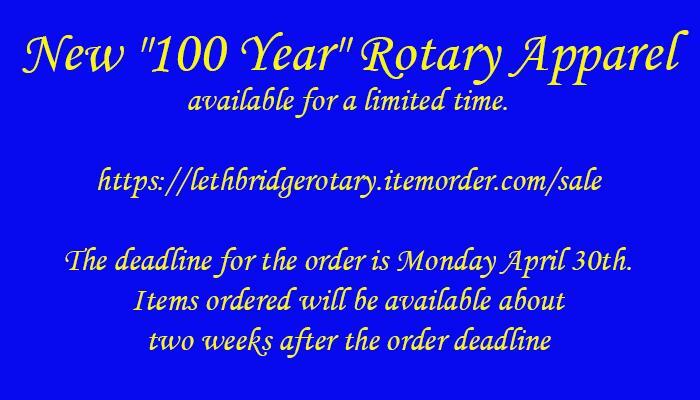 The family will receive a subscription to The Rotarian magazine (one copy per family). Participation in youth activities. The family members are expected to abide by all restrictions, policies, and procedures with respect to club activities involving youth. Termination. The process for terminating a family member is similar to that for individual members. 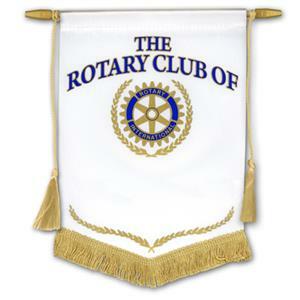 An individual may remain a Family Member as long as the original Rotarian is still a member. 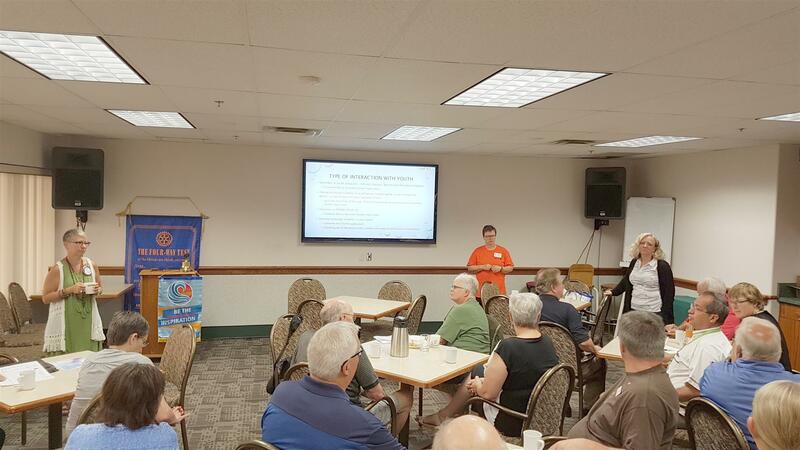 If the original Rotarian leaves the Club, the related family member must become a regular Rotarian as soon as is feasible, but no later than the beginning of the next fiscal year. 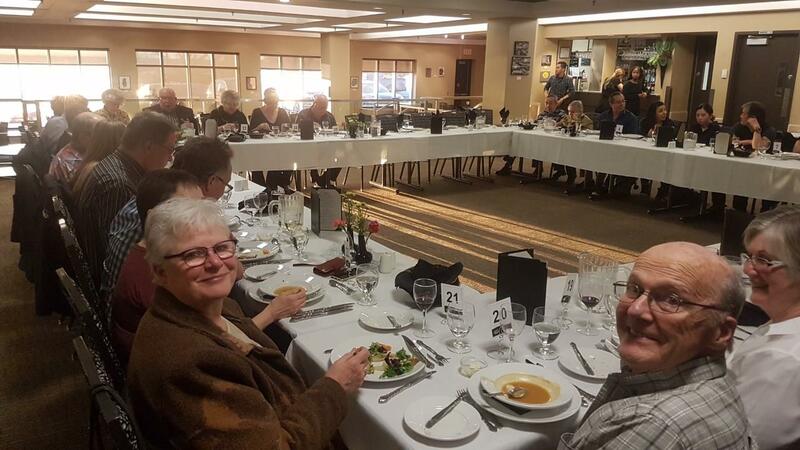 Spouses and friends of the drivers flew down and stayed for the second week, entirely at their own expense, so as to partake in the celebrations that the Mexican Rotarians organize to thank Alberta for the gifts that have been driven down. Some Albertans may find this generosity excessive and unnecessary (the writer included) but it is the customs of Mexico that must be respected. The Mexicans are polite and caring people who wish to show their gratitude. 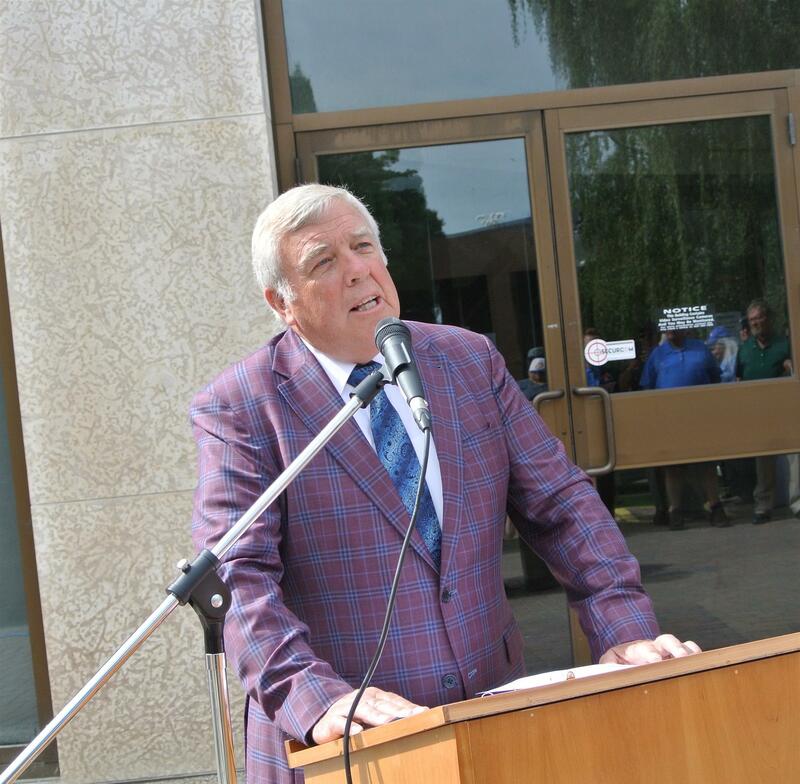 It would be seen as arrogant and offensive if Albertans did not partake. (The writer and his wife have spent many years snow birding in Mazatlan and thus both like and respect the ordinary Mexican). The drivers and ambassadors were divided into four groups so that celebrations in each town could be attended. 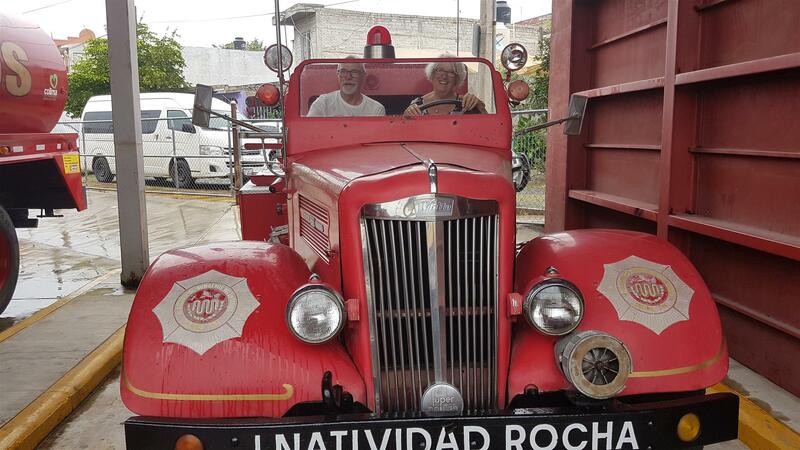 A small group flew via Mexico City to Acayucan near the big port city of Veracruz on the southern Caribbean coast where the fire truck from the MD of Rocky View was being donated. 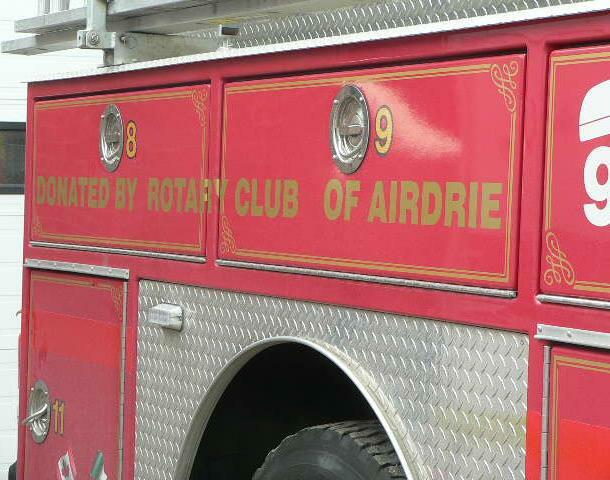 The fire truck had been purchased by the Rotary Club of Airdrie for $5,000 thanks to the efforts of Randy Smith who was the retiring Fire Chief of the MD. 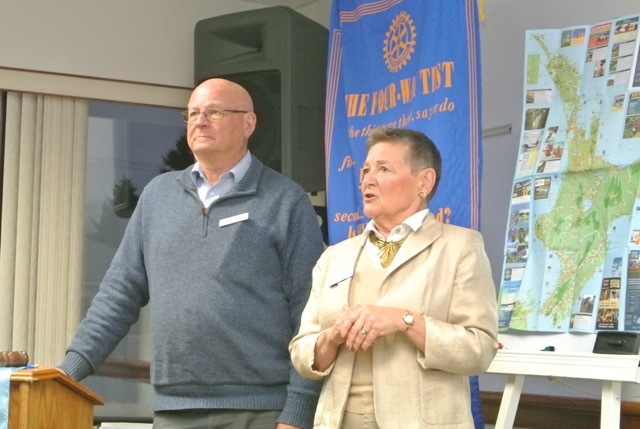 Randy, his wife, Donna, Karl Samuels and Jim Campbell formed this group, all of whom were hosted by the Rotary Club of Acayucan. 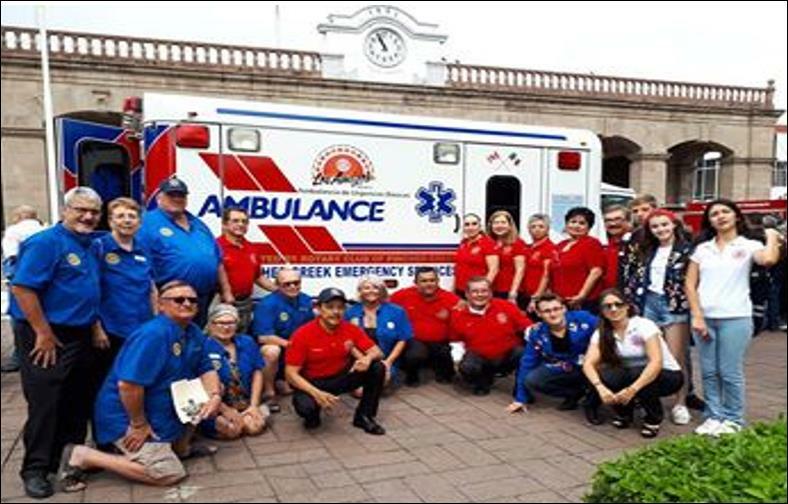 This was going to be a busy and memorable day for our group of six drivers and ambassadors who were visiting Tepic to handover the ambulance to the municipality of Tepic. First stop an invitation to the Municipality Building to meet El President in his office. Greetings and pleasantries exchanged the group was escorted outside to the Plaza where the handover was going to take place. The canopy was quickly filled and the top table guests and speakers took their places facing the crowd. 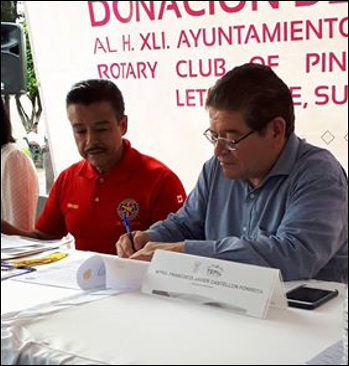 The highlight of the ceremony was the signing of the contract between the Rotary Club of Tepic Nayar and the President of the Municipality. This binding agreement ensures that the Municipality accepts the responsibility of keeping the vehicle well maintained and used to it fullest extent for the benefit of the people of Tepic. The handing over of the keys of the Ambulance was the next step in the proceedings. Lynne Brasnett was chosen from the group to do this. 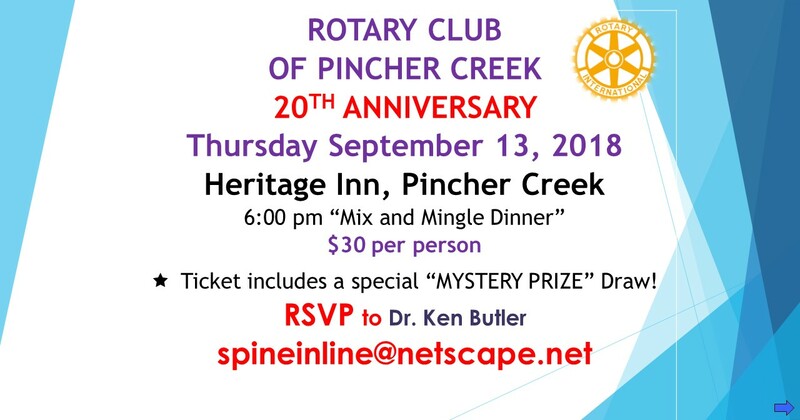 It was special for Lynn to do this because the vehicle had been donated by the community of Pincher Creek and sponsored by Lynn’s Rotary Club. 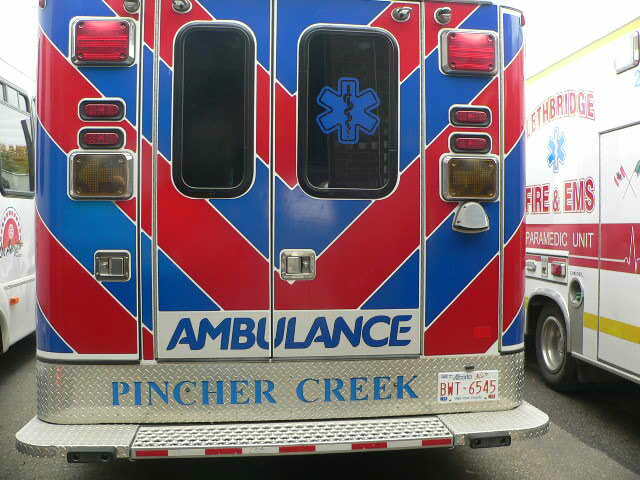 Lynn is also a paramedic in Pincher Creek and had driven the vehicle during its service in that community. Speeches were made, banners presented and gifts were exchanged. Finally, the photo shoot to mark the end of the official occasion. As an added attraction the group was treated to a tour of the Tepic Fire Hall. Here the group enjoyed the antics of the Exchange Students who gleefully enjoyed trying the firemen’s emergency exit pole. A special thanks to our great Rotary hosts in Tepic! 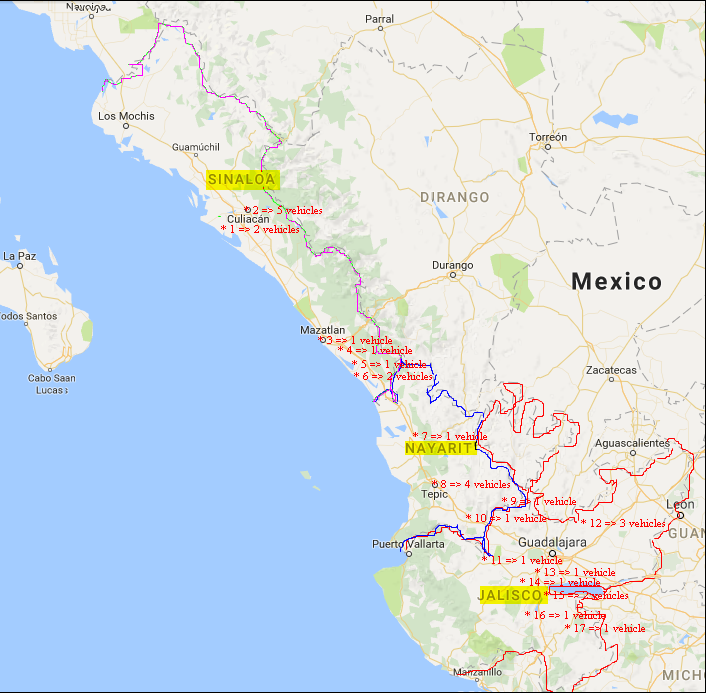 To deliver the handi-bus to Mazanillo involved a wearing four-day trip beginning with, on the first day, an eleven hour drive to Colima which is the capital city of Colima state. 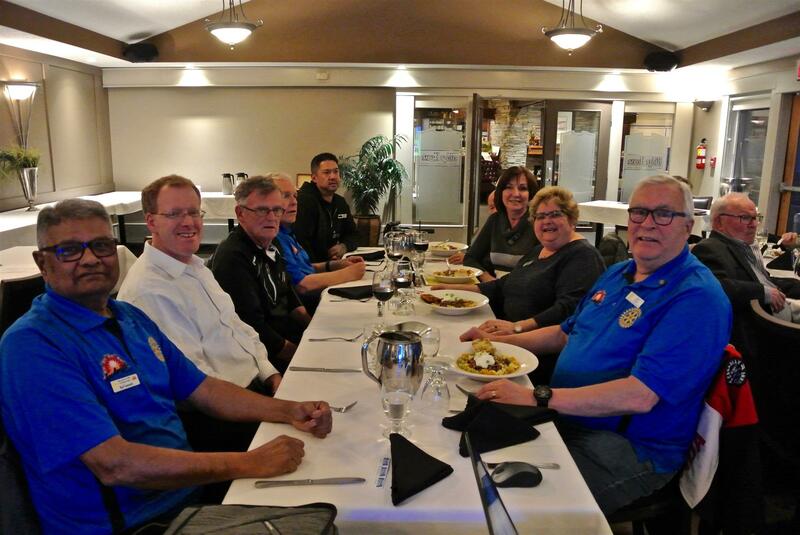 The Rotary Club of Colima treated the group to supper as their guests. 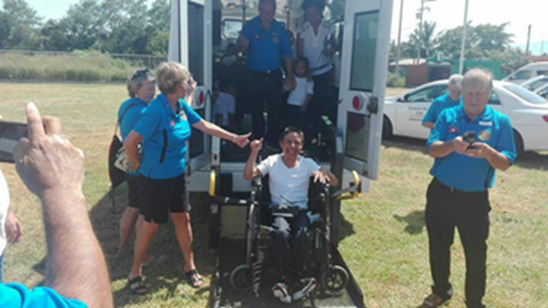 Then it was back on the bus for a one-hour drive to Mazanillo where the handi-bus from Brooks was formally handed over to the Helen Keller School for the Disabled. Then a one hour return journey to Colima and the hotel. The morning of the second day was profitably spent meeting with the Under-Secretary of the Minister of Social Development for the State of Colima, learning about the lack of education and the problems caused by poverty combined with the State’s efforts to alleviate these. 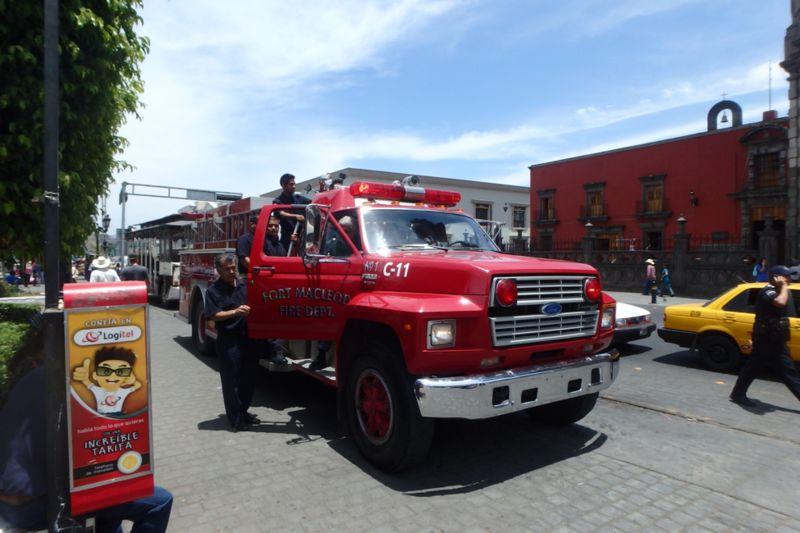 In the afternoon the group visited three fire stations in the City of Mazanillo which just happens to be Mexico’s busiest port on its Pacific coast with a population of around 190,000 people. These fire stations are ill equipped so the group were able to ascertain their requirements and to hear their wishes for the future. Despite Mazanillo being such a busy port, it lacks a Rotary Club so the handibus will be supervised by the Rotary Club of Colima on behalf of the Los Amigos project. Again, supper as guests of the Rotary Club of Colima. After breakfast on the third day the group visited a second school for the disabled in Coquimatlán which received a handibus last year and is still working just fine. Then there was a tour of a local village by the Department of Tourism followed by a visit to a nearby museum featuring a highly revered local artist. 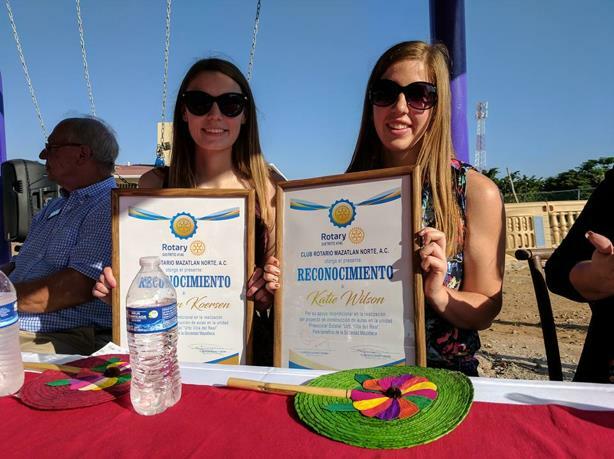 That evening the group attended the regular weekly meeting of their hosting club, the Rotary Club of Colima and exchanged banners. The fourth day was spent travelling back to Mazatlan. 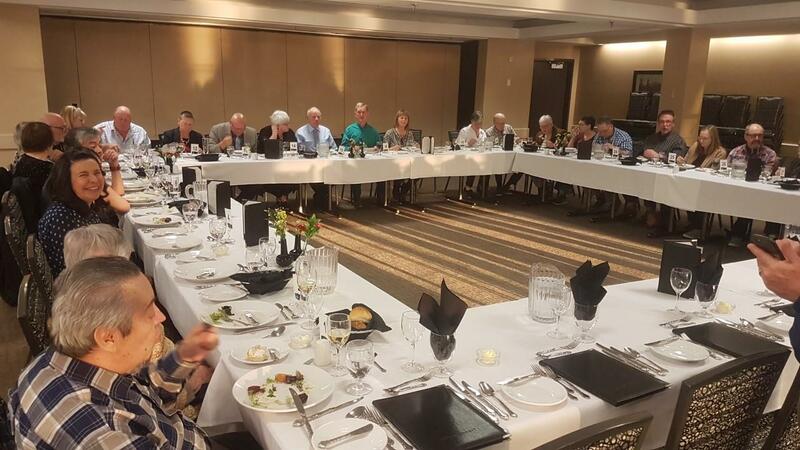 Sunday 14 October 2018 – The group travelled by van to Culiacán, where the local Rotarians held a welcoming barbeque at the hotel. Monday 15 October 2018 – Presentation of an ambulance to DIF (Welfare Dept.) Sinaloa. 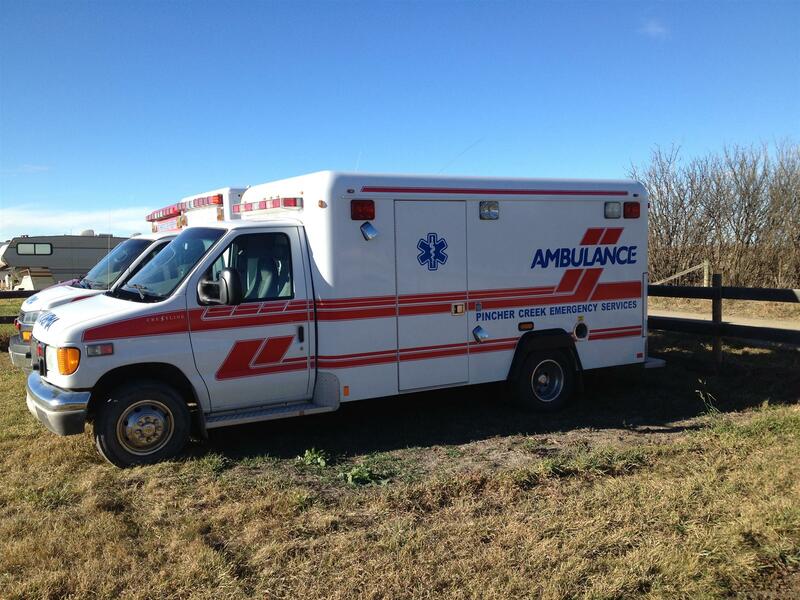 The ambulance will be part of a DIF project to provide services to indigenous farm works. These are the very poorest who come to the Culiacan area to find work in the fields, at the dump, etc. 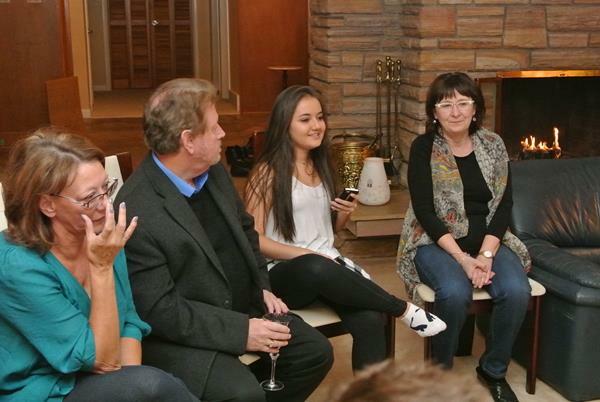 The project is the brain child of Rosy, the wife of the Sinaloa State Governor, who attended the presentation. Also, in attendance was the CAO for DIF (Welfare Dept.) in Sinaloa. 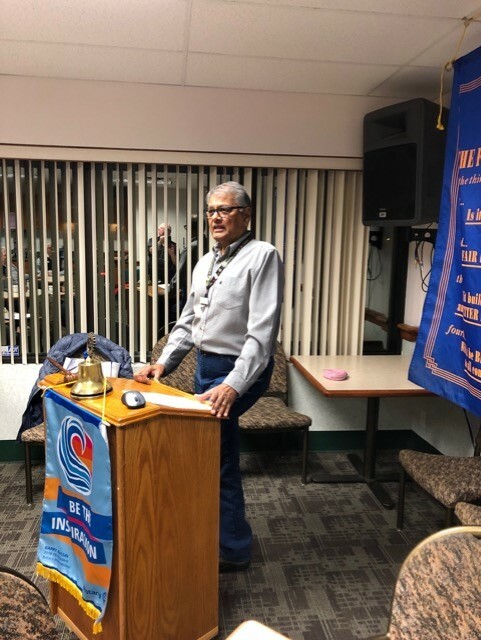 Pepesán (the lead Mexican Rotarian) gave a speech to the crowd explaining the Los Amigos project and how such projects in Mexico are vetted by Mexican Rotarians there to make sure that the vehicles brought to Mexico will be used. 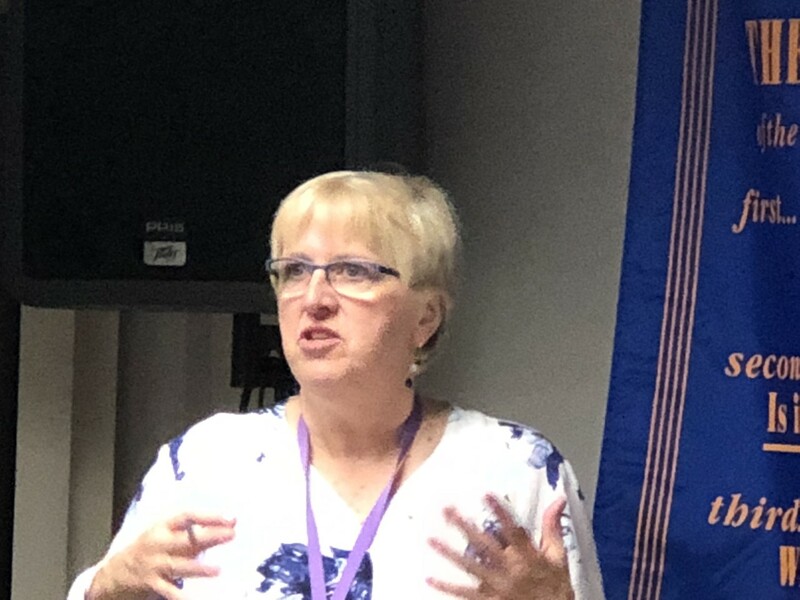 Rosy, the Governor’s wife, was most impressed with the Los Amigos Project and made a point of speaking to Berga and others on the team to thank them for the work they are doing. The presentation was followed by a tour of a rehabilitation facility operated by DIF. Services are provided to all citizens, adults to children. Payment for services is based upon income and is free to those who cannot pay. 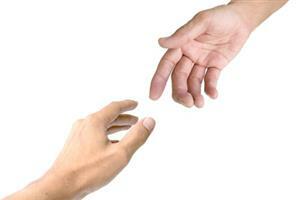 Services include physical therapies and life skills coaching as well as psychological support. Some halls were lined with art work done by clients of the facility. 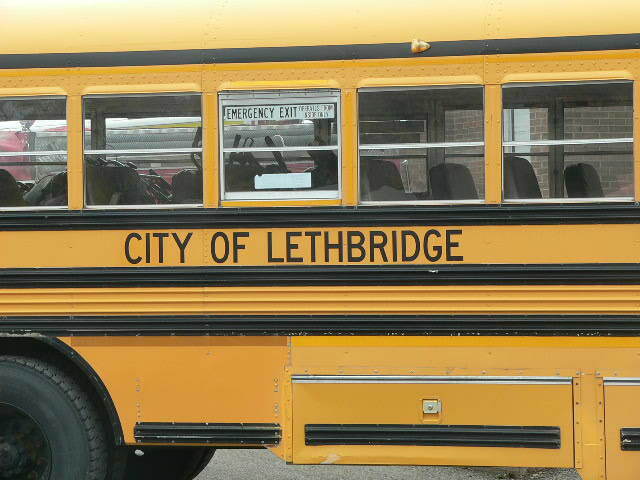 Tuesday 16 October 2018 – Presentation of school bus at City Hall. 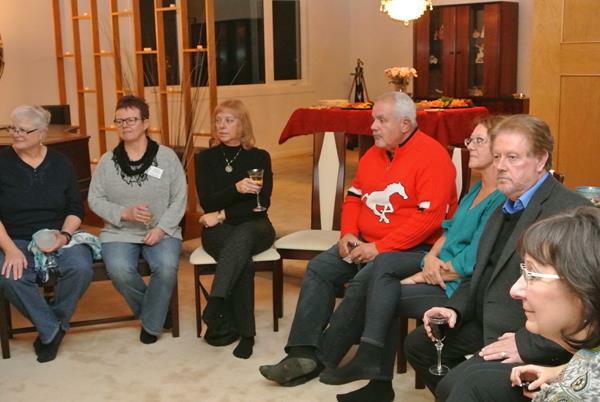 The City Treasurer attended for the Mayor who was unable to attend. The head of the Institute receiving the bus was also present. The bus will be used by the Institute to transport students from the University out to do community service work with the very poor and to bring the poor into the City for various treatment facilities and/or education. Following this presentation, we toured the MIA, an interactive “museum” designed to teach the public, particularly school children, about addictions, how drugs and alcohol affect the body and the impact this has on the lives of those around the addict and society in general. It was very dynamic. It was an exploration of how and why to say “No” to drugs, including alcohol. Also, a section devoted to teaching how to develop good habits such as exercise and healthy eating. 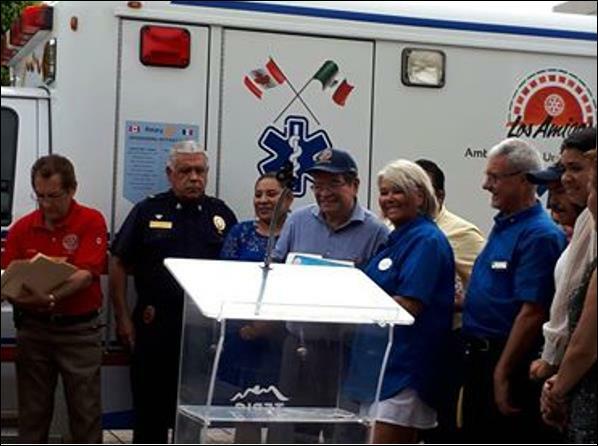 Wednesday 17 October 2018 – Presentation of ambulance to Culiacan Civic Hospital. In attendance was the Director of Medicine for the hospital and other dignitaries. The hospital has 130 resident doctors, including several specialists. They provide medical care to the poor. Patients pay only what they can afford, may be a little, may be a lot, or may be nothing at all. 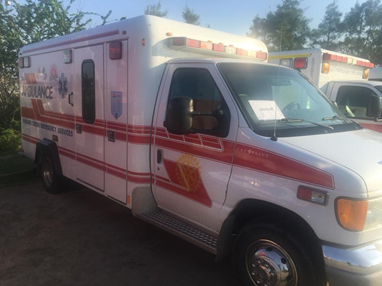 This ambulance will be used to provide outreach services to the very poor migrant farmers living on the outskirts of Culiacan. The medical care will go out to them and transport patients back into the hospital when needed. The Medical Director in his speech to us emphasized that this ambulance will make a huge difference in bringing care to the very poor and will save lives. Following the presentation, we were able to see the ambulance donated to this hospital three years ago. It originally came from Cardston and had just received a new paint job. 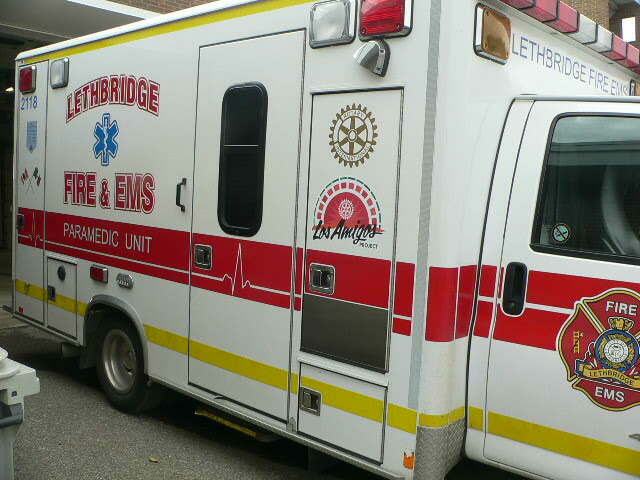 Rotary emblems had been replaced on the ambulance as well. Thursday 18 October 2018 – The group went by bus to El Rosario where we attended the Cultural School for the presentation of music instruments. They learned that the program run by this school is actually after regular school hours. A few of the children are able go to regular schools beforehand. 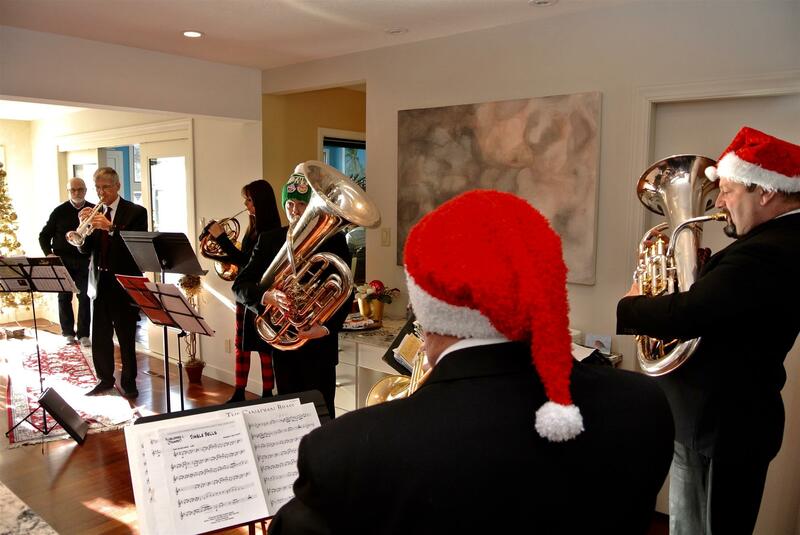 The majority were children that have come off the streets to take part in the music program. 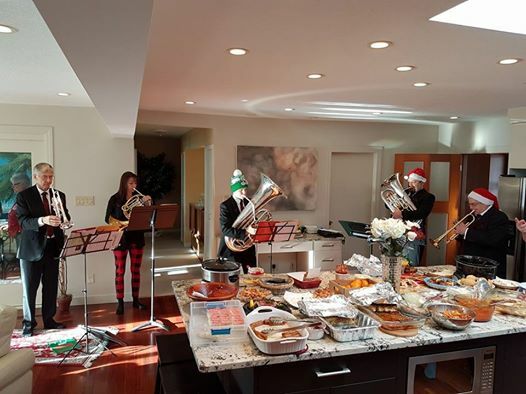 As a result, they are getting not only the opportunity to participate in the music program, but also basic education skills such as reading and math. These are not the children of wealthy parents, so no school uniforms here. Of the instruments donated by Los Amigos, several of the larger instruments donated by Los Amigos will remain with the program in El Rosario, but the rest will be used to start a second music program in another location. 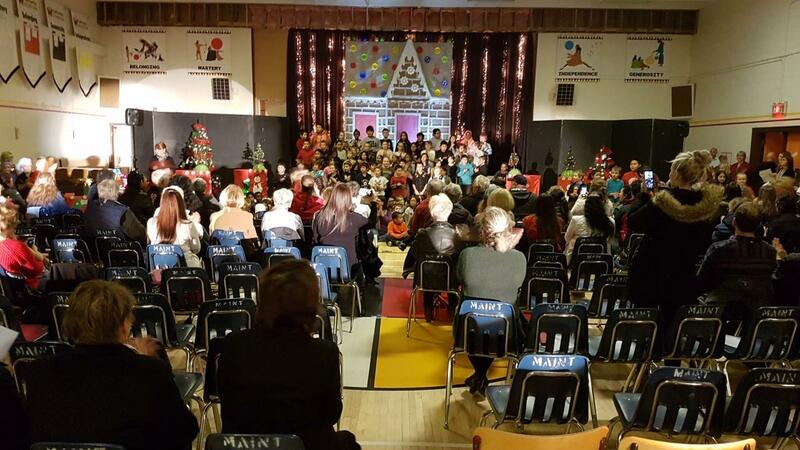 The group were impressed by the dedication of the music teachers in bringing this program to the students of every age group all participating together. 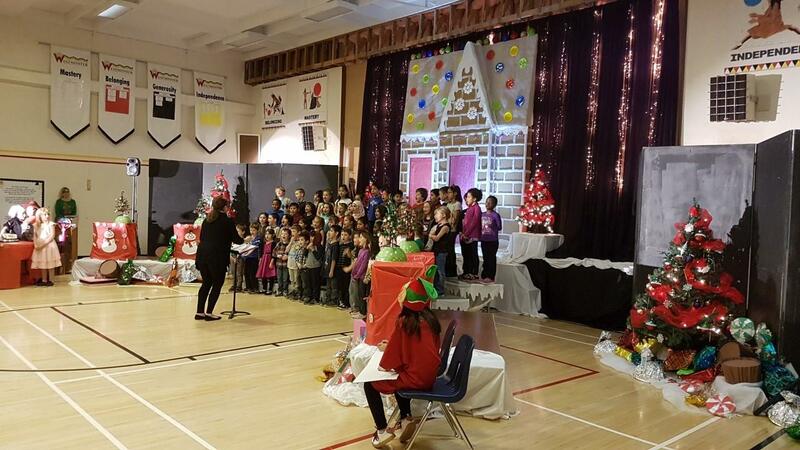 The program also included a choral ensemble. The program director emphasized that this music program was keeping these kids off the street and off drugs. Upon return there was one free day for both the drivers and ambassadors to relax. The following evening there was held in Mazatlan a big banquet of thanks. Again, more wonderful Mexican hospitality. Next day, sadly, all Albertans had to fly back ready to face our winter. All 6 vehicles have been checked over. All 6 have been cleaned, washed and shined. All decals have been applied. All are waiting to be loaded with cargo before the October 4th departure following the big celebration send off breakfast. This is the culmination of countless hours of negotiation, form filling, verification, translation, labelling, cross checking and finally loading. Over 800 pages of forms has been sent to Mexico City seeking duty free importation of the vehicles and cargo. 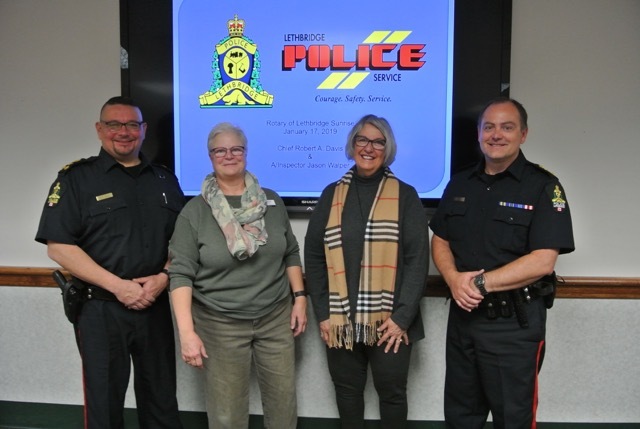 All 6 vehicles were presented to our local media at a luncheon event hosted by Lethbridge’s Fire department at their 5th Avenue North station on Wednesday, September 26. Most of the volunteer drivers were also present wondering quite what they had let themselves into. From past experience they will see lots of delightful scenery, meet fascinating people from all parts of both American and Mexican society plus see miles and miles of tarmac. Note the cargo loaded inside. Another Club has joined the convoy! And look! Yet another Club has joined the convoy. We are growing. 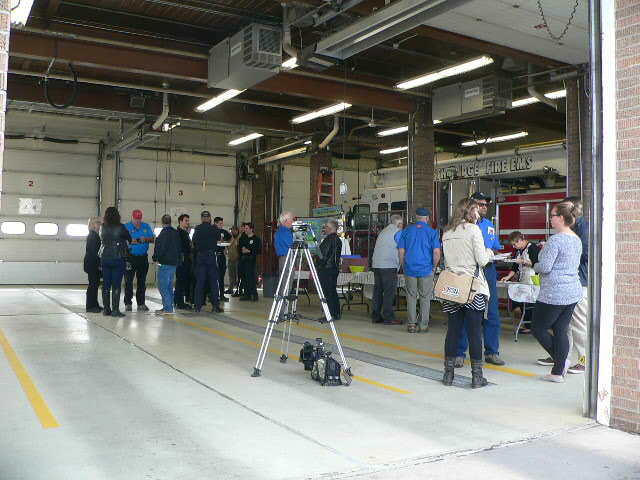 The local media were invited to inspect, film and photograph all the 6 vehicles in this year’s convoy at a luncheon held in the 5th Street North fire hall. The volunteer drivers explained to the media the origins of the project and it’s effect on many Mexican communities. 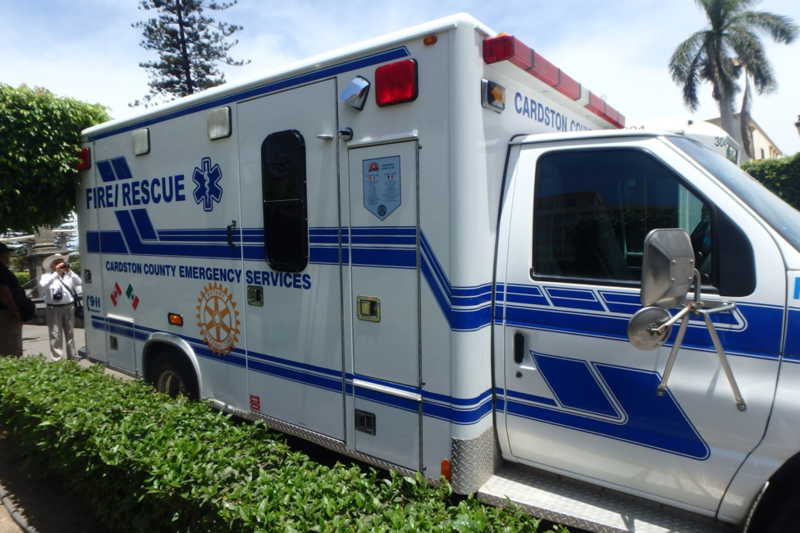 Often these donated vehicles are the first emergency vehicles their town or village has owned. Pincher Creek continues to support the convoy – as it has since Los Amigos began. The Los Amigos project consists of two very separate but complimentary parts. 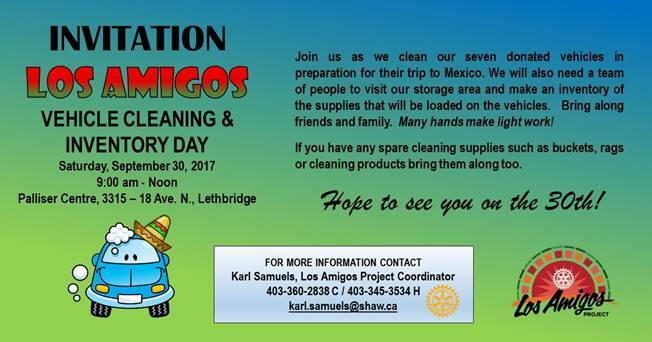 Rotarians in Southern Alberta gather together the vehicles and equipment to be donated and then deliver everything to Mazatlan, Mexico. 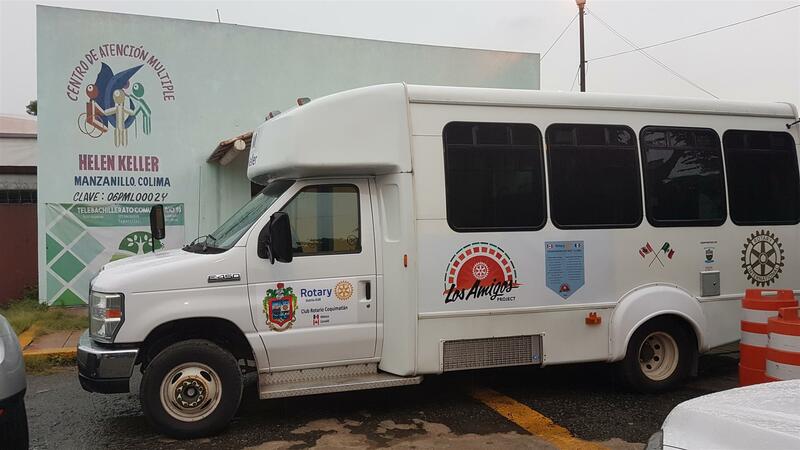 Rotarians in Mazatlan are responsible for deciding which towns the vehicles and equipment will be donated to. These Mazatlan Rotarians are also responsible for ensuring that the donated items continue to be properly and continuously used. 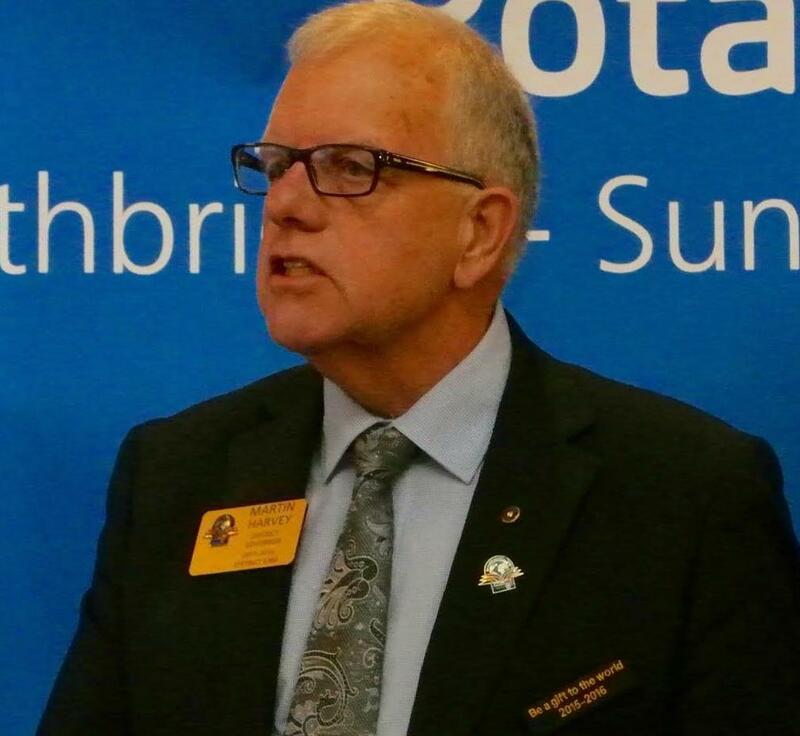 Albertan Rotarians very deliberately stay away from the donation decisions since they do not speak the Spanish language nor do we know the local customs or conditions. 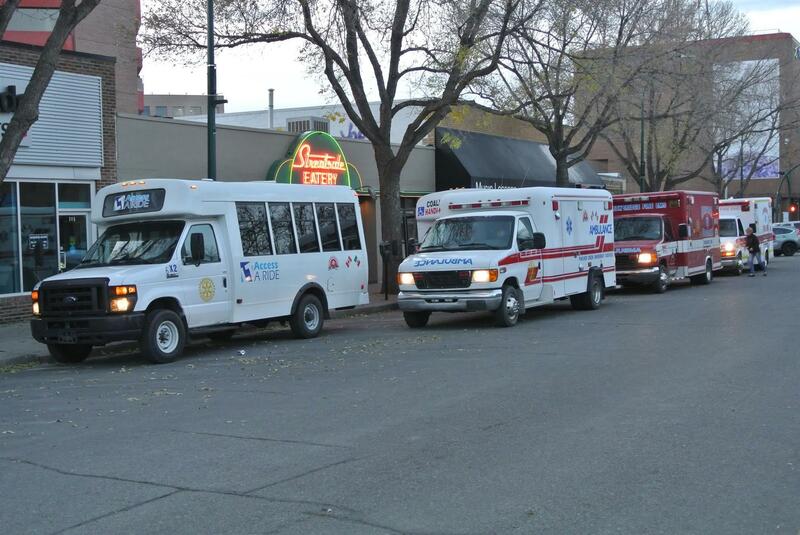 After the October 4th departure breakfast the 6 vehicle convoy drove out of Lethbridge on Highway 4 to Coutts and Sweetgrass. 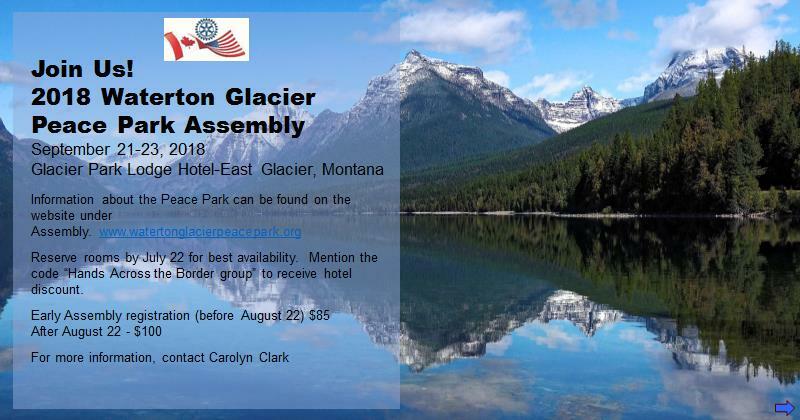 This time the US border formalities were easily dealt with and the convoy rolled over the three Montana passes into Idaho without any problems. Overnighted in Idaho Falls and next day drove on through the scramble of Salt Lake City to Fillmore in Utah. There the regular evening meeting of the drivers was held in the open air which attracted other curious travellers who seemed impressed by Rotary’s efforts. Next day the convoy drove through Las Vegas, used the new by-pass that leads straight onto the big bridge over the Colorado Canyon and into Kingman, AZ. 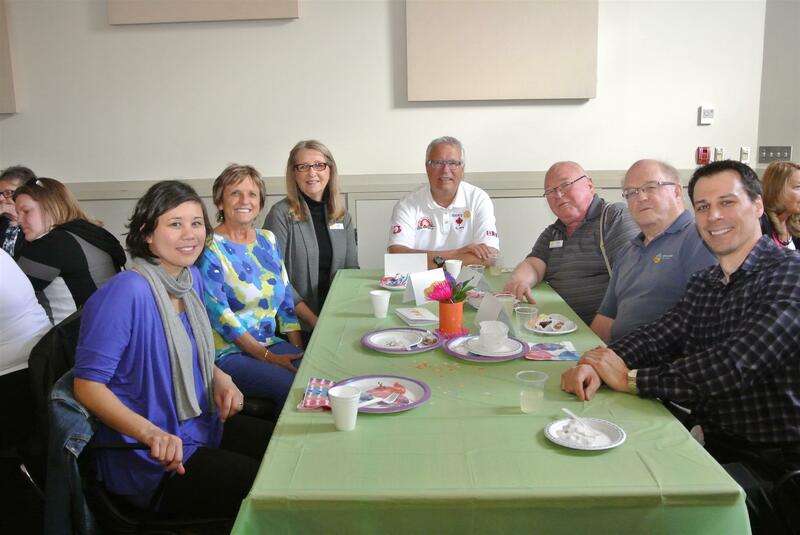 They were guests of Kingman’s Route 66 Rotary Club at their big Oktoberfest fund raiser. The drivers donated $150 to the Oktoberfest fund. 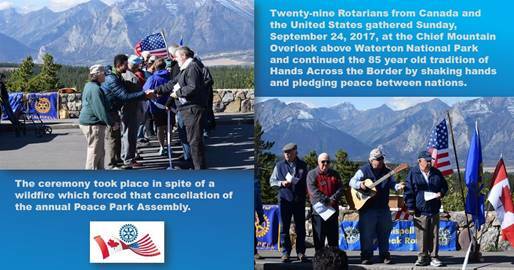 After the regular morning vehicle checks the convoy headed on south through Phoenix and Tucson to Nogales, AZ, where they met up with Pepesán (the lead Mexican Rotarian) and Omar (a Mazatlan Rotarian). These two vital Mexican Rotarians traveled from Mazatlan just to ensure the convoy cleared the Mexican border checks and formalities with the minimum of trouble. Their magic touch clearly worked since the convoy was cleared in 3 hours, which is a record. Overnighting in Nogales, Mexico gave time for the drivers to relax in a comfortable hotel just outside of the border control area. The following day it was a short drive to the visa station at Km 21 were it took the drivers the usual one hour to obtain tourist visas. Then it was roll on south along fast Mexican toll road Route 15D to Navojoa and an overnight stay in a comfortable hotel with a warm pool! Great relaxation. Next day in the late afternoon the convoy drove into Mazatlan where the vehicles were parked. 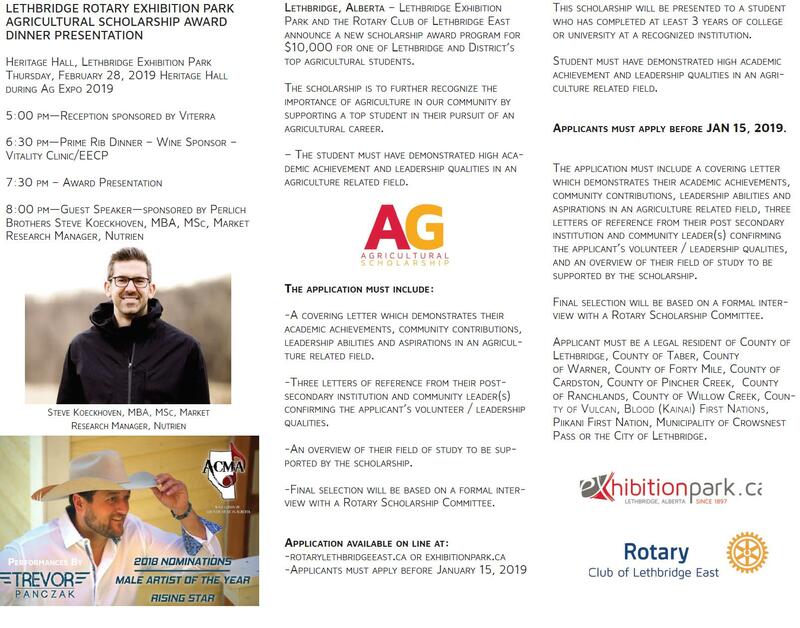 That completed the first week and the obligations of the Albertan part of the Los Amigos project which is very international as you can tell.ce our winter. Thursday, October 4, was Departure Day for the 2018 convoy heading south to Mazatlan, Mexico. 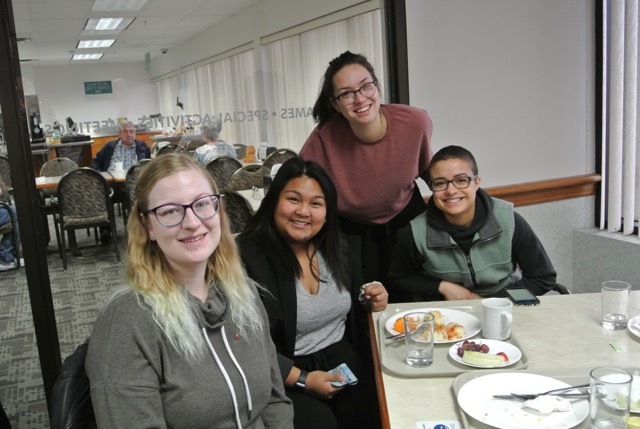 A 7.00 am celebration breakfast was held in the Nord-Bridge Center with some 60 people present. This was the opportunity to thank donors to Los Amigos who had supplied vehicle maintenance, decals, coolers, tools, etc. 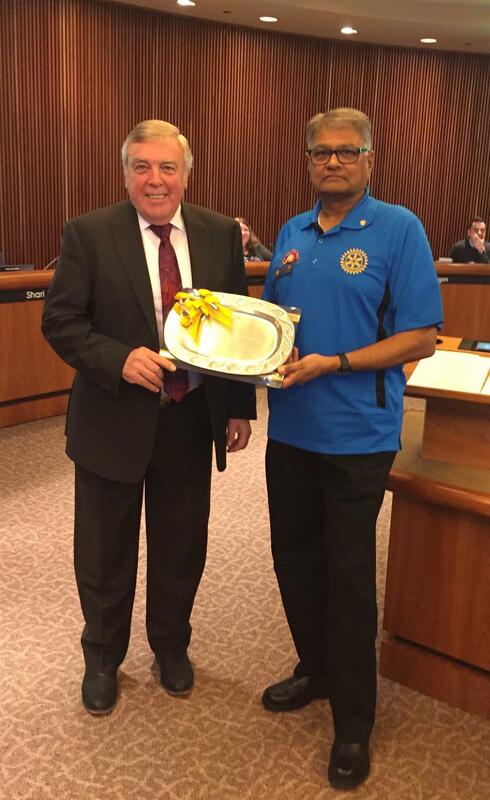 Mayor Bob Tarleck (Mayor of Lethbridge from 2001 to 2010) was thanked for his faith in Rotary. 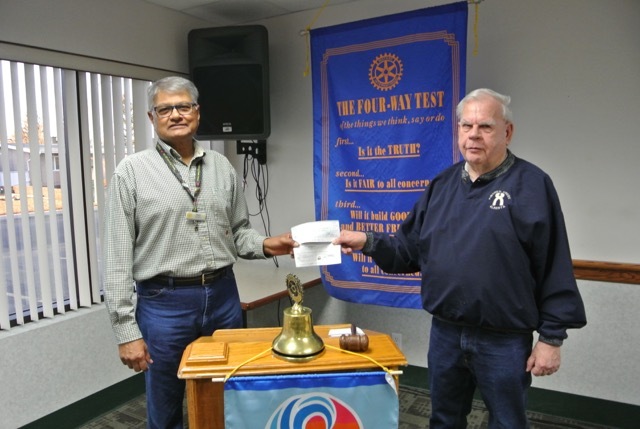 It was his faith in Rotary that basically began the Los Amigos project in 2010. 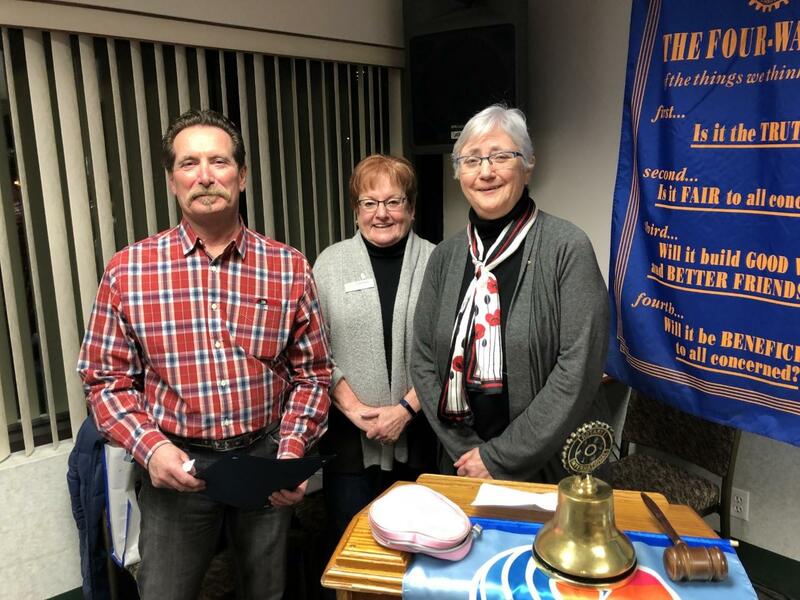 Don McInnis and Richard Tamkin asked him and the Lethbridge City Council for one retired school bus to take wheelchairs and walkers down to Mazatlan and, to Rotary’s surprise and delight, he and the City Council gave Rotary three retired school buses. 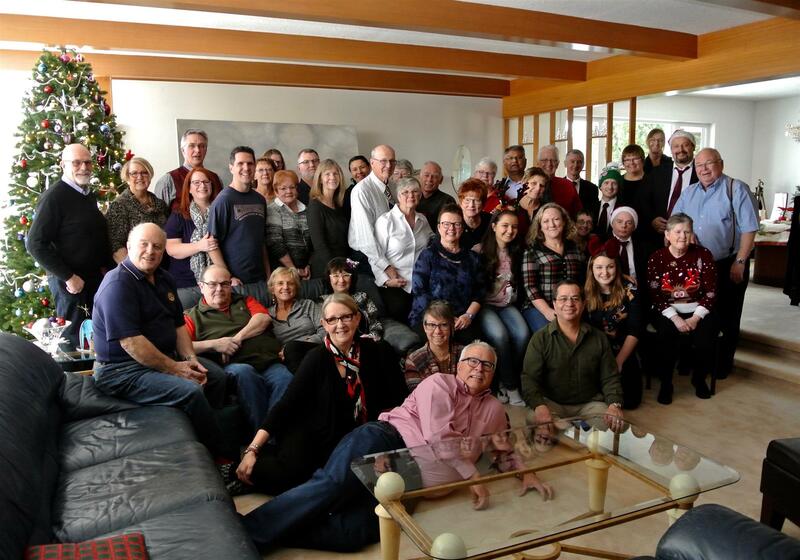 This enlarged gift presented an unexpected (but pleasant) problem which Berga Moen, Judy Reed, Don McInnis, Jim Campbell and Wayne Stewart were left to solve while Richard Tamkin and his wife, Di, drove south to spend 6 months snow birding in Mazatlan. 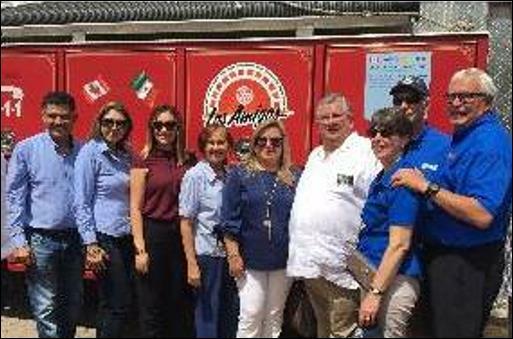 Thanks to the invaluable assistance freely given by Rotarians from the Grand Prairie area the three buses were safely delivered to Mazatlan. 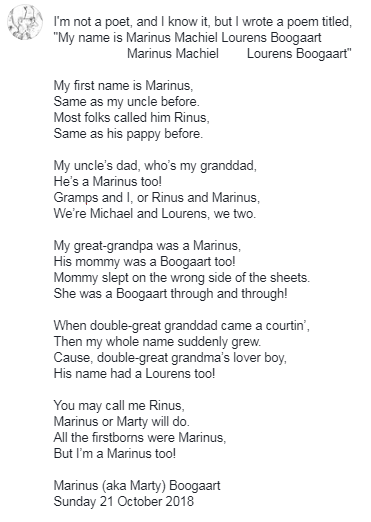 It soon became apparent that we Lethbridgeians had a lot to learn about border formalities. Berga Moen is seen here thanking Karley Lewis, the band teacher at Gilbert Pattison Middle School. 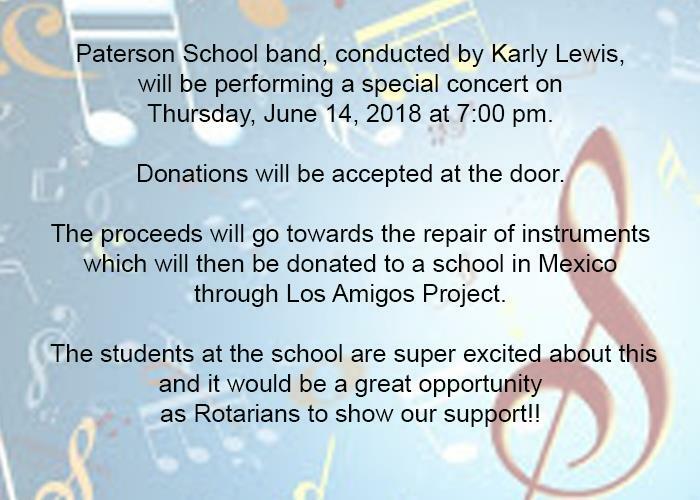 Karley had found many, many musical instruments which were then donated to and driven down for Mazatlan schools to enjoy. Travis Conrad, of Wilson Middle School was likewise thanked for repairing these instruments and for bringing them back to good working order so that Mazatlan’s students could enjoy them. The Mexican health inspectors at the border were particularly pleased that Travis had carefully replaced all the mouth pieces with brand new ones. Travis had wisely anticipated this potential problem. 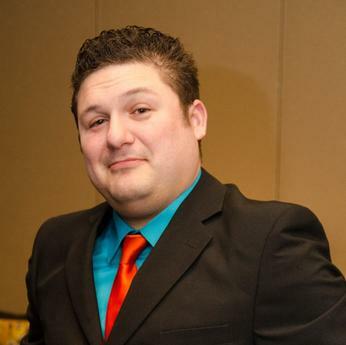 Karl Samuels, the Los Amigos project Coordinator, (a.k.a. 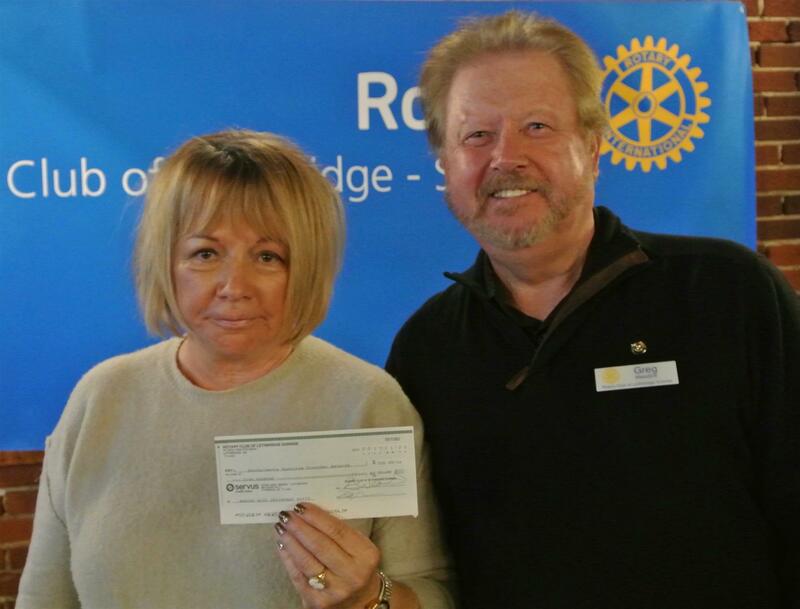 The Boss or “El Jefe”) is seen here thanking Val Bhoeme of the Rotary Club of Raymond for a $2,500 cheque which will be added to the Los Amigos project’s funds. Connors’s Fleet Services were especially thanked for all their valuable mechanical checks on each of the vehicles in the convoy. After the breakfast the drivers loaded up, said their farewells and drove off almost on time. My three year term as the coordinator for the Los Amigos project will be over on December 31st, 2019. This is a volunteer position that requires a significant number of hours and some organizational expertise. It is both challenging and rewarding. I would like to have the incoming coordinator in place by January 1st 2019. 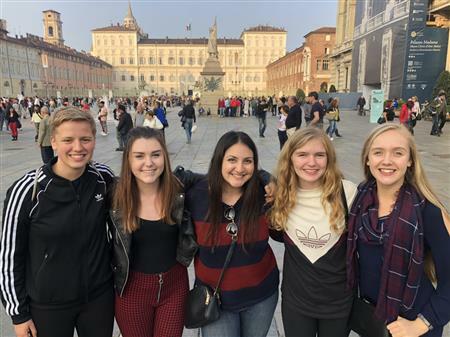 This would allow the incoming coordinator to shadow me for a year and learn more about the inner workings of the project and the people on the Los Amigos team who provide support and volunteer hours to the planning for each trip. 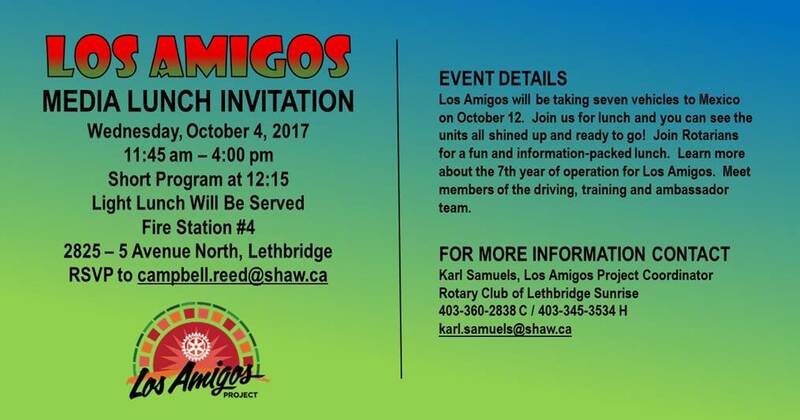 Los Amigos is truly a Southern Alberta project with multiple Clubs involved. 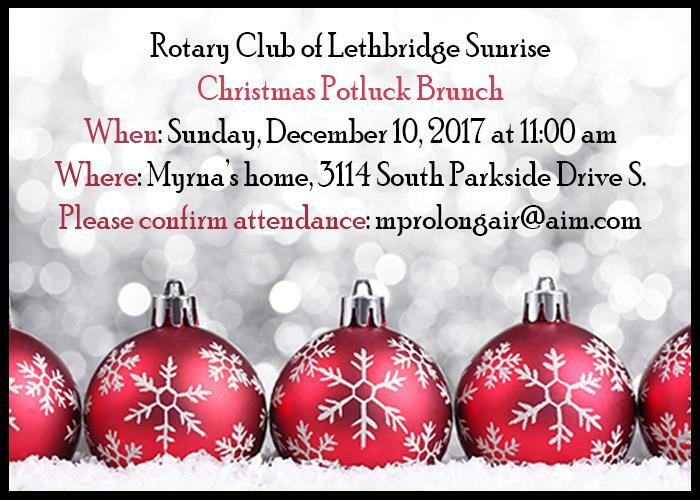 Any interested Rotarians please forward your name to me, by December 15, 2018. 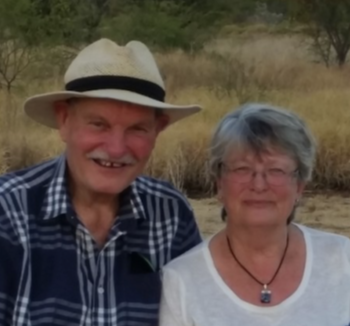 Our condolences go out to Don Robb and his family, with the passing of his wife Patricia. Greetings from Vietnam! My husband, Bill, and I are serving an eighteen month mission for our church in Hanoi, Vietnam. We’ve been here for three weeks, so we’re still a bit shell-shocked. We’ve been struggling to learn at least some of the language, and that’s a trick! Just when I think I’ve got a phrase mastered, I try it out on some poor unsuspecting Vietnamese person in the elevator. 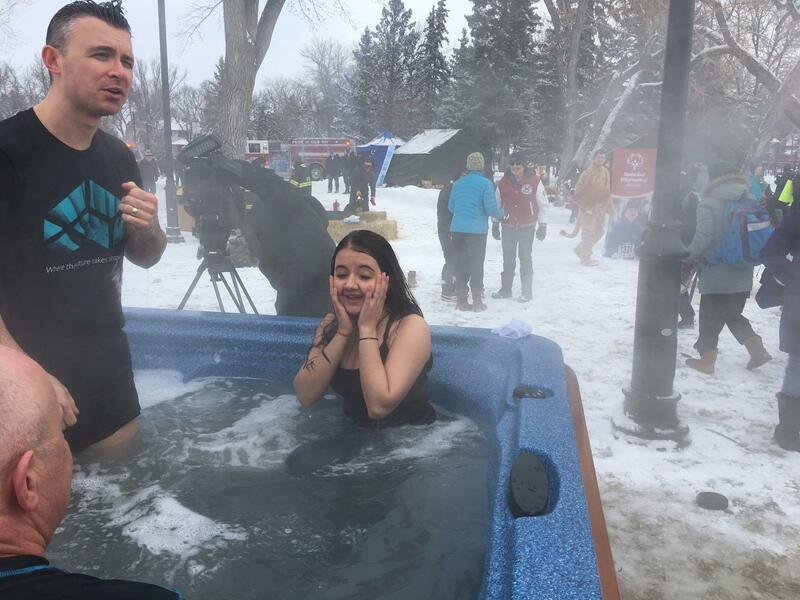 My efforts are met with a look of total puzzlement, followed by a good natured smile, telling me that my awkward attempt didn’t quite hit the mark. Bill and I will be here teaching advanced English classes at Hanoi University of Business and Technology beginning very soon. Until those classes begin, we’re busy adapting to a new world of fabulous food, tangled traffic – there are no lanes, no rules, and no mercy on the streets here. With 8 million people in this bustling city and most of them on scooters, pedestrians are at the bottom of the food chain. You take a deep breath, walk steadily, look straight ahead and pray, taking your life in your hands every time you cross the street because pedestrians NEVER have the right of way – and generous, hard working people. I look back on our days producing The Christmas Carol in aid of the local food banks with great fondness, and I treasure the relationships with you. Your club does selfless, wonderful things for people who need help, and I’ve felt honoured to rub shoulders with such well-meaning, humanitarian minded club members. On this day, Canadian Thanksgiving, I want to express my thanks to you and my gratitude for you and the great memories we’ve shared. of past and present members. 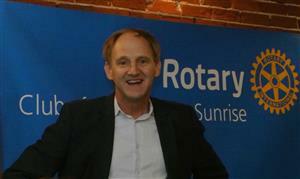 Children's Services, Feedback on Digital Packs funded by Rotary Sunrise. the Los Amigos Send Off. in the Saddle Room in the South Pavillion. Please let Julie know of any special dietary needs. 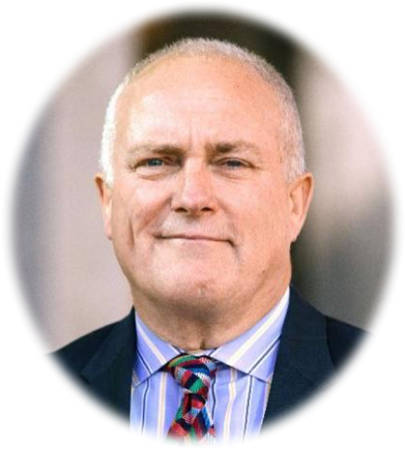 Mike Wutcherl will be presenting on the Exhibition Development plans and then taking everybody on a walking tour. 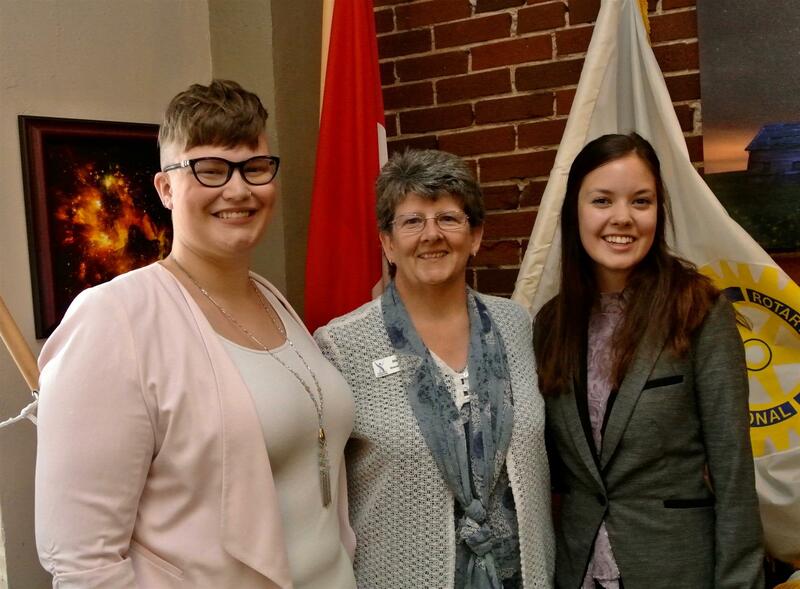 Kim, Karen, and Gwen spoke about youth protection. 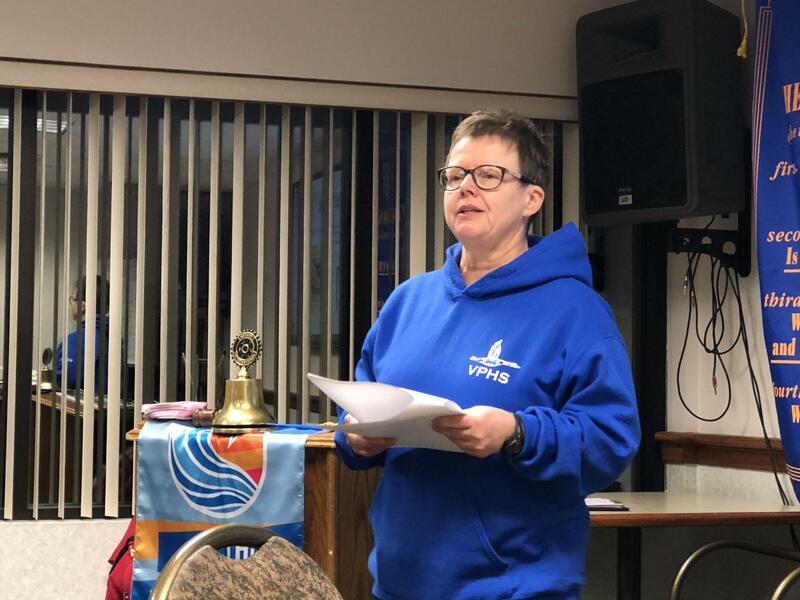 Karen is the chair of District 5360's RYPEN programs. 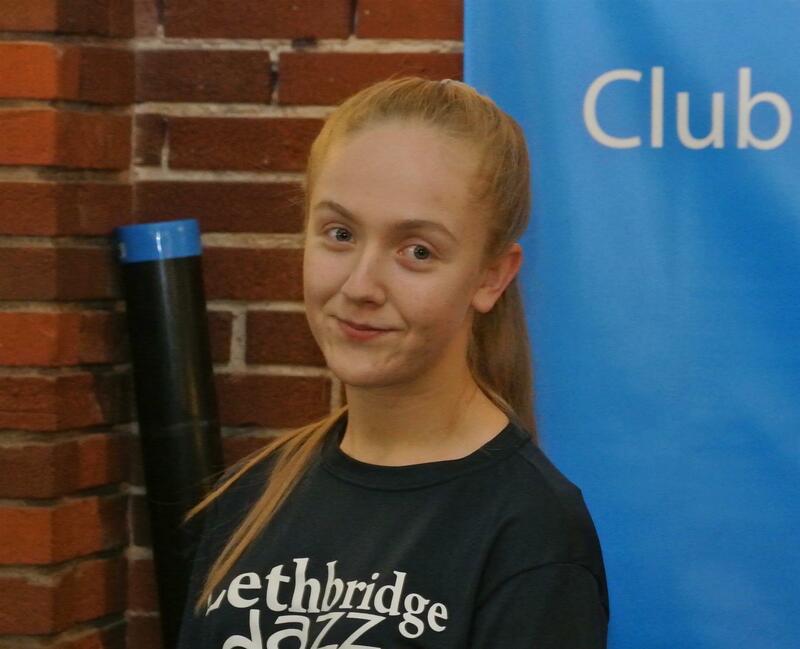 Kim is our club's Youth Service chair. 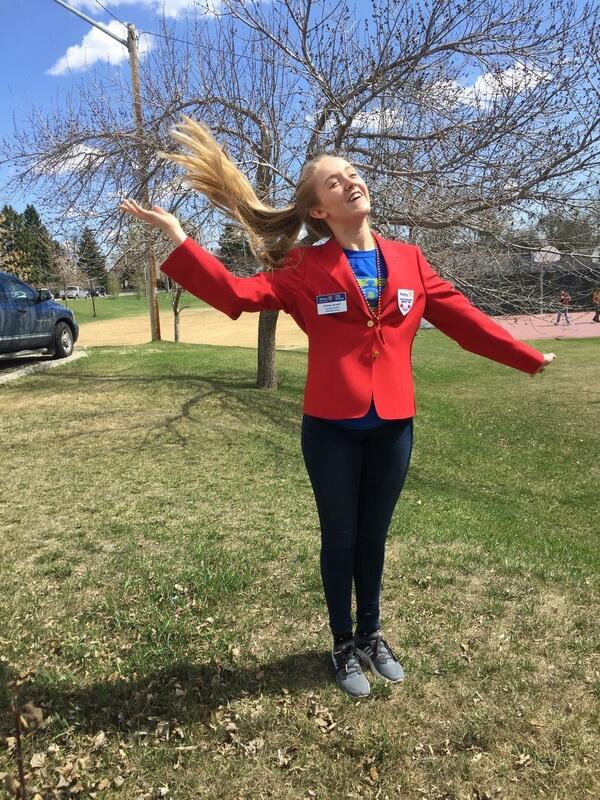 Gwen is our club's Outbound Student coordinator. 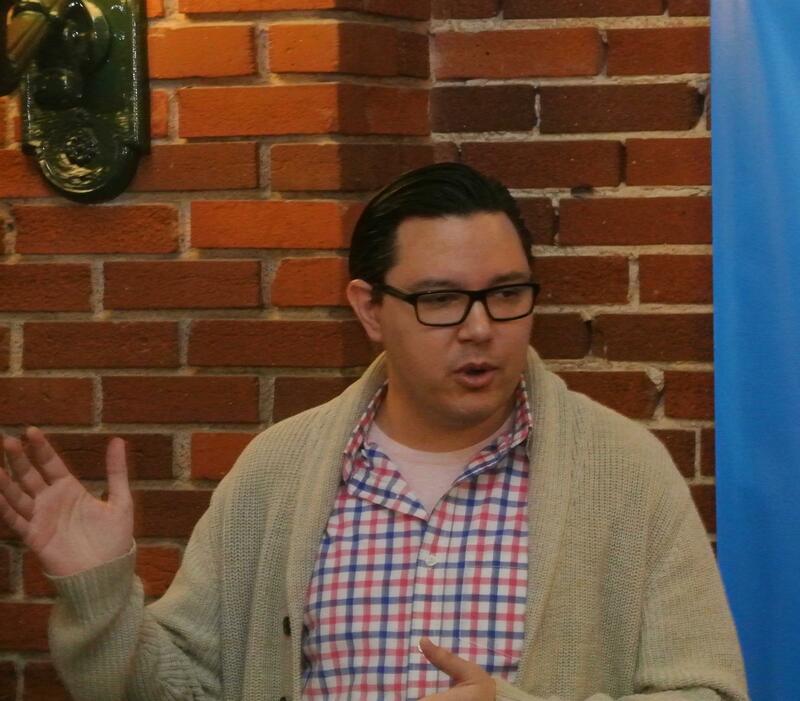 BTW, Felipe is our club's Inbound Student coordinator. He spoke too. 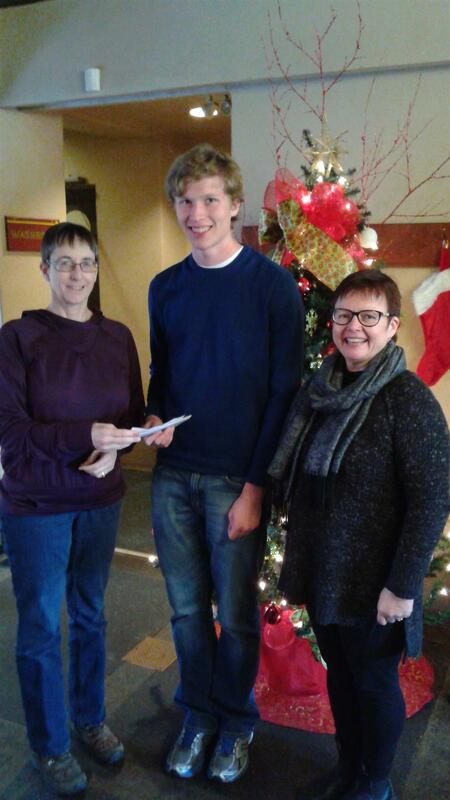 Cheque presentation to Karly Lewis in support of Musical Instruments to Mexico via Los Amigos. at Carol Kundrik's home, 10 Notre Dame Place W.
The Club will provide the burgers, buns, condiments, water, ice, plates and cutlery. Seating will also be provided. Don't forget your beverage of choice! 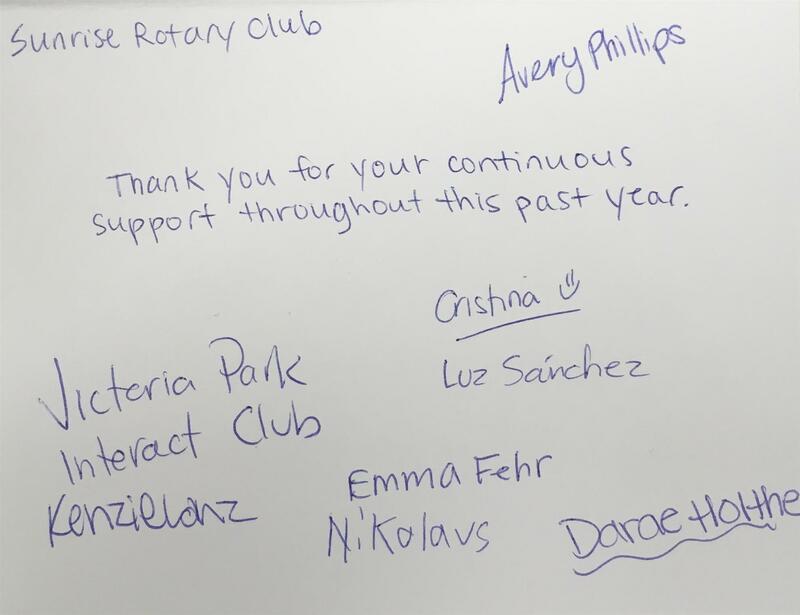 Interact Club Project over the past year and a thank you. 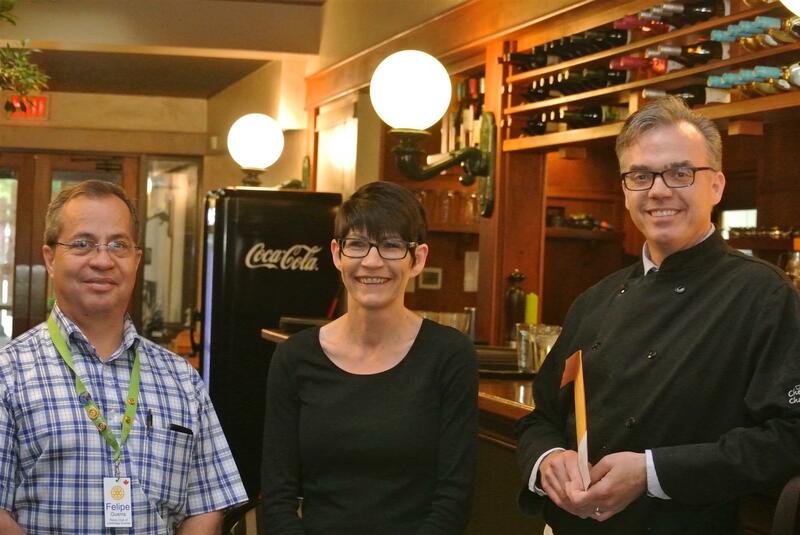 Farewell to Steve Oseen and Carla Trimble at Streetside Eatery. Shared what they have been doing this year. The Dragon Boat Festival and update for this year. Provided updates on government issues. 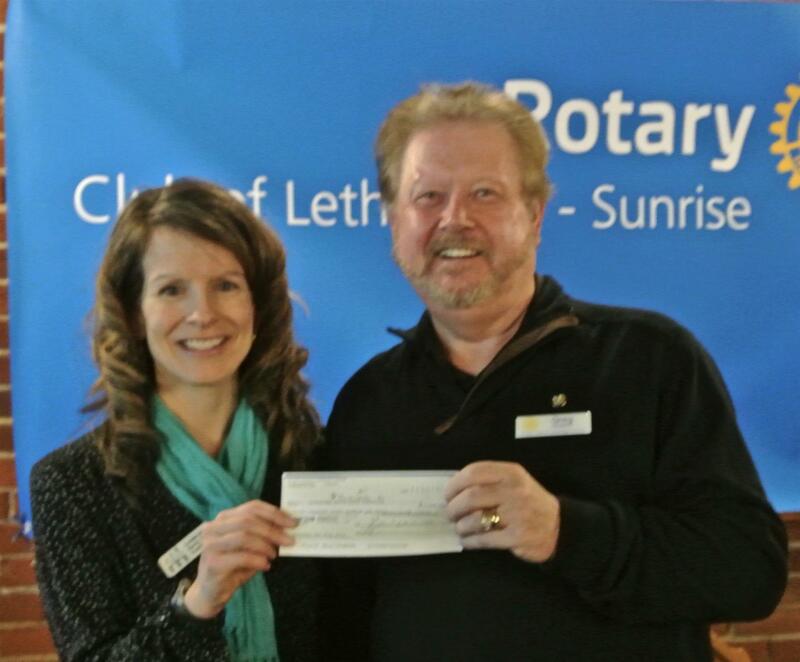 As of today Rotary Club Lethbridge has 34 donations towards your pledge of 100 which is 34% of your pledge. At this time of year we like to see our Partners hitting 33% of their pledge to be on track, you are well on track to meet your pledge. 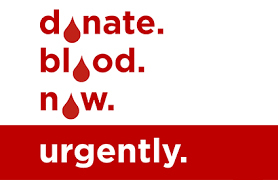 that we need to fill to keep up with patient demand. Pat Killoran visited and encouraged everybody to get involved in the 100 year celebration. 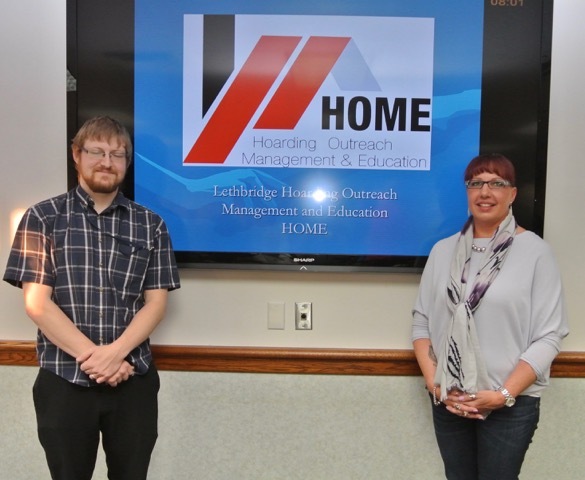 Shared firsthand knowledge about the Safe Site in Lethbridge, how it benefits the clients and the community. shared the work they are doing making affordable filtration devices. Jim Campbell shared his vocational talk. 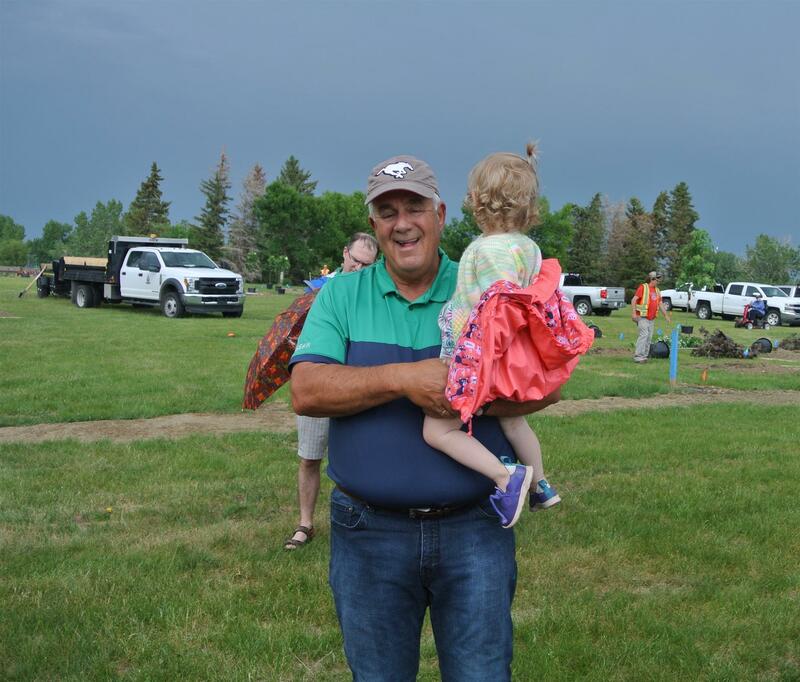 Upon finishing the drive down From Lethbridge to Mazatlan, all of the vehicles were parked overnight in the parking lot of the playground named after Allan Kuechle from Grand Prairie Rotary Club, who started the vehicle convoys 15 years ago. This newsletter reports on four of the vehicle deliveries. 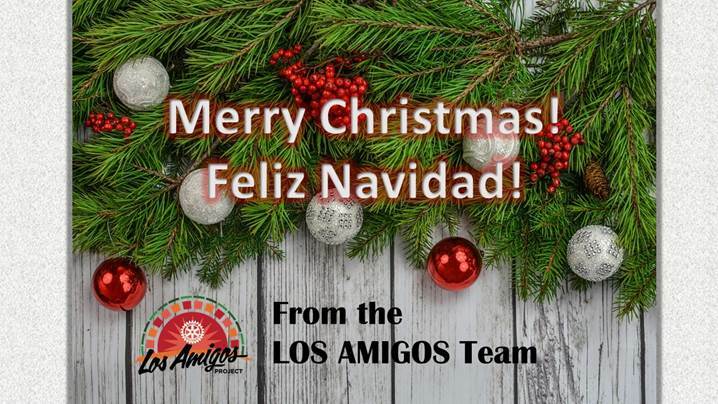 The remaining deliveries will be presented in the next Los Amigos newsletter. 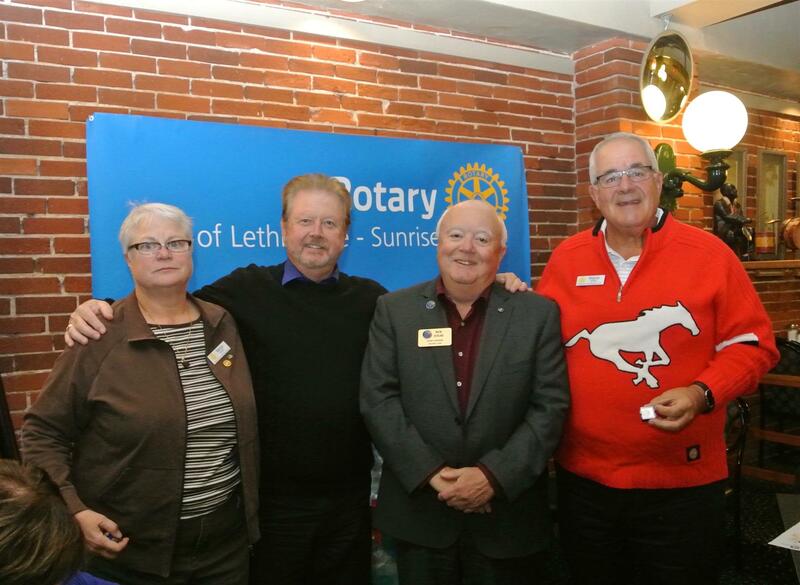 The first week (which is the driving) was the responsibility of Alberta Rotarians and the Los Amigos project. The Rotarians from Mexico responsibility for the second week. After parking the vehicles, the drivers and ambassadors were taken to their hotel. 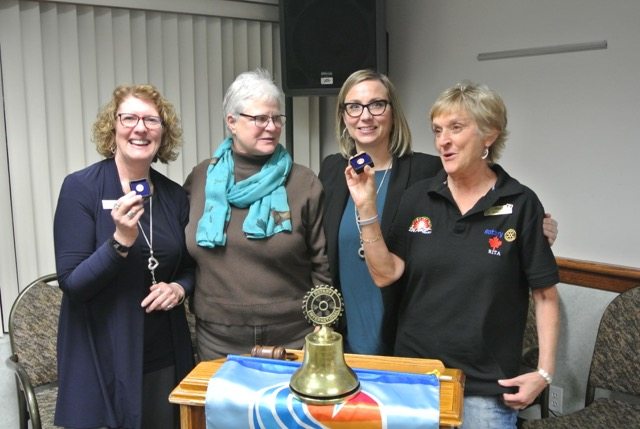 Next day, all Canadian representatives were returned to the park to attend the ceremonial handover of the vehicles' keys to Rotarians from each recipient town. 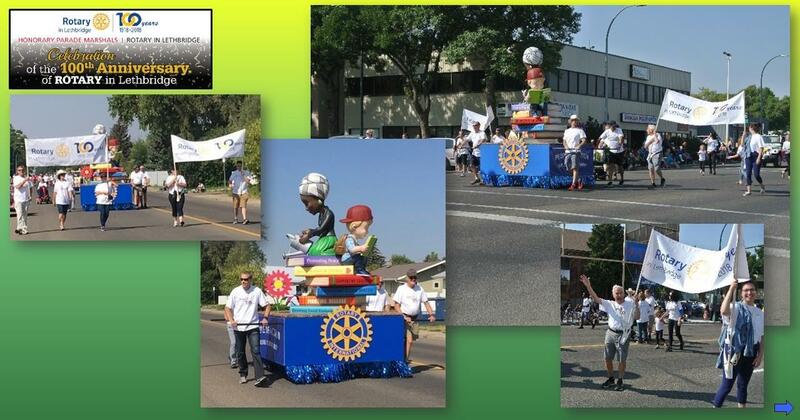 Each town was represented by Rotarians, municipal officials, spouses, et al. Speeches were made with translators on hand. Following the ceremony, the vehicles were driven off to their new homes. In order to formally deliver each vehicle, the drivers and ambassadors were divided into two groups. One group went north, the other went south. 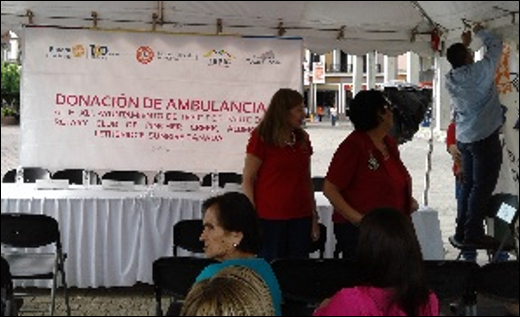 The north group consisted of the firefighters and trainers who drove “their” ambulance to Culiacán. The training team had the opportunity to make this presentation. It was especially touching for the three firefighters from Lethbridge (the Trainers) who had actually driven the ambulance many times while on duty. This handover is covered in the preceding article. The following day (week 2 day 2), the drivers and ambassadors boarded a bus and for a seven hour ride to Guadalajara via the fast toll road. They spent that night in a hill-top hotel. 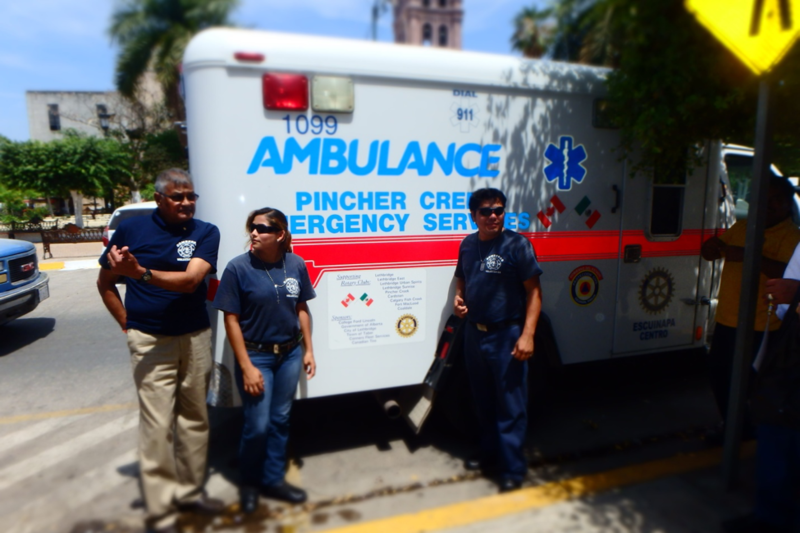 Next day (week 2 day 3) the Pincher Creek ambulance was presented to the Rotary Club of Zacoalco de Torres and handed to the community of Acatlan (population 10,000). It is geographically remote with a lot of surrounding agriculture. 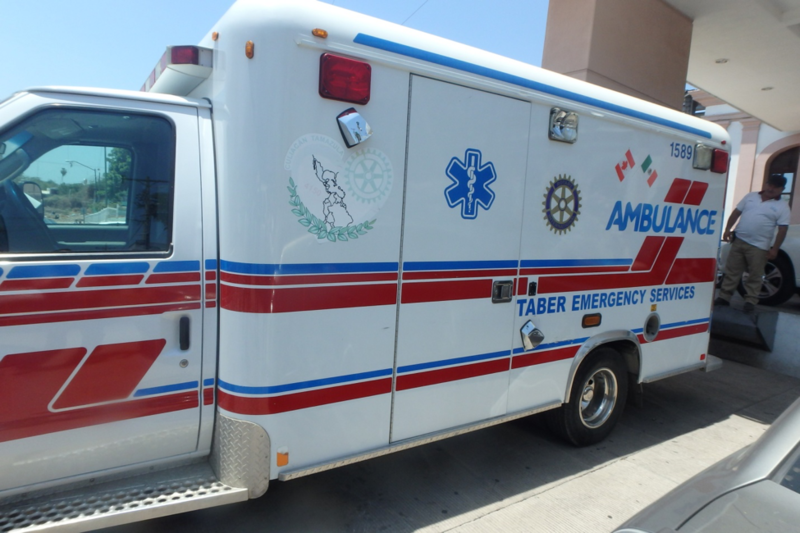 In the past it has taken an ambulance one hour one way to respond to an emergency in Acatlan, then another hour to return to the hospital in Zacoalco. 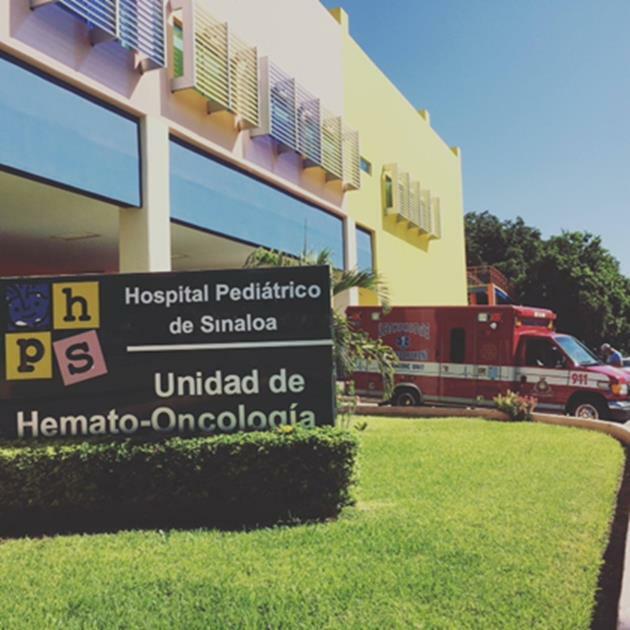 A bit of good news is that patients are stabilized at a medical clinic in Acatlan while waiting for transportation. There are 4 stabilization beds for adults, 2 for children, and a bassinet for one newborn. 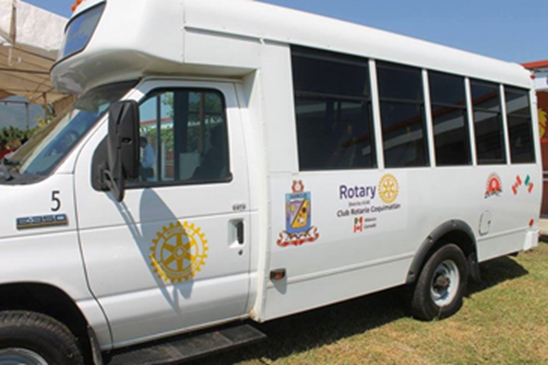 The Fish Creek handibus was presented to the Rotary Club of Colima and handed to a school for disabled children in the community of Coquimatlan (one hour from Manzanillo). The school has waited three years for this; it was a 'dream come true.' There are 30 children registered and teachers have very little to work with. This handibus will enable children to go on field trips, reduce their isolation, and most importantly, get them to and from school. Many parents struggle in getting their children to school, especially during inclement weather when pushing a wheelchair in the mud is not that easy! 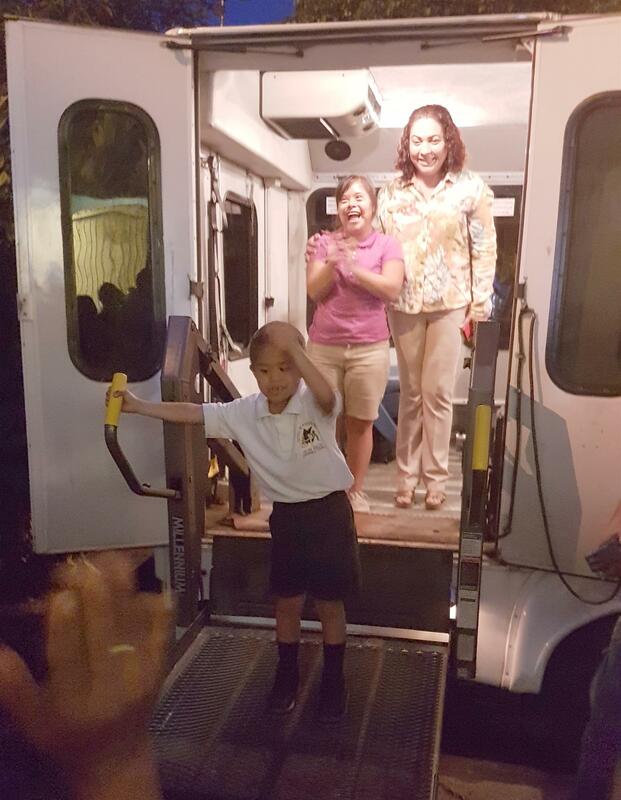 After the official ceremony, the Mayor of Coquimatlan drove the children home using the donated handibus. It was a very celebratory yet poignant moment in time. 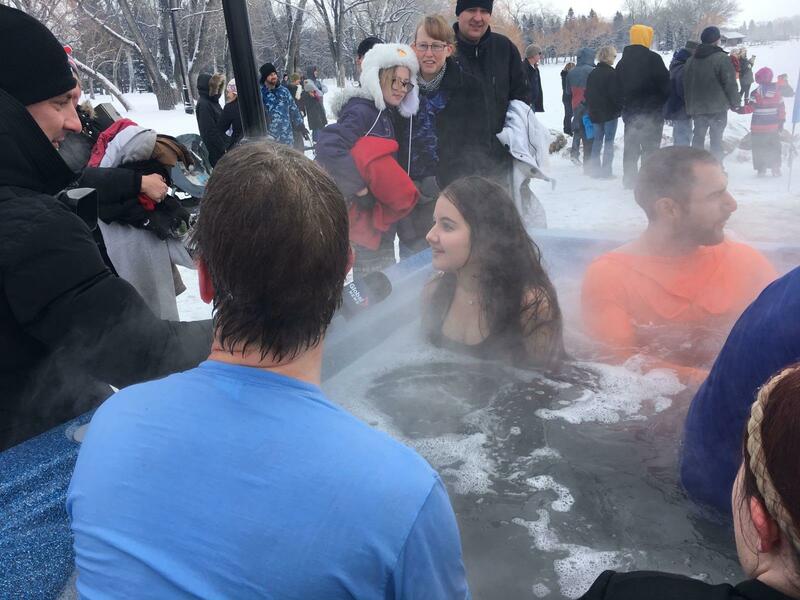 The next article in this newsletter, written by John Fortunka of the Rotary Club Calgary Fish Creek, is a heart-warming story about this delivery. 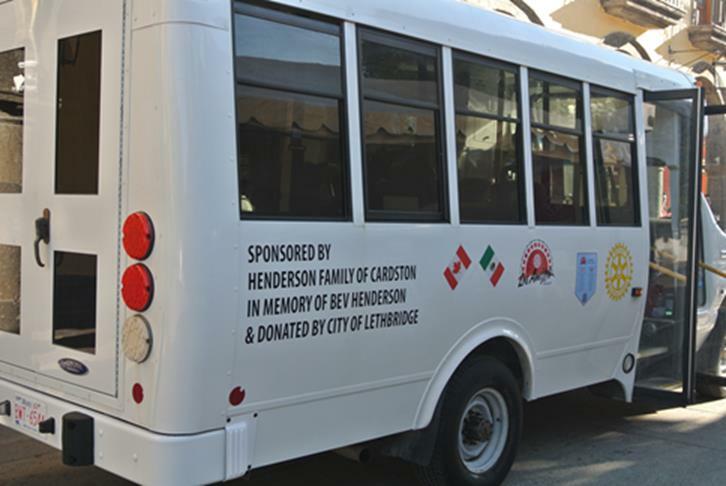 Next day (week 2 day 4), the Cardston handibus was donated to Tlaquepaque which is on the outskirts of Guadalajara. It was donated in memory of Michael Henderson's mother, Beverley Henderson. The handibus was already booked solid for the next few days. 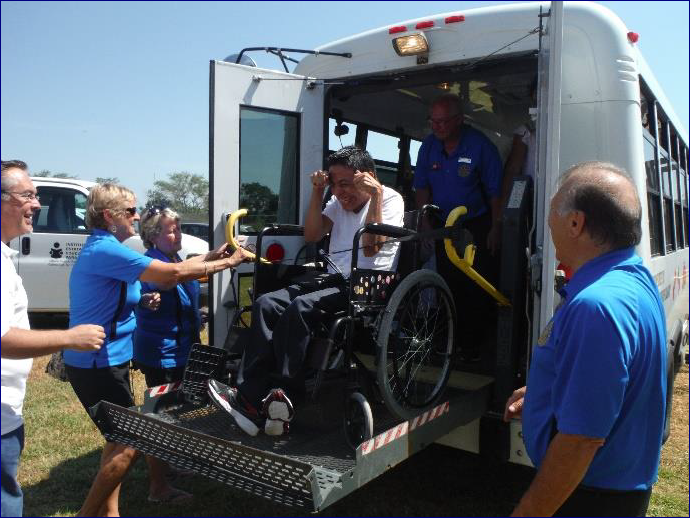 It will be used in transporting the elderly and disabled to and from doctor appointments. The following day (week 2 day 5) the whole group was bused back to Mazatlan. Next morning (week 2 day 6) was the formal opening of the “proper” school to replace the “pallet school,” as mentioned in the previous newsletter. In the evening all attended the formal farewell dinner hosted by the Rotary Clubs of Mazatlan. Next afternoon (week 2 day 7) everyone boarded a direct flight back to Calgary and home. A happy band of Rotarians and Ambassadors were eagerly greeted and welcomed by local Rotarians and staff of the Coquimatlan Municipal School . The children were in their classrooms and were excited about our visit and the anticipation of what was going to happen. The kids who attend the school have varying disabilities and are aged from around four years old to young adults. School is important to these children and adults and getting to the school from their community is not easy for them. 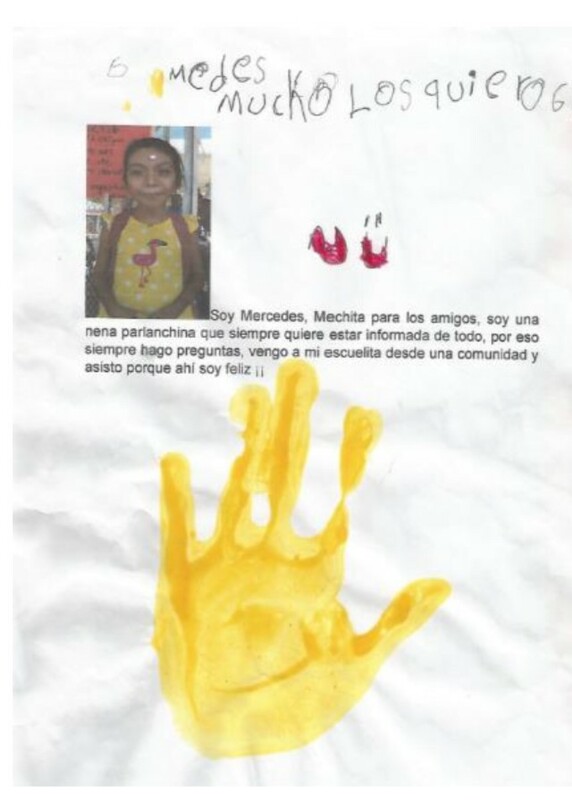 Translation: "I am Mercedes – Mechita to my friends, I am a talkative person, always wanting to be informed of everything, so I always ask questions. I insist that I come to my school from my community because I am so happy there." The initial welcome quickly progressed to the official handover of the handibus to the school. 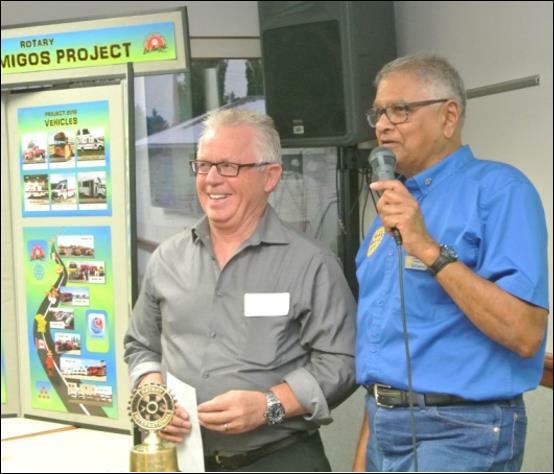 The President of the Community was there to officially receive the keys to the vehicle and many parents and members of the local Rotary Club were also present. The school children, young adults and staff were part of the audience for the official handover. Many speeches and photos! The President had a great idea,‘’Let's load up the handibus with some of the school pupils for a photo-shoot!’" The tailgate elevator was lowered and pupils in wheelchairs were loaded on-board. Other students climbed up the bus steps to take a seat inside. There was a look on the faces of the students that was amazing. Their eyes sparkled with pride for their new acquisition. Tears and smiles spread infectiously among the kids and adults alike. It was a special moment which touched the hearts of everyone. 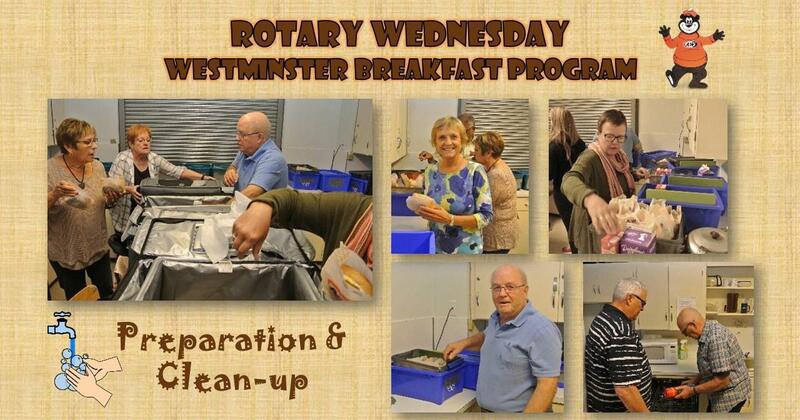 My Rotary Moment! A final surprise was to follow. The President decided that as the bus was now filled he would drive those kids on board home. So off they went! 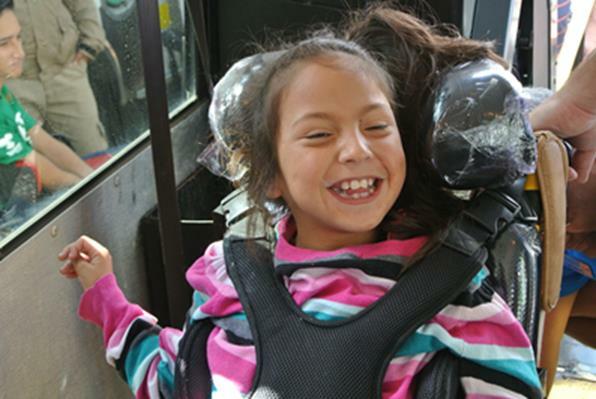 The handibus was now in Service to provide transport for these Very Special Kids to attend their Very Special School and other trips out to enrich their lives. Peter Imhof sharing about the family Center. 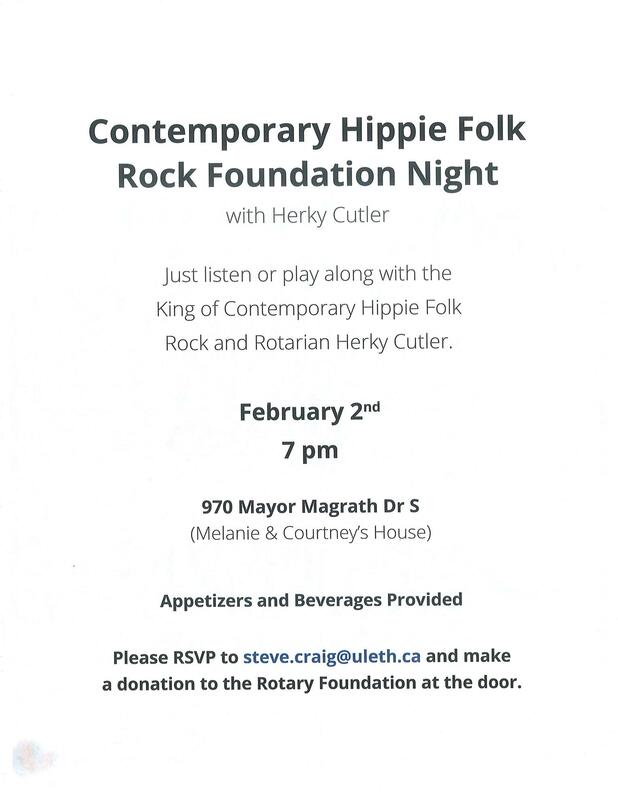 Join us for an evening of Food, Fun, Fundraising and Friendship! Family Centre is committed to using all of the resources we have to ensure a better tomorrow. 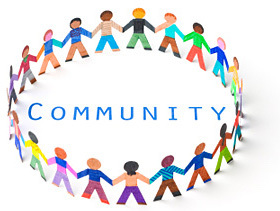 We all have a stake in promoting the well-being of the families in our community. 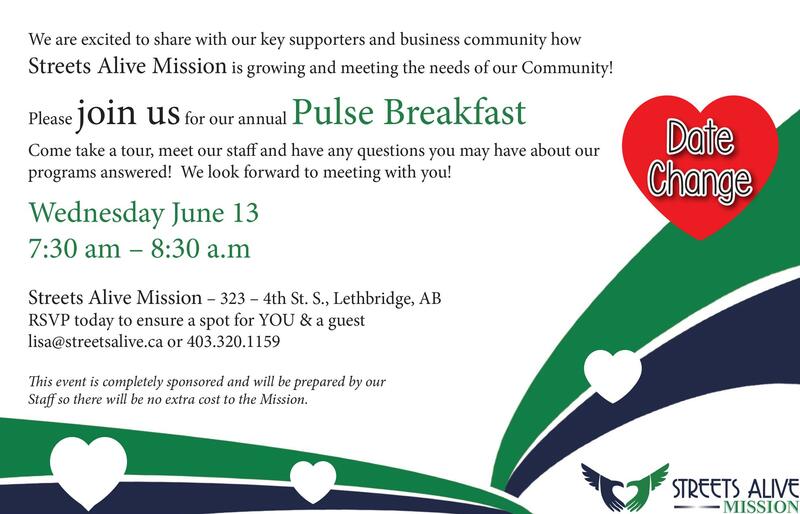 Lethbridge McDonald’s Restaurants and Family Centre have joined together to ask you to support our efforts by attending the 5th Anniversary of the McFamily Gala & Auction. 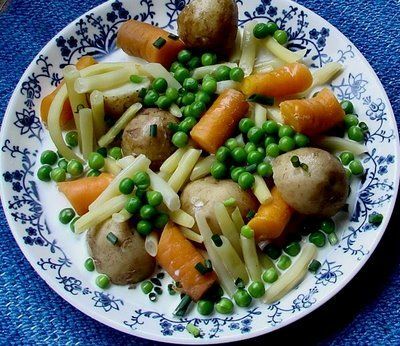 You will be served a wonderful meal by Prime Catering. With a Vintage Carnival Theme to the evening, you will find lots of different activities to experience and enjoy. See Magic Tricks done before your eyes! Have your face painted by an incredibly talented team. With a Cocktail Chic dress code, you can wear your party outfits or come straight from the office. Bring tissues as our speakers tell their stories which bring tears to your eyes. Bring your mobile phone or device as we use the Silent Auction Program HANDBID. 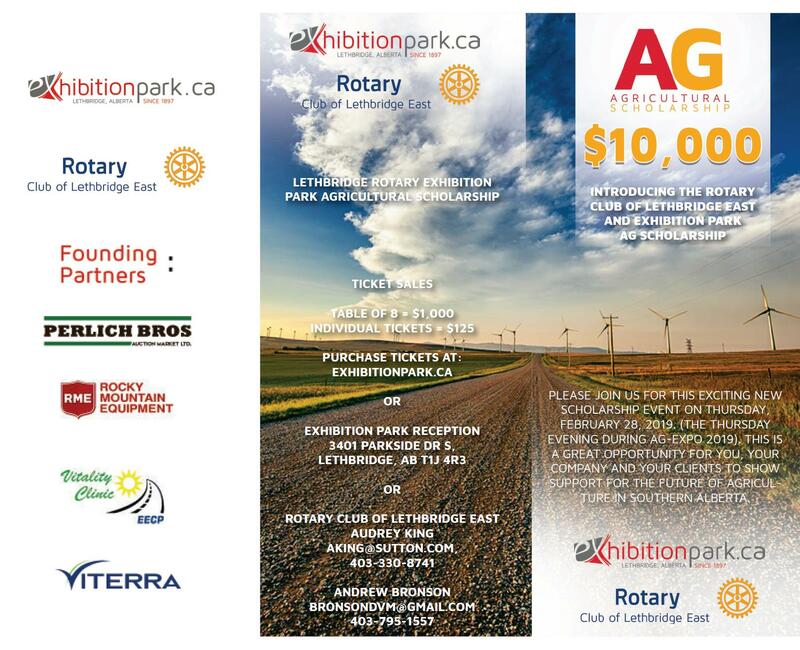 Bring your chequebook to support TWO great charities that support people in Southern Alberta. Help us raise $70,000 this year to support both Ronald McDonald House Southern Alberta and clients to Family Centre who rely on Early Childhood Education programs, Parent Education programs, Family Support programs including counselling services and much more. You truly can make a difference in our community through your generous support of the 5th Anniversary McFamily Charity Gala & Auction. 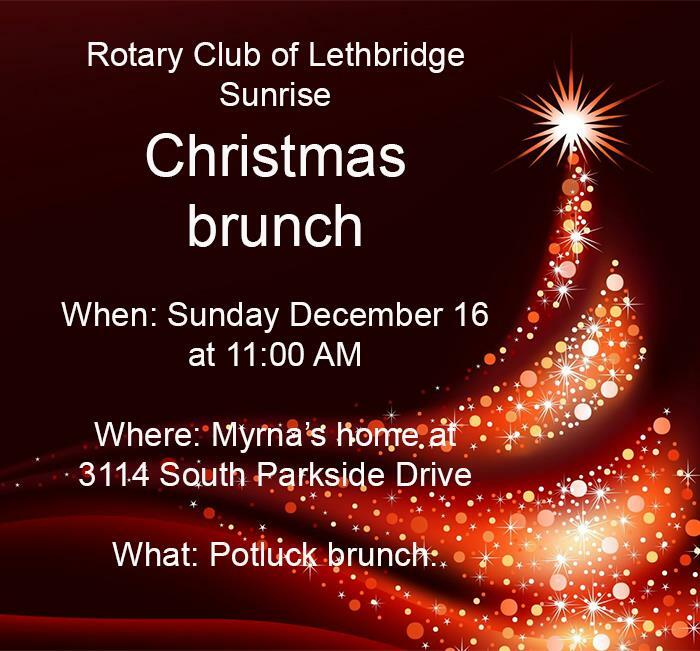 Buy a Table, Bring a Friend, Take out a Sponsorship! 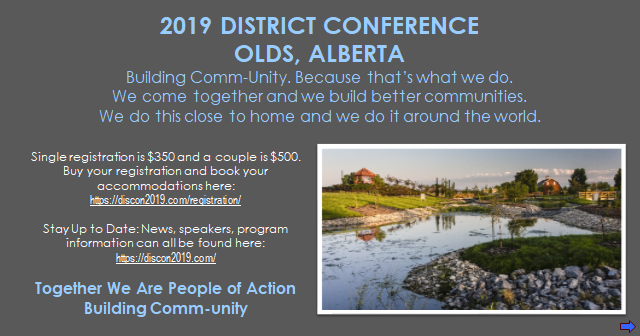 Call Kathryn Ponomar at Family Centre 403-320-4232 ext. 207 for sponsorship packages or just more information. A happy band of Rotarians and Ambassadors were eagerly greeted and welcomed by local Rotarians and staff of the School. The children were in their Classrooms and were excited about our visit and the anticipation of what was going to happen. The kids who attend the school have varying disabilities and are aged from around 4 years old to young adults. School is important to these children and adults and getting to the school from their community is not easy for them. 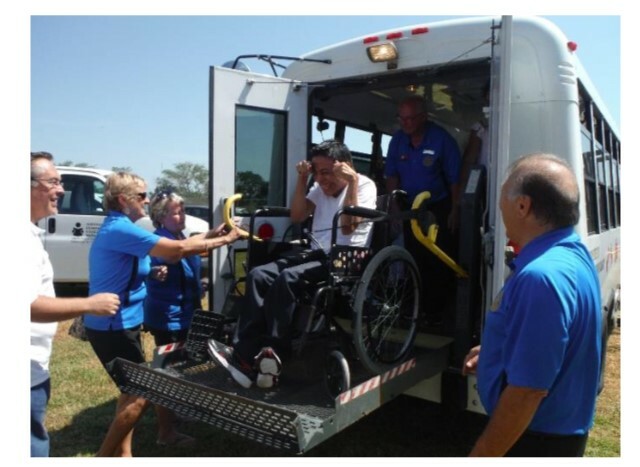 The initial welcome quickly progressed to the official Handover of the Handi -Bus to the school. 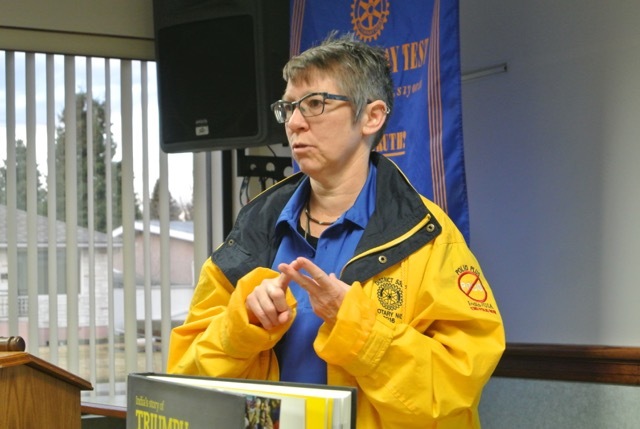 The President of the Community was there to officially receive the keys to the vehicle and many parents and members of the local Rotary Club were also present. The school children, young adults and staff were part of the audience for the official handover. Many speeches and photos!!!! The President had a great idea- ‘Let’s load up the Handibus with some of the school pupils for a Foto -Shoot! !’ The tailgate elevator was lowered and pupils in wheelchairs were loaded on- board. Other students climbed up the bus steps to take a seat inside. There was a look on the faces of the students that was amazing. Their eyes sparkled with pride for their new acquisition. Tears and smiles spread infectiously among the kids and adults alike. It was a special moment which touched the hearts of everyone!!! 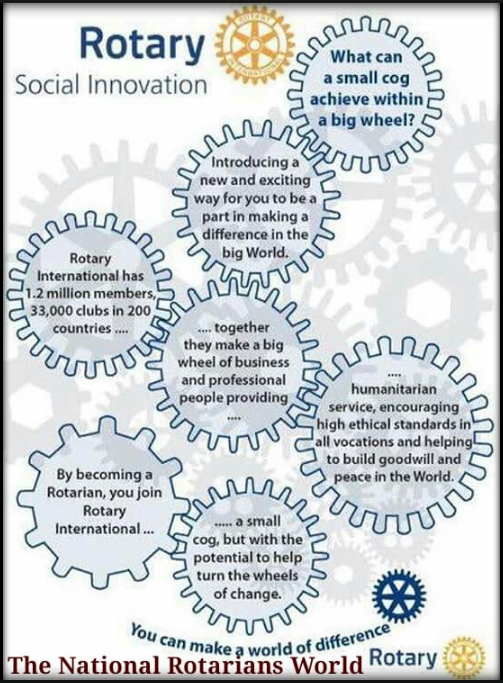 My Rotary Moment!! A final surprise was to follow: The President decided that as the bus was now filled he would drive those kids on board home. So off they went!!! Emma our outbound exchange student shared her Italian with us. 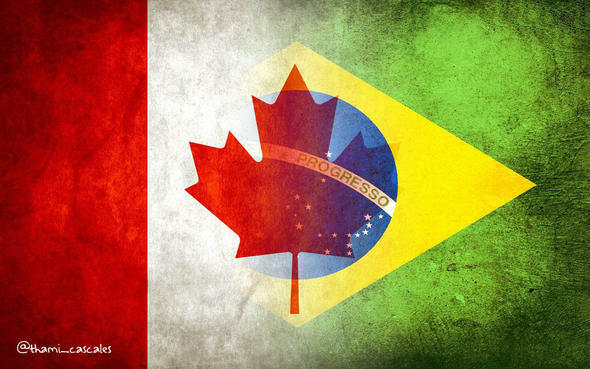 This years exchange student Emma Arnell (Northern Italy) along with last years Taylor Fulton (Brasil). President Greg Weadick and Felipe Guerra accompany them. 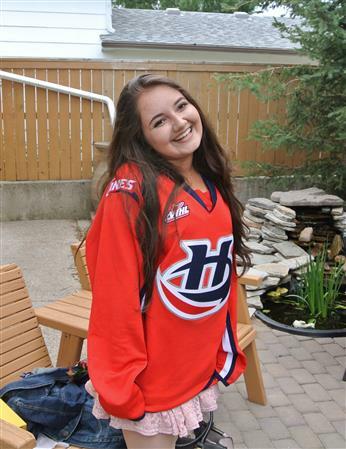 "Understanding the changing brain of children"
Our annual 50/50 raffle at the PBR Enmax is March 2nd and 3rd and we need your help! -Commitment is from 5:30- 9:30 pm. 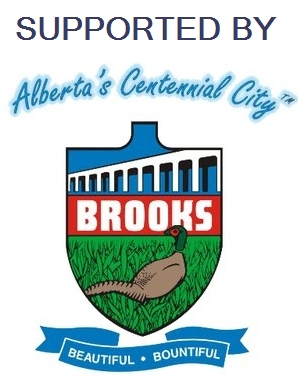 -Teams of two will be selling 50/50 tickets in a section of the Enmax. 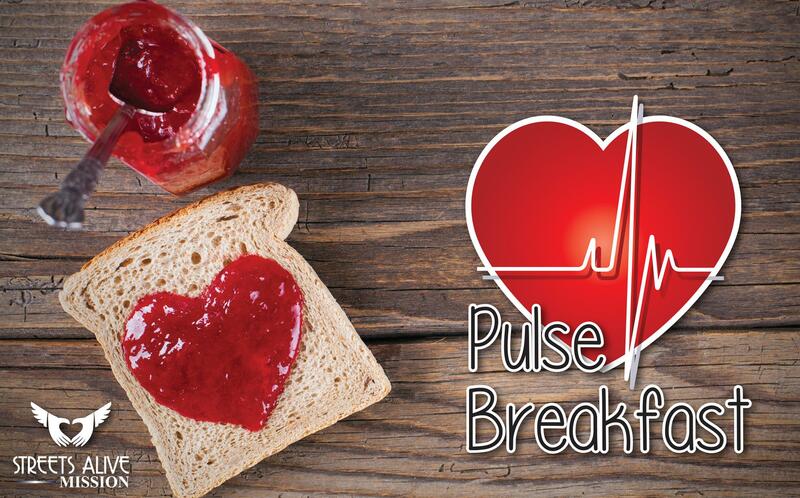 We will have two booths locations with remaining locations requiring walking and steps. Please consider helping out, we need 14 volunteers for each night! Family and friends are welcome to volunteer too! 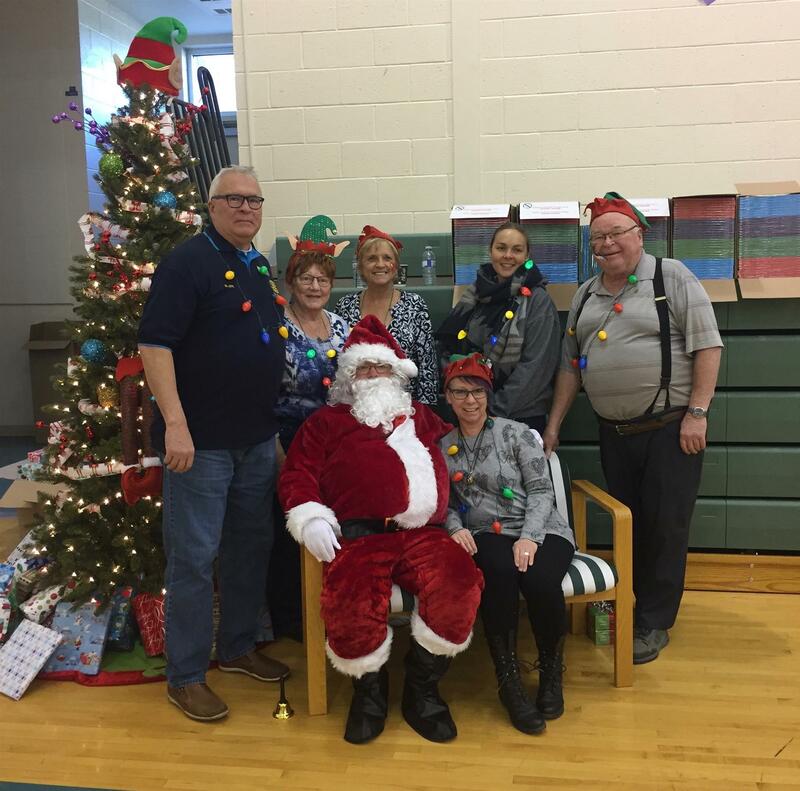 Sunrise members helping at the FASD Christmas Party. Dorothy Graham sharing the Celebration of Water. 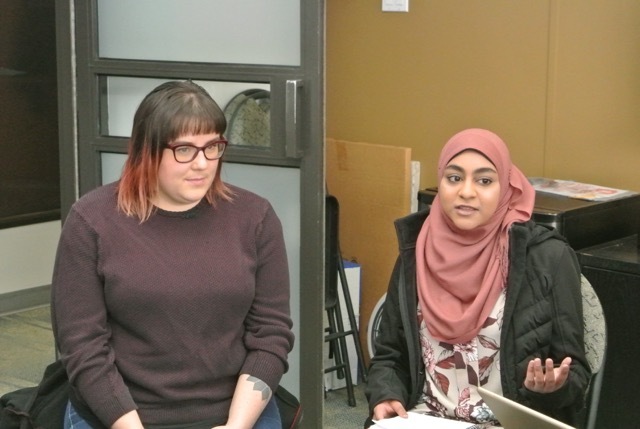 The University of Lethbridge Rotaract Club (ULRC) had raised funds for a school in South Sudan, but the civil war there prevented its construction. Members of the Rotary Club of Lethbridge East (RCLE) proposed to the Rotaractors that they fund a permanent structure for a poor school in Mazatlan, that was built out of shipping pallets. 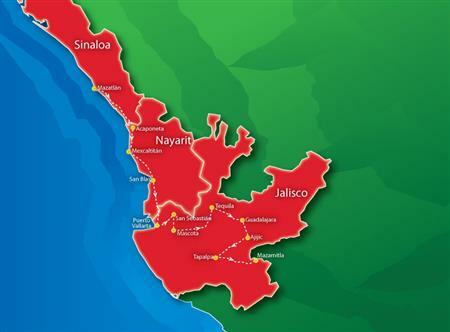 The ULRC agreed to this change, provided there was local Rotarian supervision in Mazatlan. 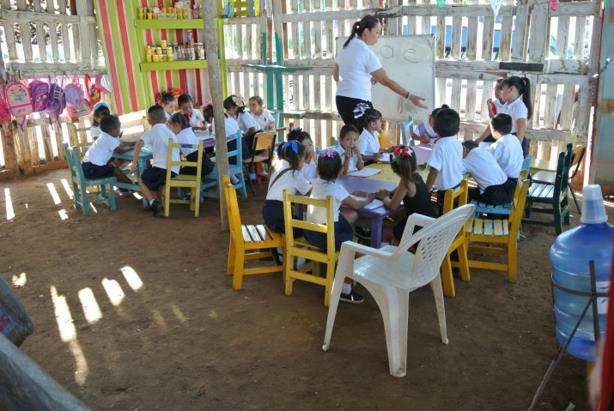 Construction of a hurricane-proof school was overseen and completed by a Mazatlan Rotarian who is also a major contractor in town. The school is a busy lively beautiful kindergarten. This school will also serve as a community emergency shelter. 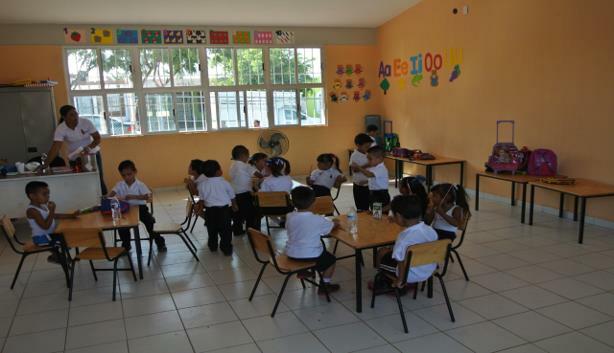 In Mexico, children must attend kindergarten before they may enter grade school. To enter kindergarten children are required to wear a uniform and have a backpack filled the required school supplies. Many local parents cannot afford the uniform or the supplies, but local ‘snowbirds’ fundraise to ensure these children enter kindergarten. In Mazatlan there is a large group to permanent foreign residents plus snowbirds who organize scholarships and supplies to ensure children complete their grade school education. The school’s new building formally opened in October 2017 and was timed to coincide with the convoy’s arrival. The two Presidents of the ULRC who were both heavily involved in project were also flown down (expenses covered by RCLE) to attend the formal opening. 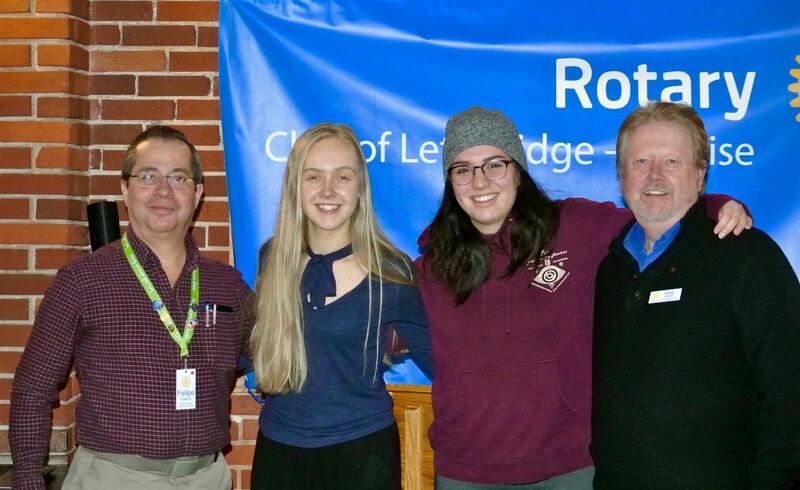 Katelyn and Katie attended the formal opening and in the evening, were entertained to formal dinner in a private house to thank them for the Rotaractor’s generosity. Mexican hospitality requires that visitors who bring valued gifts are specifically thanked, so the two Presidents also attended the formal dinner which marked the end of the 2017 convoy’s time in Mexico. 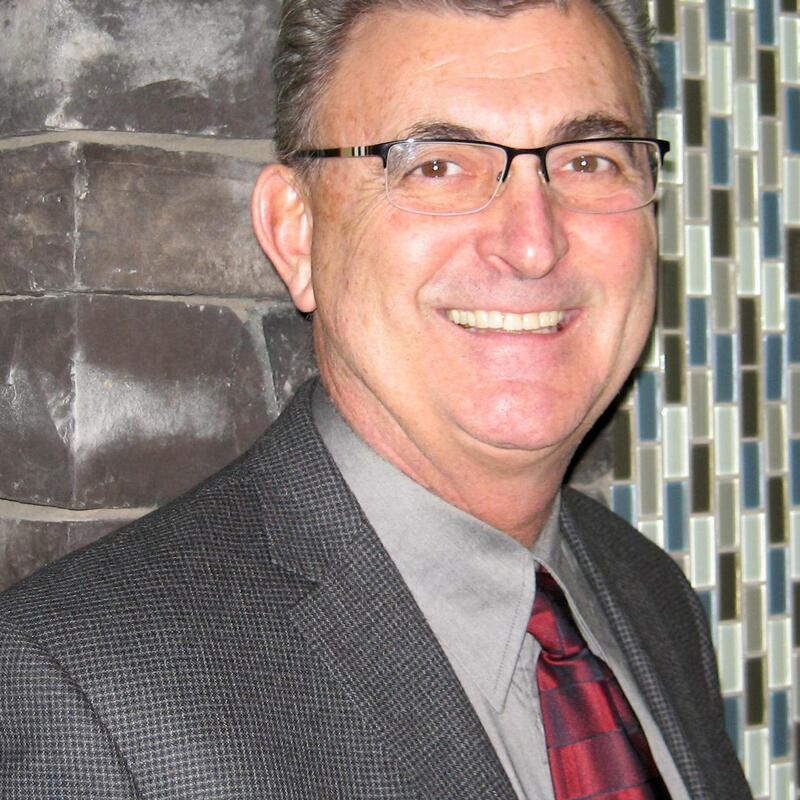 Ron Bunton shares a vocational talk. 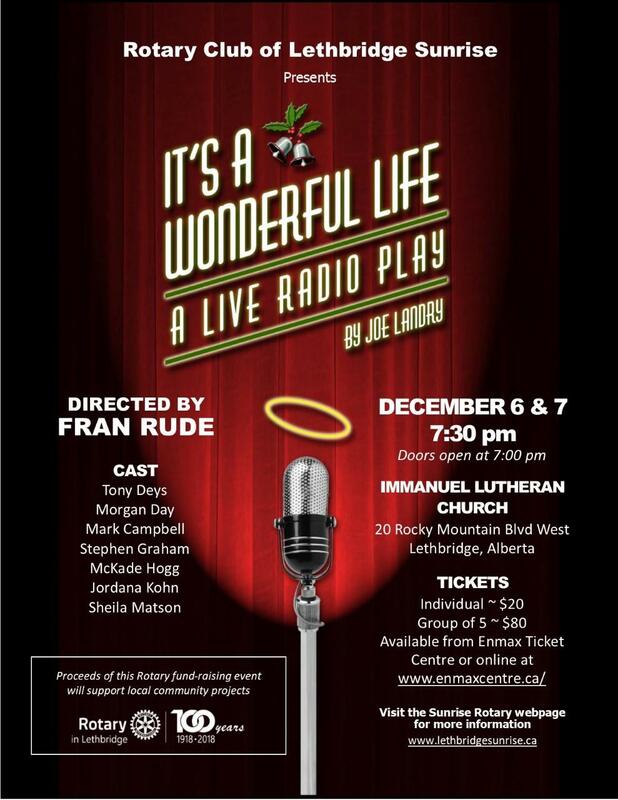 We sure did enjoy having the cast and crew from "It's a Wonderful Life" join us for breakfast. 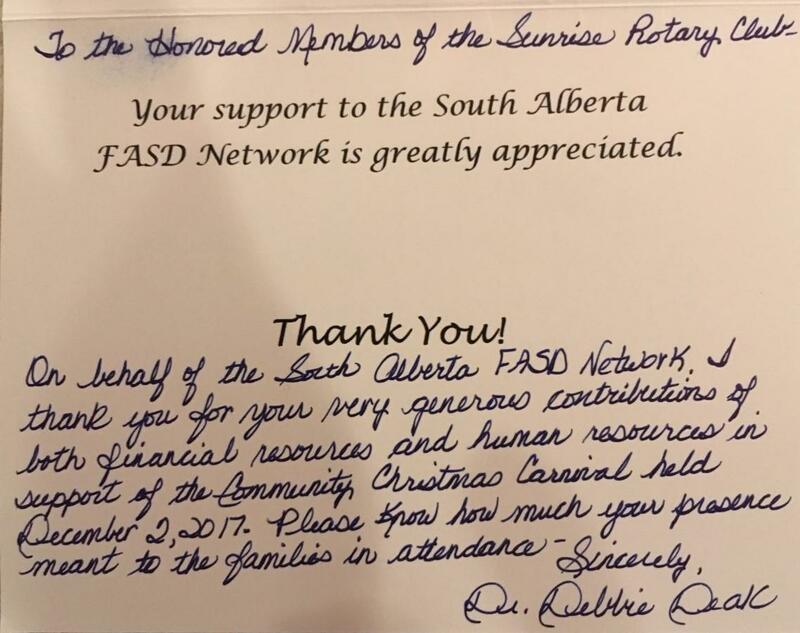 Received a Fire Truck on December 16, 2017 From Airdrie. and the role of the Membership Committee. 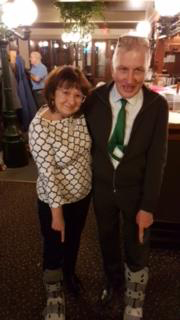 Myrna and Ken showing off their matching boots. 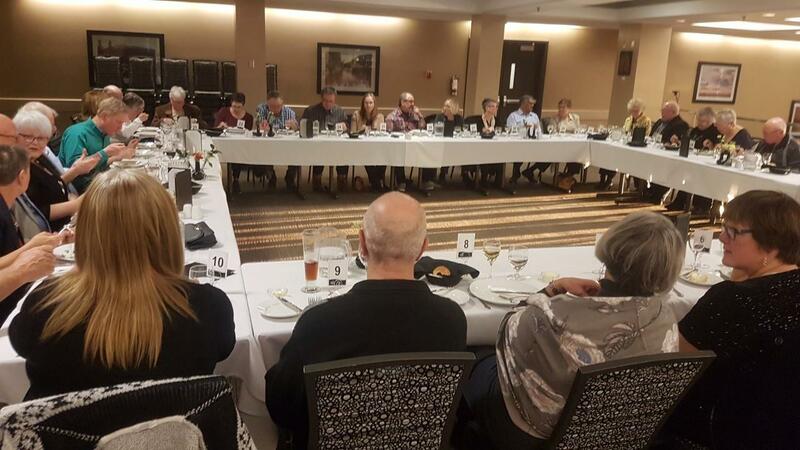 from Potato Growers of Alberta presented the history, growth and impact of potato growers in Alberta's economy. A big Thank You to all that helped! Coffee or mix and match!! First order will go in on November 13th! 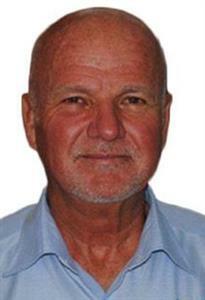 Terrence Lazarus will present on Irrigation. Shared the history of the Oldman watershed. Los Amigos departed right after the meeting on October 12, 2017. Wishing them all a safe journey. Can't wait for updates. Rick Istead & Greg Weadick announce the Co-Chair of President Elect of Marlys Reynar and Wayne Brewer. Marin Schultz demonstrating the Prosthetic Arm. 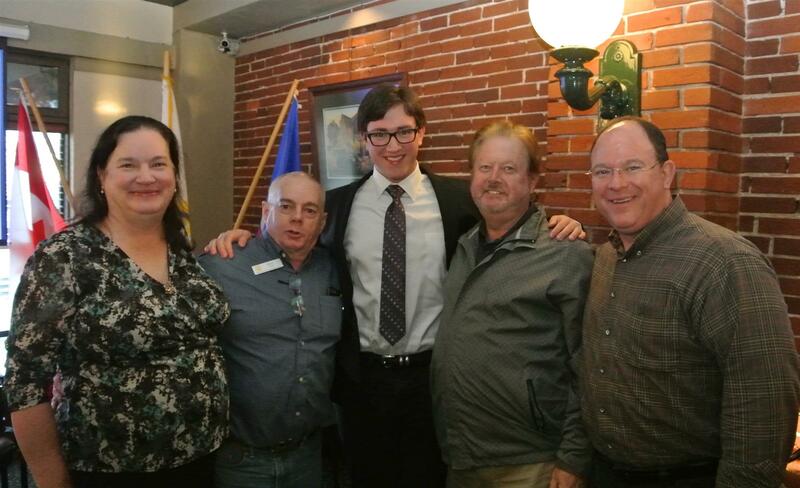 Martha Schultz, Don Robb, Marin Schultz, Greg Weadick & Arian Schultz. & updates on APU Malawi Girls School. Banner from Brazilian Club presented to Wayne Brewer by Taylor Fulton. for your Presentation on the Destination Project. 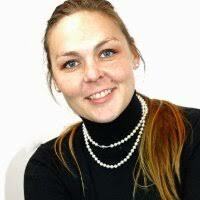 Make sure you welcome our newest member Caroline Vibholm. We are having another club service committee meeting on August 15, 2017 at Erica's house at 36 Moonlight Blvd at 6:30 pm. Our Committee plans the program for the weekly meetings. 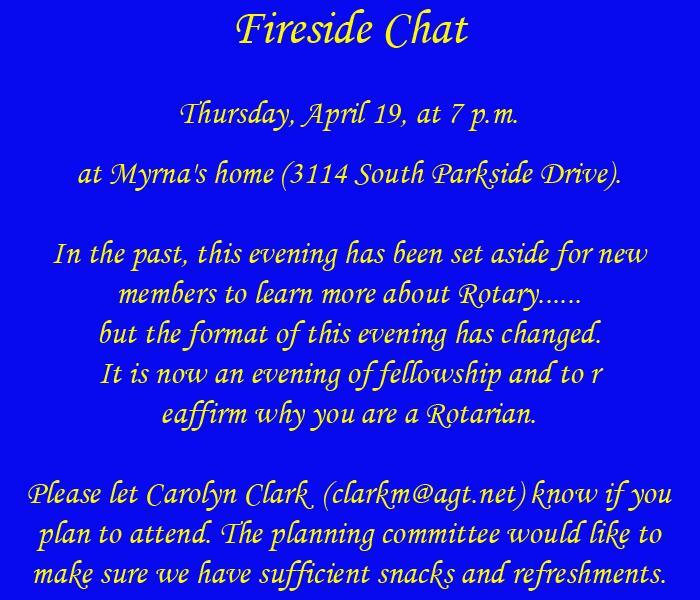 All club members are welcome to attend this meeting. 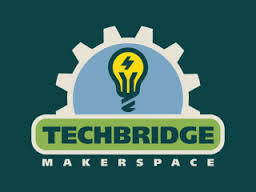 If you have ideas about speakers but aren't able to attend please let one of the committee members know your idea. 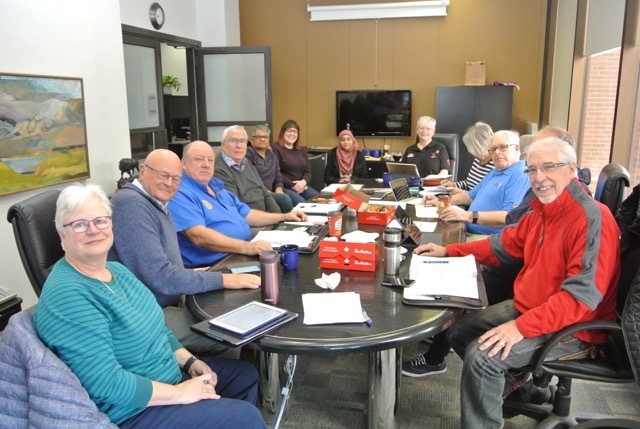 At present the committee consists of Don Robb, Carol Kundrik, Richard Tamkin, Julie Smith, Erica Cormack and Krystal Cruikshank - hopefully we haven't missed anyone. 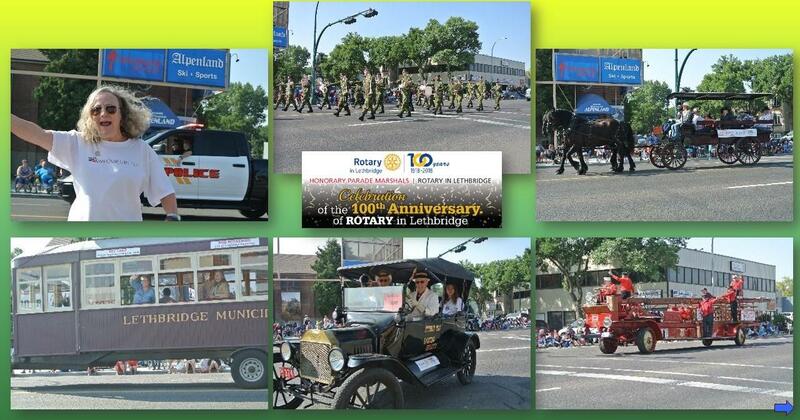 Volunteer Lethbridge and Lethbridge East are promoting a Photo Page celebrating Volunteers in Lethbridge. There will be a booth at Whoop up Days where the photos will be displayed along with information about the organization. This is a good way to promote our motto Service above Self and to support a very important organization in our community. If you have any good pictures of members of our club volunteering for an event please go to the link below and upload your photos. 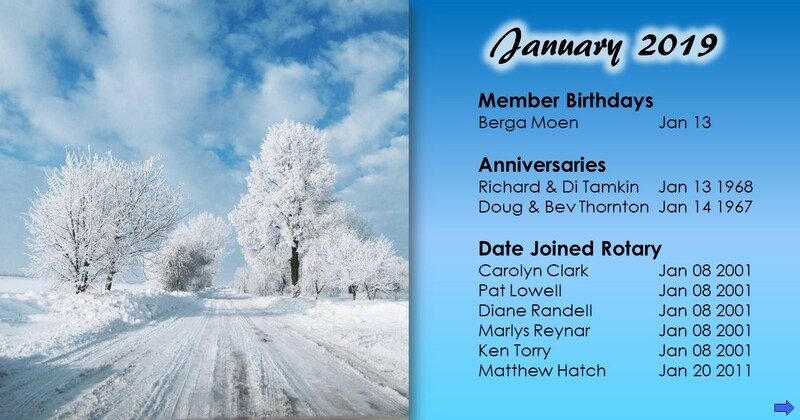 Click on READ MORE... below right to view Bella's Excellent Rotary Adventure Calendar. 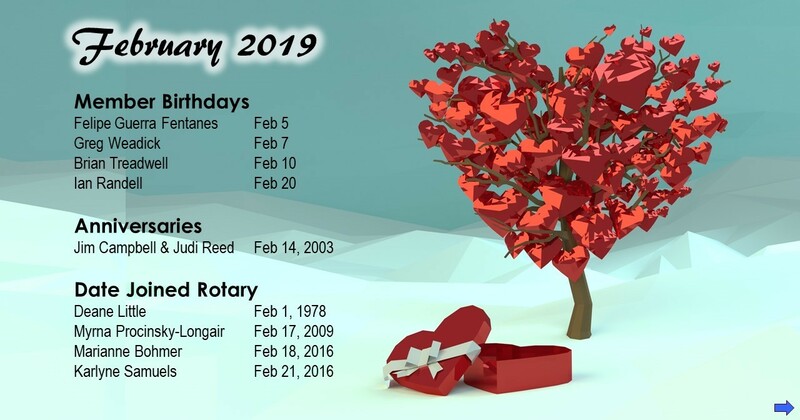 If you are planning an event, then please be aware that this calendar might not be complete. 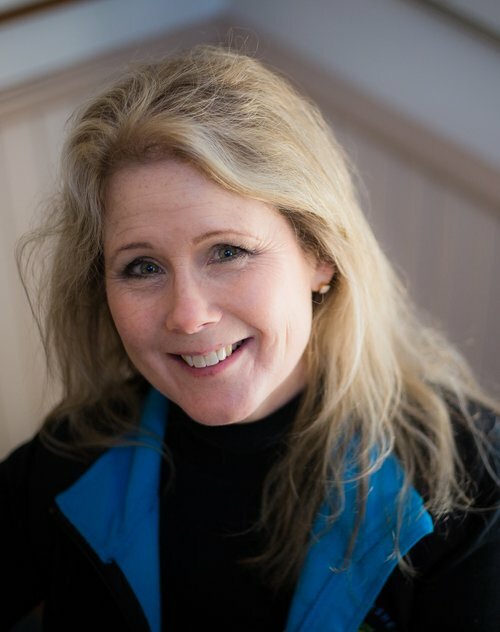 To be certain, contact Kim Derksen before planning an event. 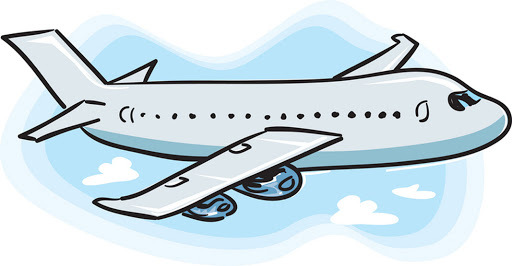 ALSO, you need to download and complete the IB Student Travel Form. Bella tells us stories of her Canadian Adventure. Last week, Taylor Fulton spoke of her Adventure in Brazil. President Greg thanks Taylor for her report. The Thursday 8 June 2017 meeting is Community Groups day when we will present cheques to various community organizations. The Thursday 1 June 2017 meeting is Youth Day when scholarship awards will be presented to youth from Ryla, Interact, etc. The red numbers before the Community name refers to the location number on the map. The number after the => arrow shows the number of vehicles at that community. The red number before the Community name refers to the location number on the map. 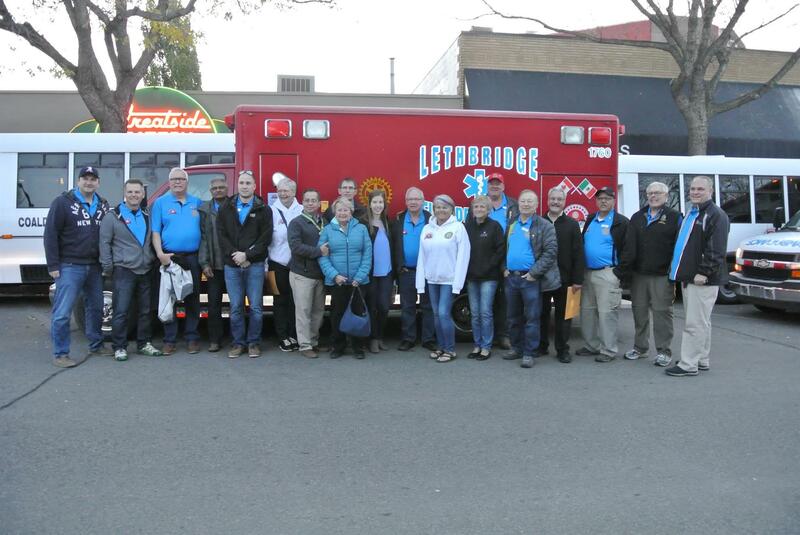 In early May two Rotarians from Lethbridge returned from a one week inspection tour of the 29 vehicles “Los Amigos” has driven down to Mazatlan in the past 6 years. Your editor is very happy to report that all 29 vehicles are well maintained and working on a daily basis. All vehicles are operated by authorized mature drivers, licensed, insured and are kept in sound operating condition. More importantly - each is highly valued by its community. The names of each Canadian town that donated the individual vehicle are each clearly displayed which show the local Mexicans on a daily basis that Canadians are their friends. 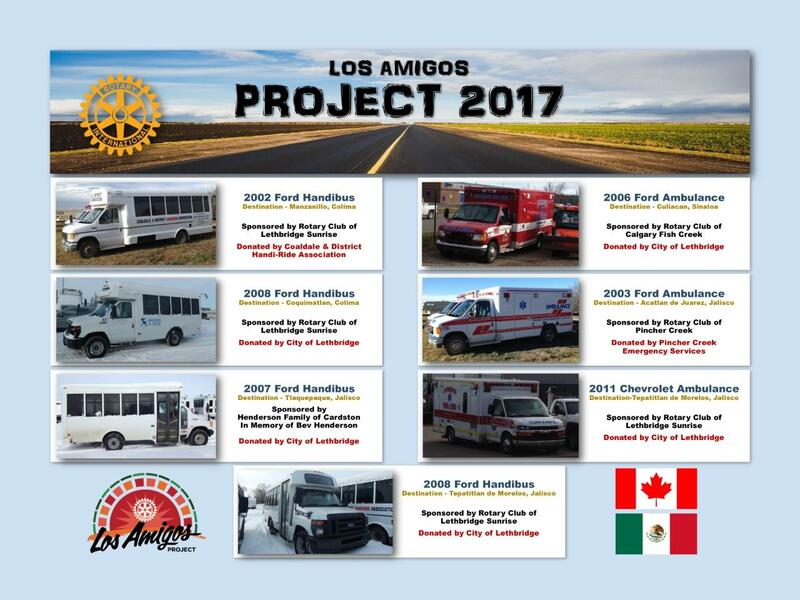 Surely that alone has to make the “Los Amigos” project one of Canada’s better aid projects. 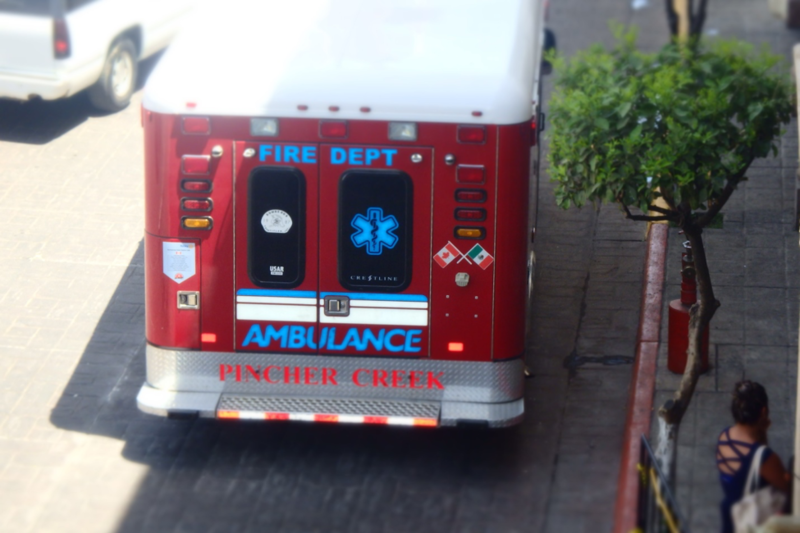 The Pincher Creek ambulance is being used. The UofL Rotaract Club made possible this dramatic improvement. 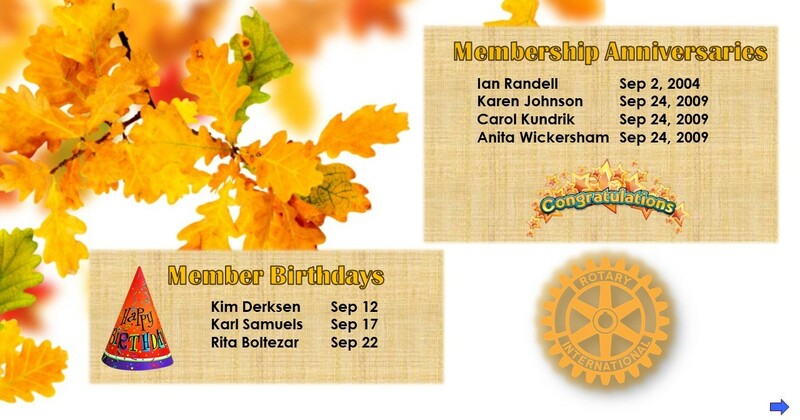 No wonder that Club has been awarded a prize for being the best Rotaract Club in North America and the Caribbean. Congratulations. Rotaract’s financing made these buildings possible and local Rotary connections supervised everything. So – connections work! Below are “before” and “after” photos showing on the right the original school built of simple local materials with a dirt floor and a questionable roof. On the left is the new replacement school which also serves as a hurricane shelter for the local impoverished population. Now their children have a better chance of an improved life. The Taber ambulance is well cared for and valued. 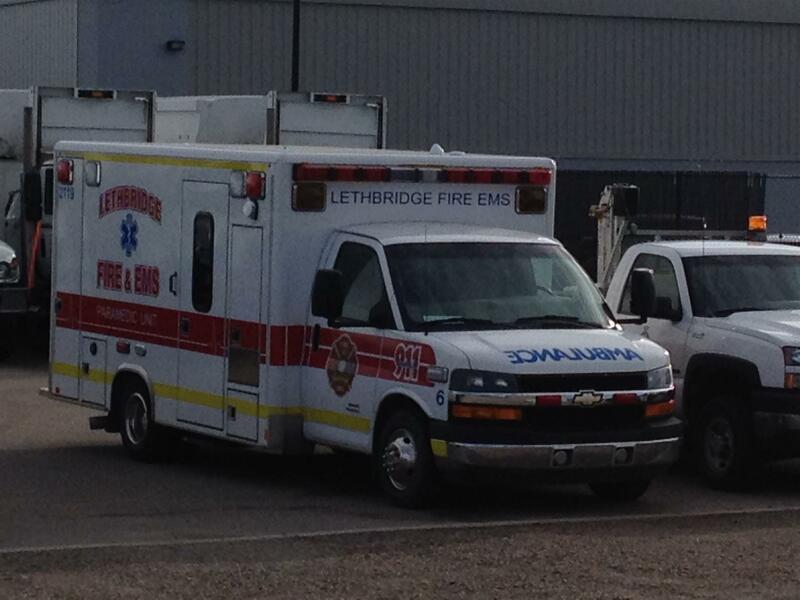 One of Lethbridge’s ambulances is earning its retirement to Mexico. 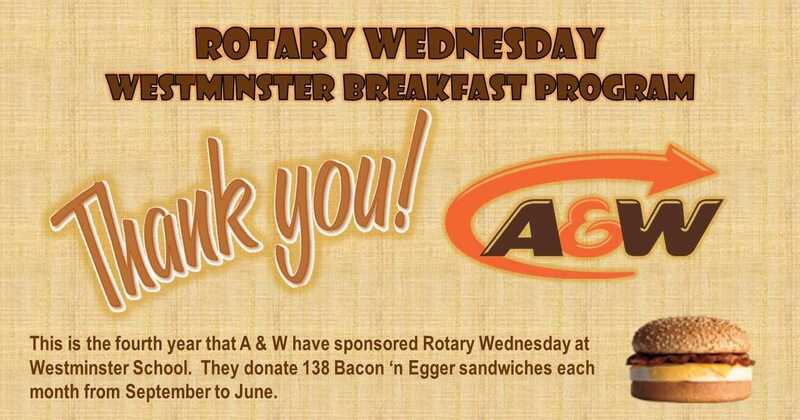 One of Cardston’s donations is at work. 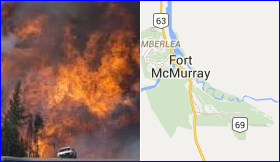 Fort Macleod’s fire truck is still in service and will be for many more years. Just to makes sure the ordinary Mexicans know who their friends are. Other Pincher Creek donations enjoying a Mexican retirement. 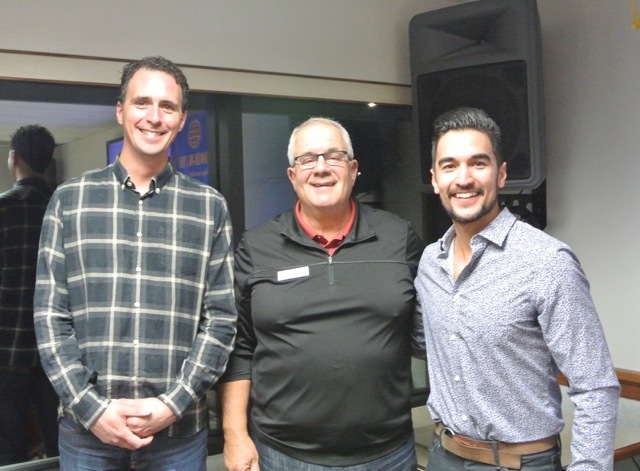 The Alberta Government's Community Initiatives Program has approved a $15,000 grant to support the 2017 Los Amigos Project. 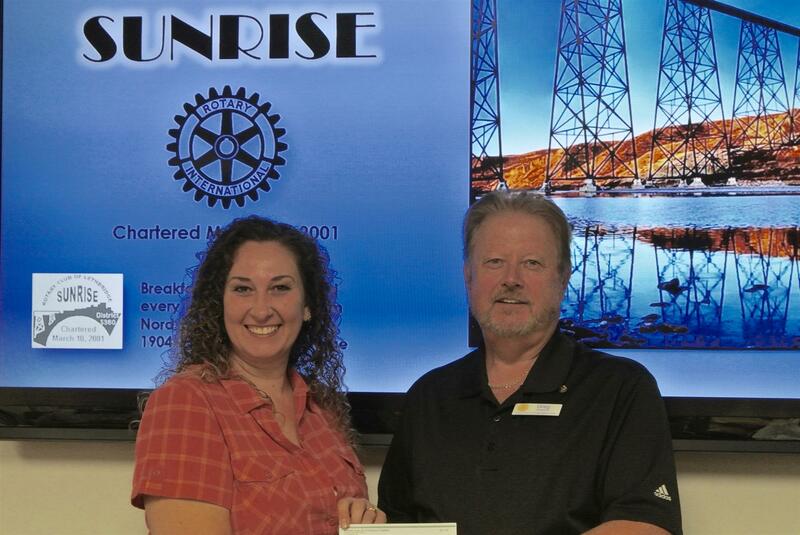 We are grateful for the financial assistance in helping Rotary to help our Mexican friends. 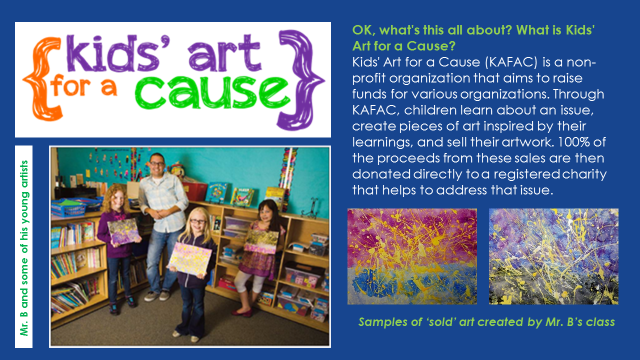 To learn more about the Los Amigos Project, click on READ MORE... and read their press release. 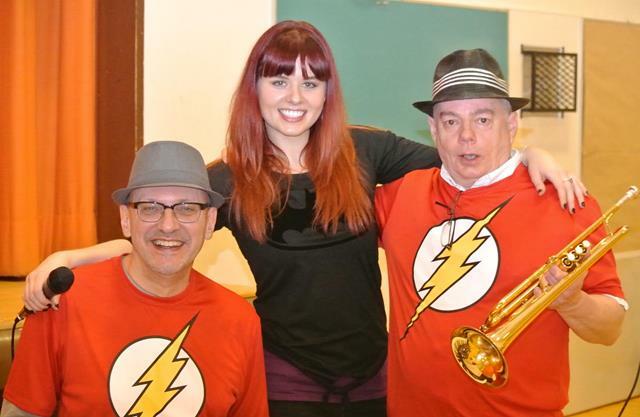 Glenn Klassen is the music director of the Lethbridge Symphony Orchestra. 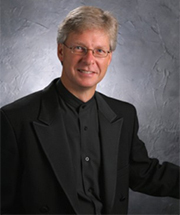 Glenn Klassen was appointed Music Director of the Lethbridge Symphony Orchestra in 2003. 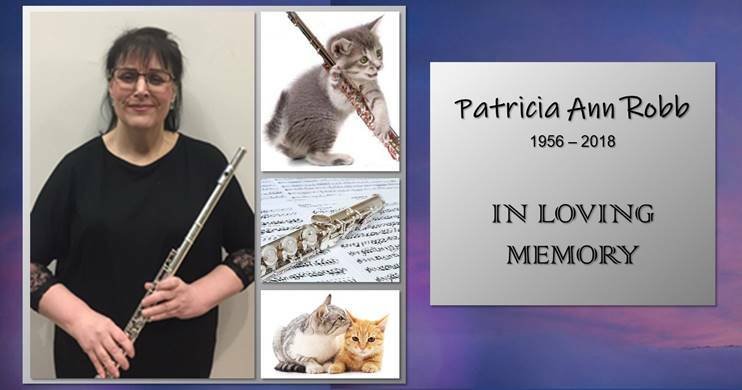 Previously held positions include: Music Director of the Rochester Symphony (Michigan), Mason Community, Mennonite Community and, Manitoba Conservatory of Arts and Music Orchestras, Associate Conductor of the Battle Creek Symphony Orchestra and Assistant Conductor with the National Academy Orchestra at the Boris Brott Summer Music Festival. 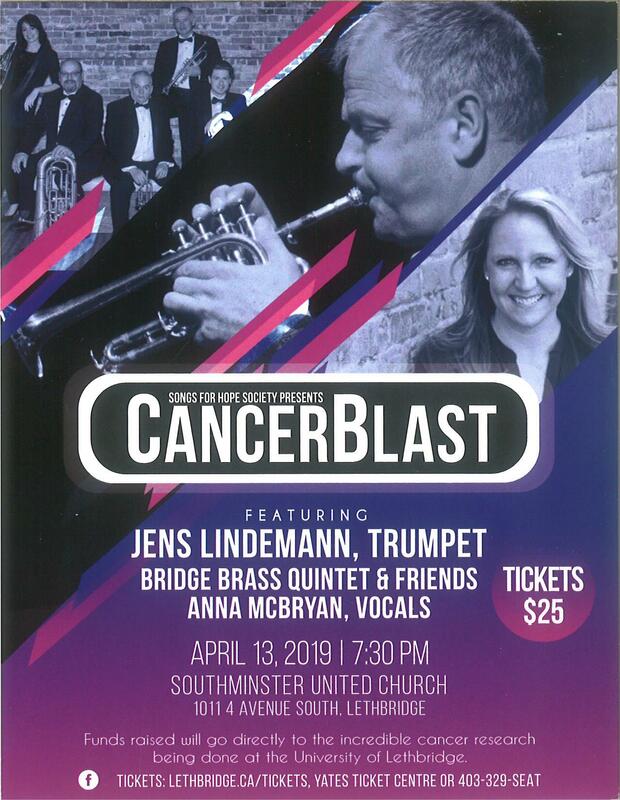 As a guest conductor he has performed with: the Great Lakes Chamber Orchestra, Helena Symphony, Traverse Symphony, and return engagements with the Mennonite Community and the Battle Creek Symphony Orchestras. 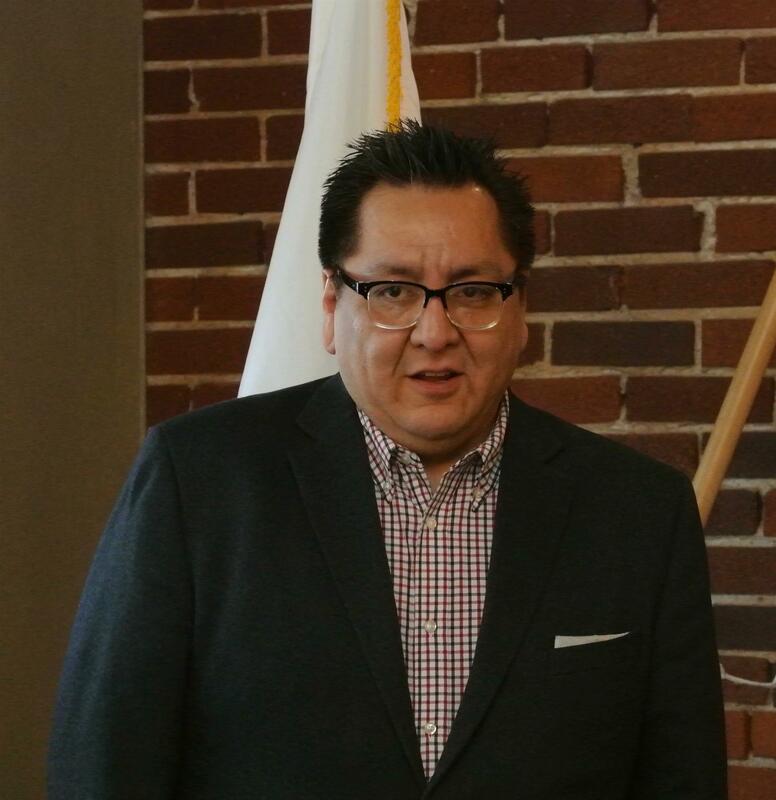 A native of Manitoba, Glenn relocated to Michigan in 1997 pursuing graduate studies at Michigan State University. While at Michigan State, he was Assistant Conductor and led the University’s Symphony, Chamber, Philharmonic and Campus Orchestras and also worked with the Opera Theatre Department. 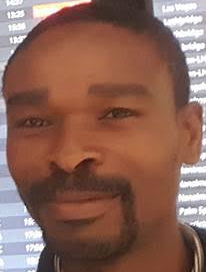 He graduated with a Doctor of Musical Arts degree in 2002. 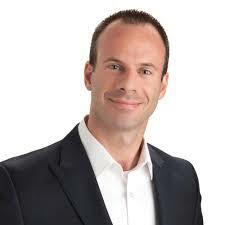 Glenn has also been an active choral conductor and since 2003 has been the music director of Vox Musica. Memorable choral experiences include working with renowned conductors Robert Shaw and Helmuth Rilling. 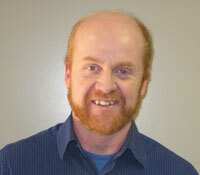 Glenn has also served as interim conductor of the U of L Wind Orchestra during the 2008-09 and 2009-10 academic years. 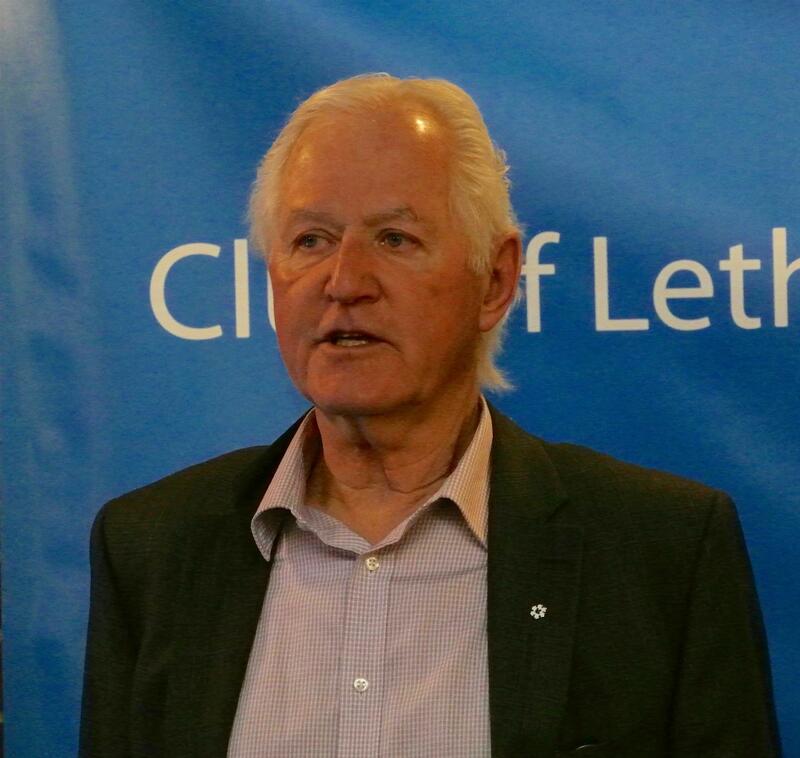 Glenn resides in Lethbridge together with his wife Sandra. 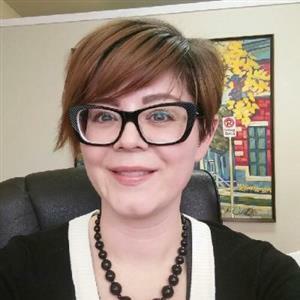 Dana Inkster was born and raised in Ottawa, Ontario and focused on political studies during her undergraduate education at Queen's University, and in her graduate studies at Concordia University and at the University of Lethbridge. 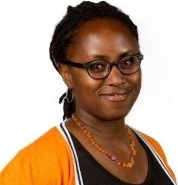 She has extensive experience in the film industry and in fund development for nonprofits. 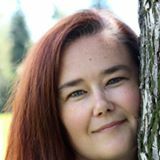 She has lived in Lethbridge since 2005 is currently the Marketing & Communications Officer at the Galt Museum & Archives. 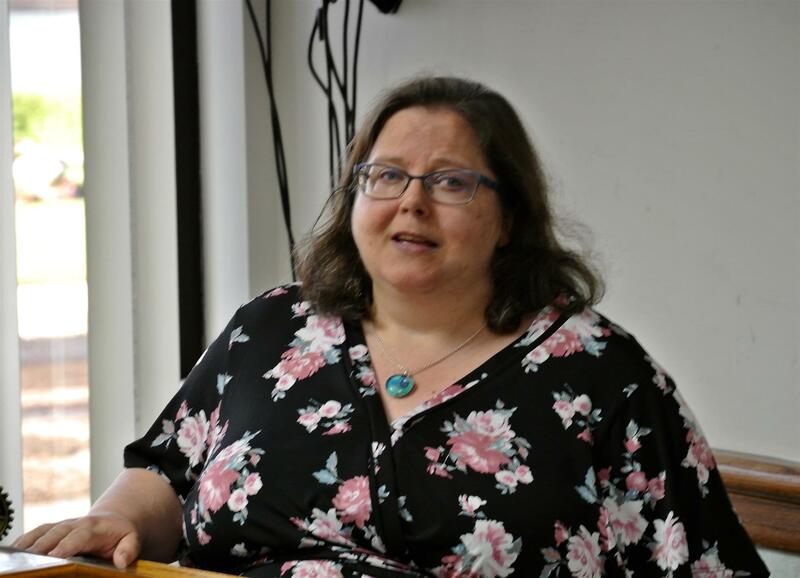 Speaker Angela Wilde is the new principal at Westminster Elementary School. 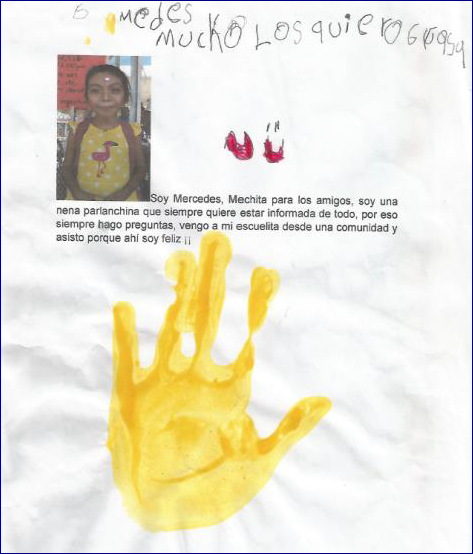 Here is a link to an article on the Honduras micro-finance project our club supported. 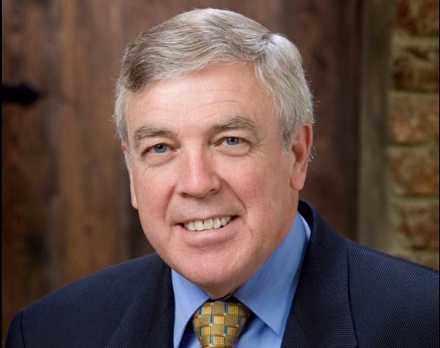 The chief executive officer of Economic Development Lethbridge, Trevor Lewington, speaks today. 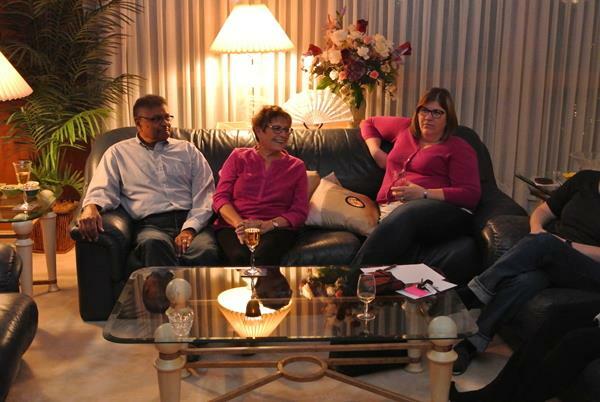 Thank you Myrna, for hosting this year's Fireside Chat and Fellowship evening. 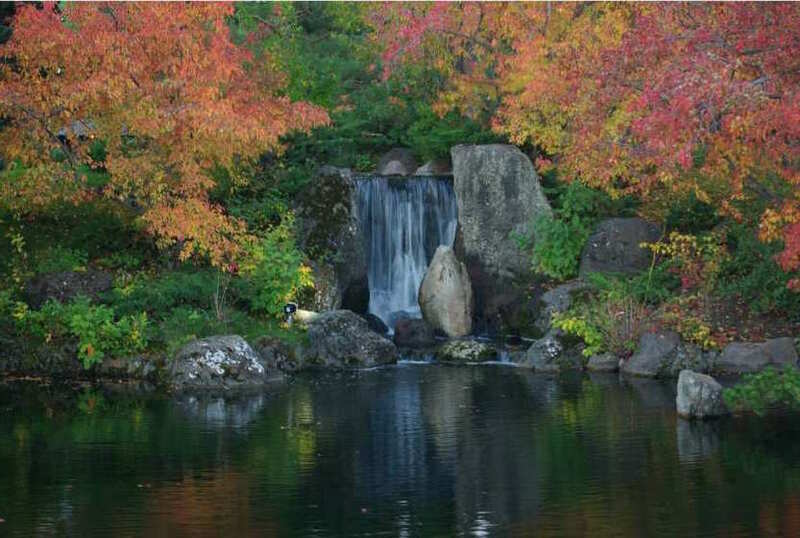 3114 South Parkside Drive S.
Nikka Yuko Japanese Garden Director, Michelle Day, speaks today. 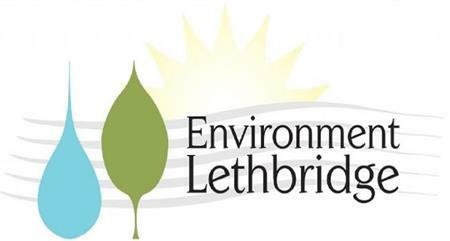 The executive director of Environment Lethbridge, Kathleen Sheppard, is speaking about Environment Lethbridge. 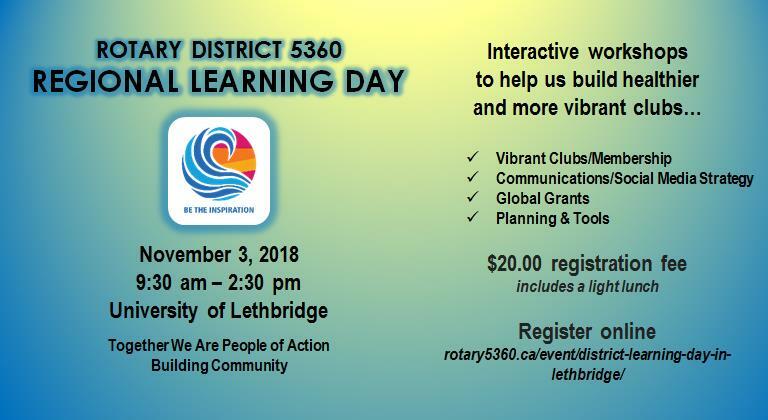 We are joining forces with Lethbridge East in order to have Past District Governor (PDG), Steve Rickard come down from Calgary to do a presentation on Microfinance. 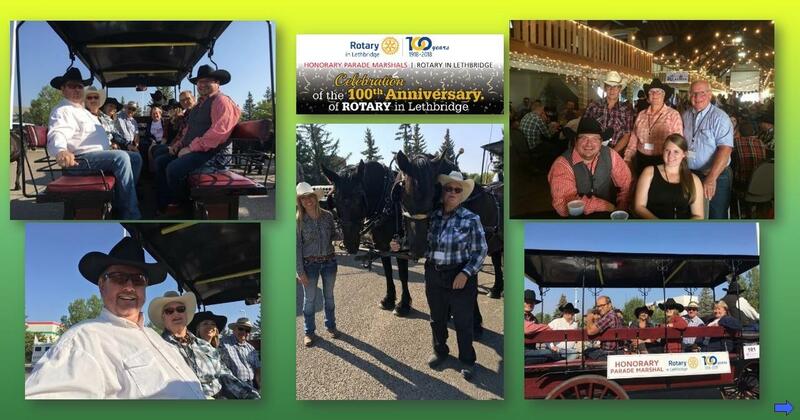 We want our members to go to the meeting on Nov 1, 2016 at the Exhibition Saddle Room at 6:00 pm. The multi-year Honduras Economic and Community Development program (HECD) has been supporting the development of microfinancing in Honduras since 2014. The District 5360 Microfinance Task Force (MTF) has continued to expand its mandate to address new areas of need for financing in Honduras. Phases I and II of the HECD program have been successfully completed, and Phase III is now entering the implementation stage, having just received funding from The Rotary Foundation (TRF) via a Global Grant. 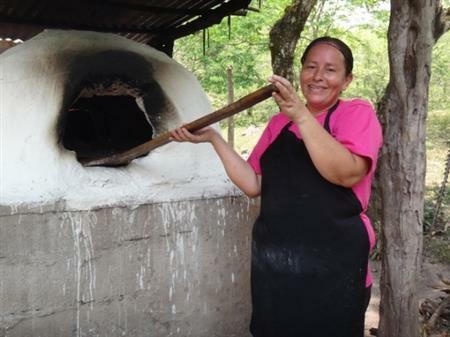 The initial phases of HECD addressed the need for providing small loans to family-based businesses (Trust Groups) through our Honduran Non Profit, Non Government Organization (NGO) - Institute for Development in Honduras (IDH). The HECD program has leveraged its partnership with Opportunity International Canada (OIC) to transfer the loan portfolio funds to IDH. It enabled loans in the capital Tegucigalpa, and a new branch in Santa Barbara. While these loans led to local employment and improved the lives of thousands of families, a new opportunity has been identified through Phase IV of the HECD program to expand the scope of microfinancing to have an even greater positive impact on local economies and families. 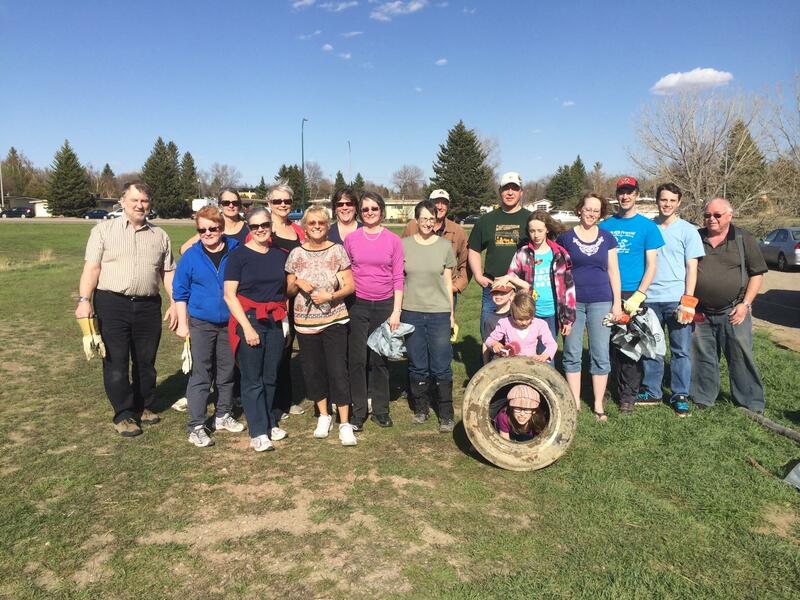 Learn more about this program and how your club can get involved. 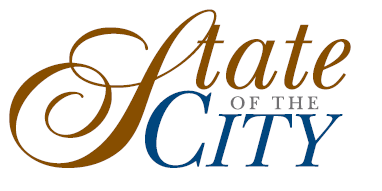 "The State of Our City." 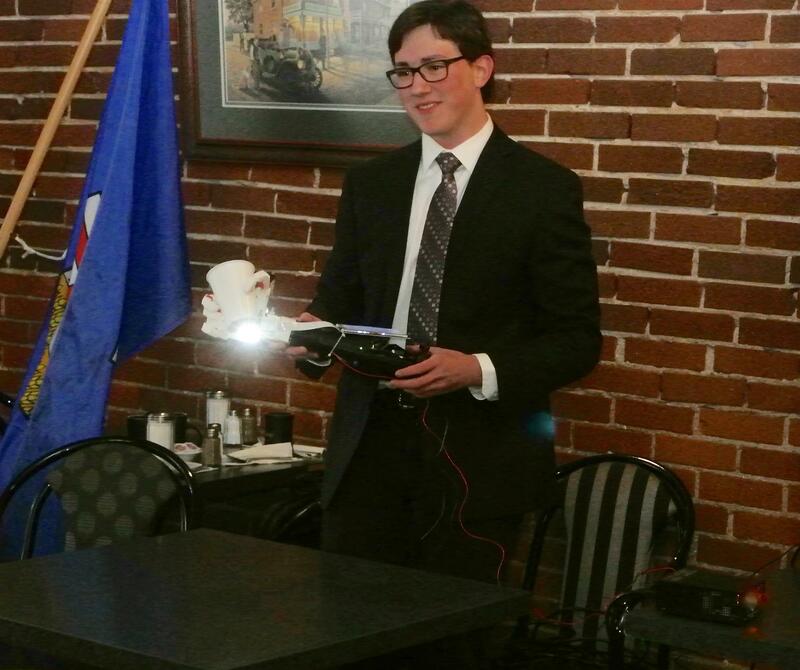 This week our treasurer, Daryn Wenaas, presents the budget. On Saturday 1 October, Bella went with Carol to enjoy the Illuminasia Lantern and Garden Festival at the Calgary Zoo. Illuminasia runs until 16 October this year. 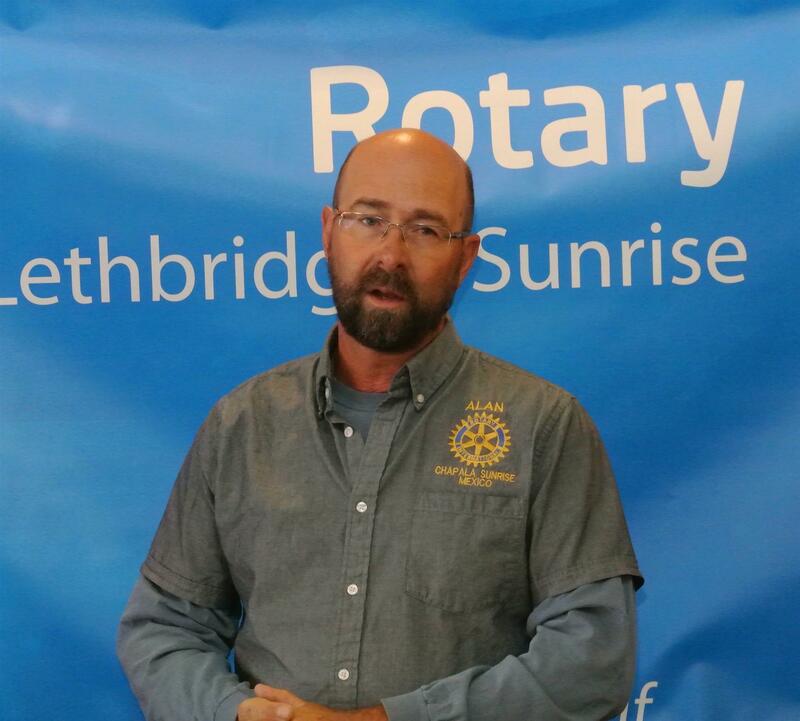 District 5360 Governor, Neil Berg, visits Lethbridge Sunrise this week. 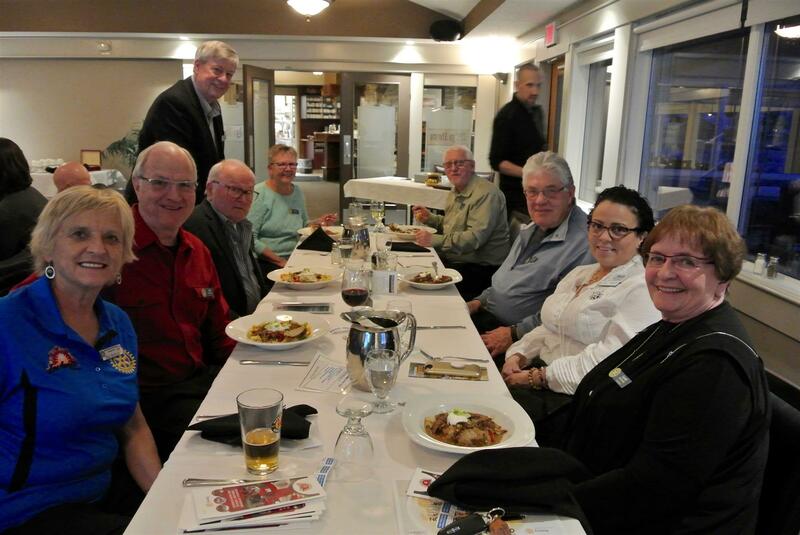 A great turnout for the Rotary Club of Lethbridge Mosaic's official inauguration. Mosaic president John Pogorzelski received Mozaic's official charter from DG Neil Berg. 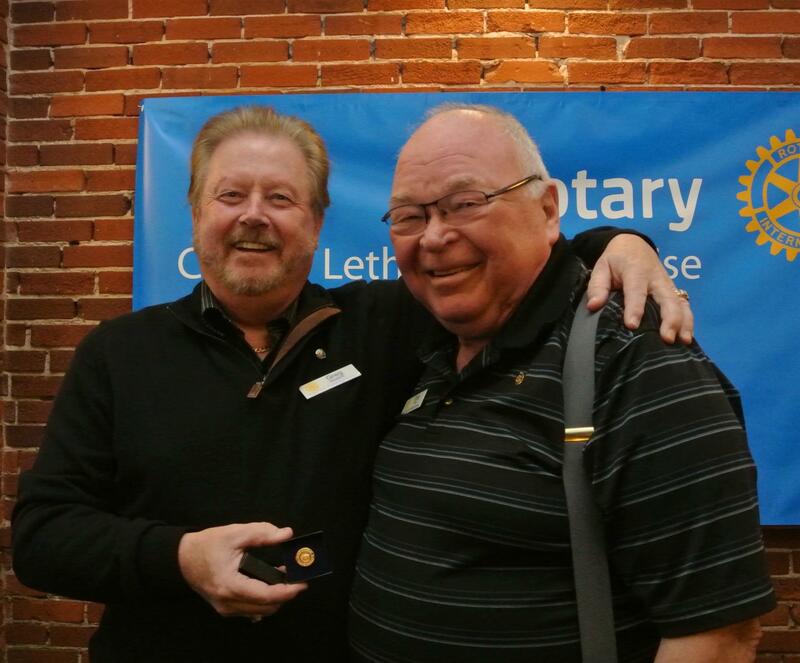 Lethbridge Rotary Club's president, and Assistant District Governor (ADG), Robin Hood were also at the meeting. 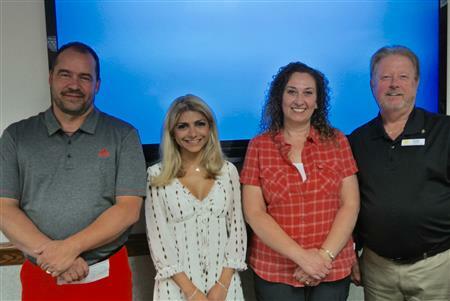 Our outgoing exchange student, Taylor Fulton, presented on her upcoming adventure next year in Brazil. 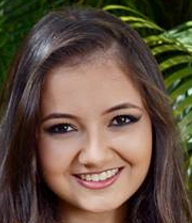 This is the video that Isabella, our exchange student from Brazil, presented last week. 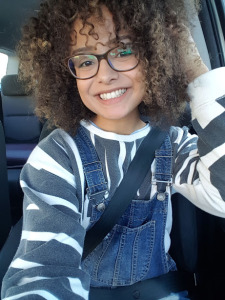 Isabella provided exciting information about Brazil and her hopes for her exchange to Lethbridge. She looks forward to experiencing snow, particularly skiing and making snow angels. Click on READ MORE... to see the photos. 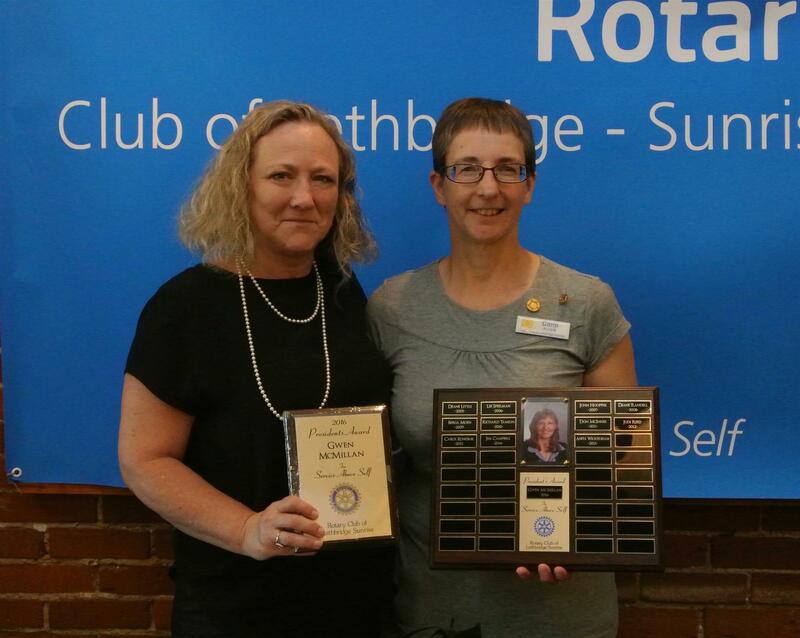 President Carol presents the 2016 President’s Award to Gwen. Carol described Gwen’s contributions as significant but always low key. 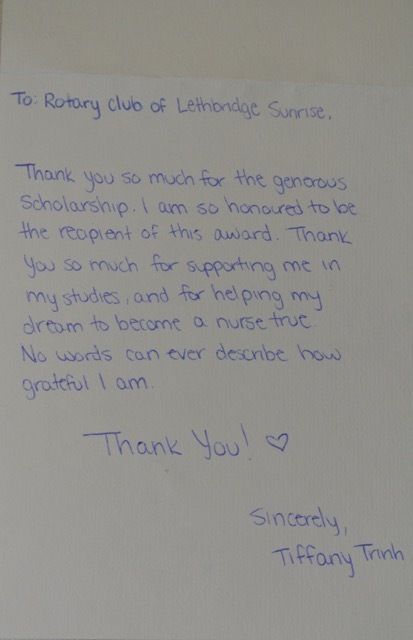 Congratulations Gwen, your good work is recognized! Marlys with the new Jack Reynar Cup before she presented it to the top winning LOCAL team, which was the U of L Fiat Dux. 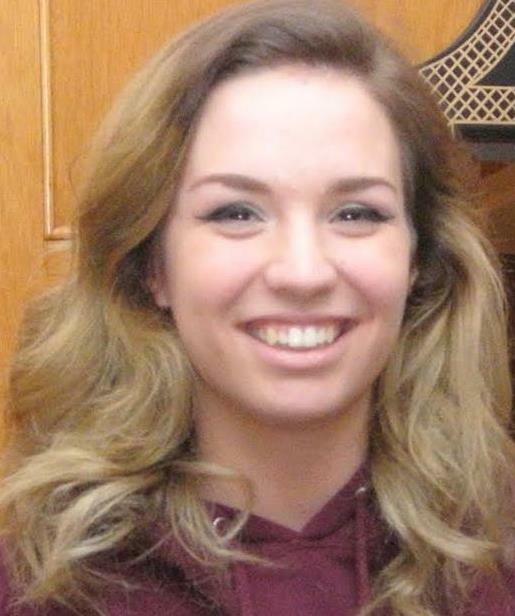 Our outgoing exchange student, Taylor Fulton, will present on her upcoming adventure next year in Brazil. 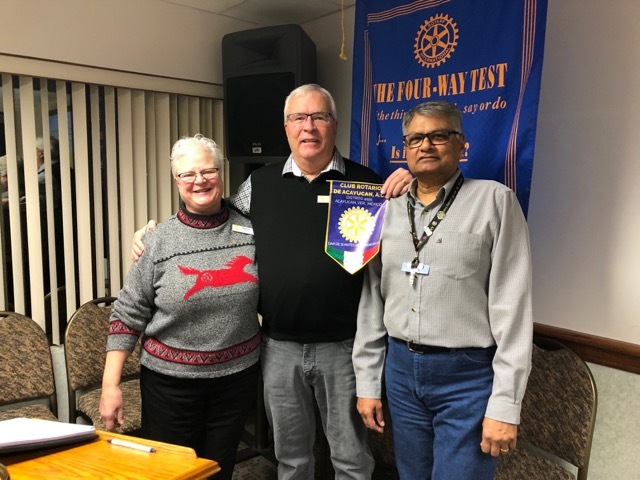 Our club's fifteenth president, Carol Kundrik, was recognized by our District Governor AND the President of Rotary International as a leader who helped our club be one of the best! 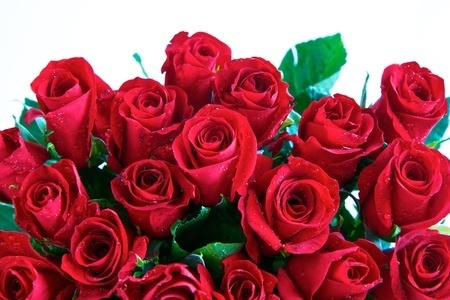 Thank you and Congratulations Carol! Adonus Arlett: RCMP Victims Services Unit; and new service dog. James Sanders from U of L: research on video game addictions. Tickets are $10.00 each and can be purchased at the door (kids under 12 are free). 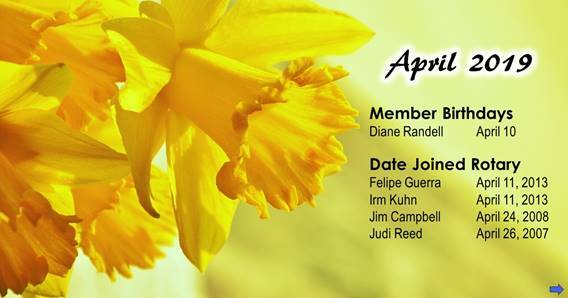 RSVP to Judi by May 26 providing ages and gender of kids attending. This is an event for all members and their families so encourage everyone to come. Everyone coming should bring appetizer or dessert or a garden salad. 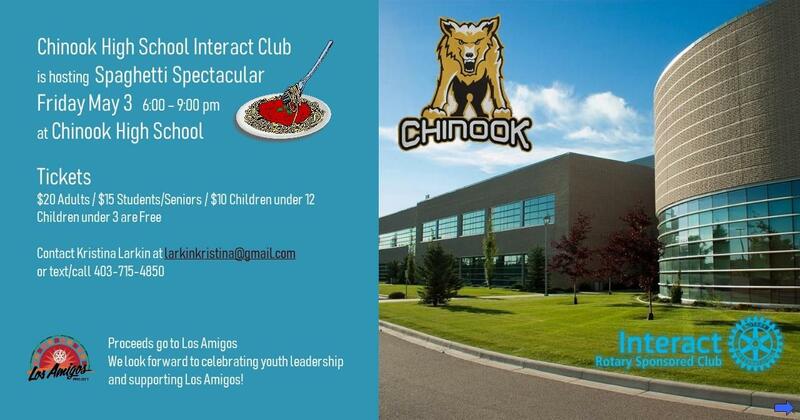 The Club will provide chili, chili dogs, soft drinks, coffee, paper plates, utensils, napkins, and Caesar salad. Cash bar - $5.00 per drink. Research on music and swimming/sport. Where are the Los Amigos Now? Our club's Rotary Exchange student Taylor Fulton with her parents Trevor and Shannon attended Thursday's Fireside Chat. 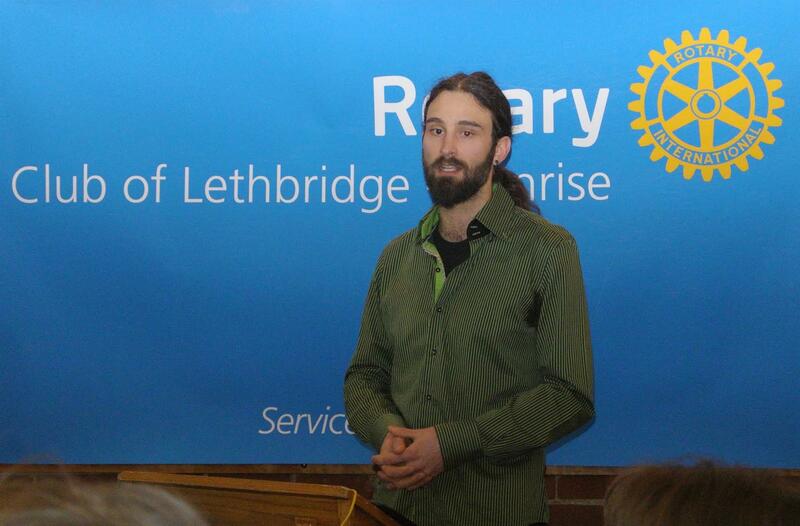 Josh Hellawell will speak about urban farming in Lethbridge. 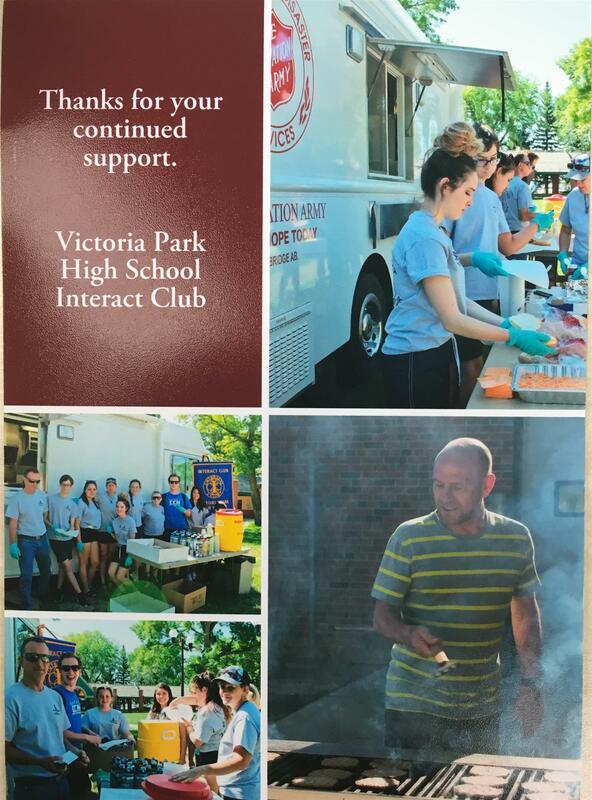 Lethbridge Sunrise is very excited about our new Interact Club at Victoria Park School, an alternative school. 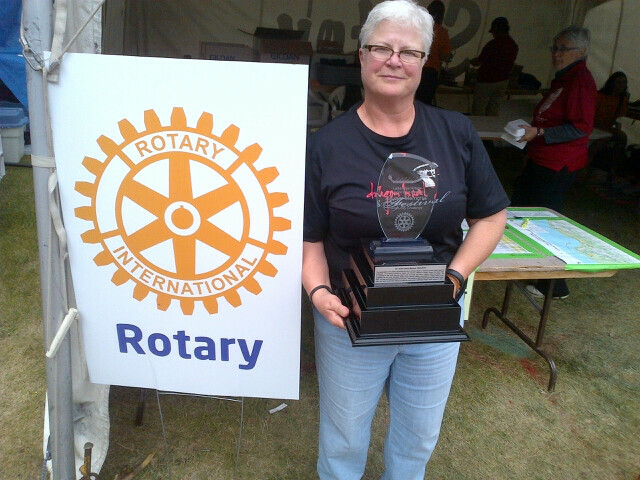 In memory of Jack Reynar, the man who did so much to bring Rotary Dragonboat Festival to Lethbridge. Princesses Superheroes & Villains was a Super Success! 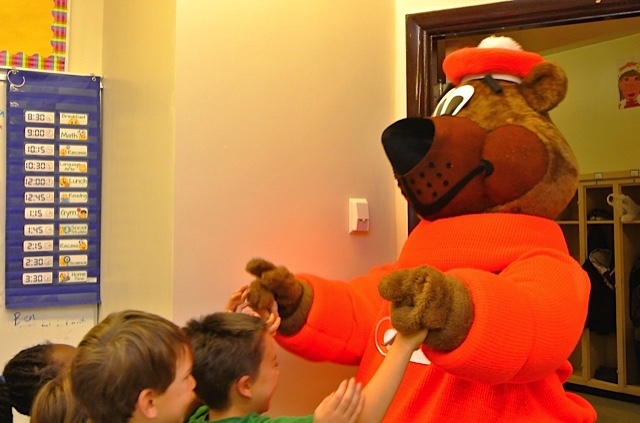 The Root Bear visited Westminster School on Wednesday morning, accompanied by our own Don Robb and a couple of his local superhero friends. The children had a super time. Below are a few photos of the festivities. 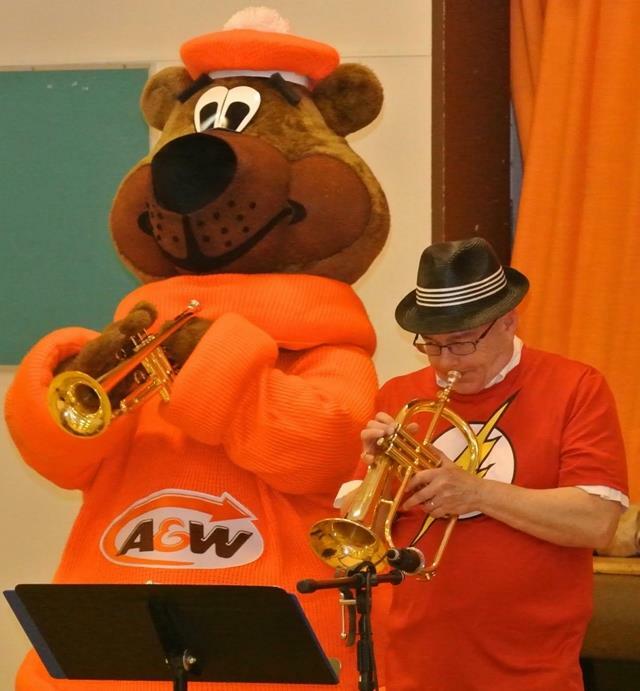 The Root Bear gives Don a few tips on playing the horn. 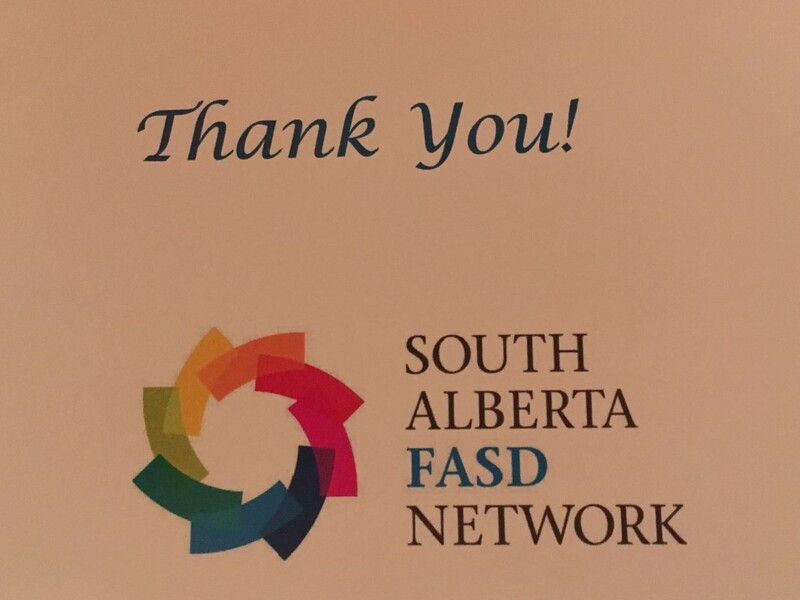 Rosie Digout-Ford shared the value of hiring disabled people and described the Lethbridge Family Services DaCapo Employment program. DaCapo pre-screens applicants and provides training and ongoing support. Click on the link to learn more about DaCapo Disability Services. If you are interested in hiring, call 403-320-9119. 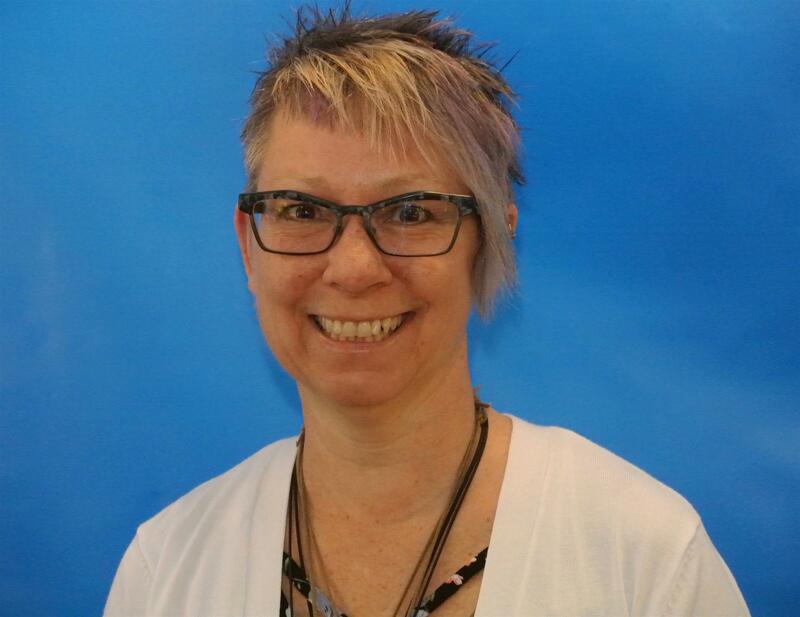 Rosie Digout Ford from Lethbridge Family Services, will speak about DeCapo Employment Services. The meal to end polio is scheduled for Saturday 23 January 2016. 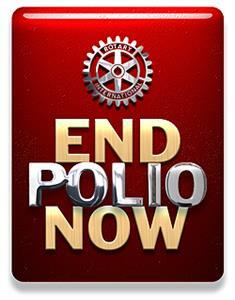 Due to circumstances, the meal to end polio is canceled at this time. 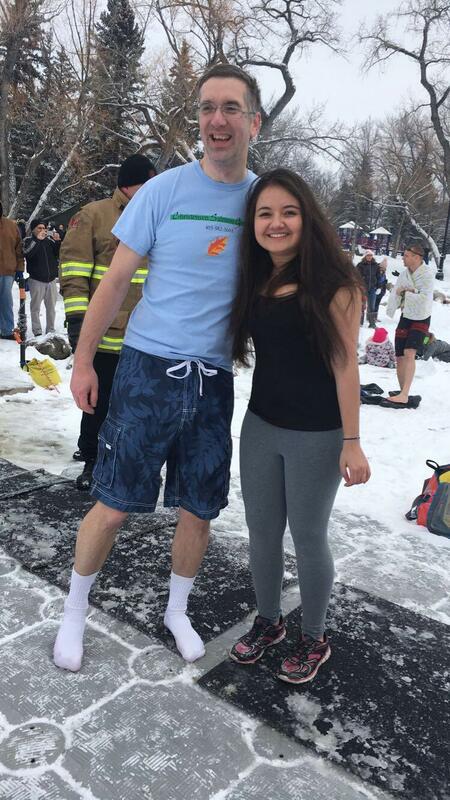 President Carol has had too many issues to have time to do any planning on this at all, so she had to make the call. 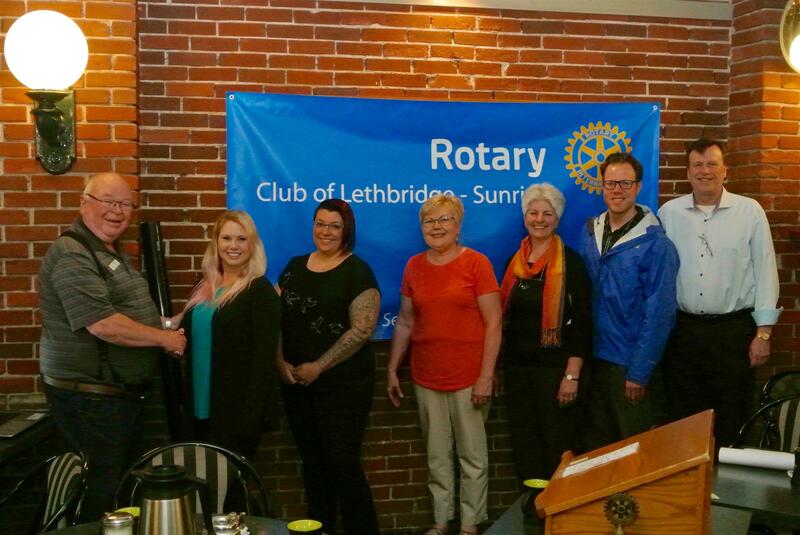 As a Volunteer Lethbridge Leader of Tomorrow recipient, Michael is presented with a $1000 scholarship from Rotary Club of Lethbridge Sunrise. Congratulations Michael! 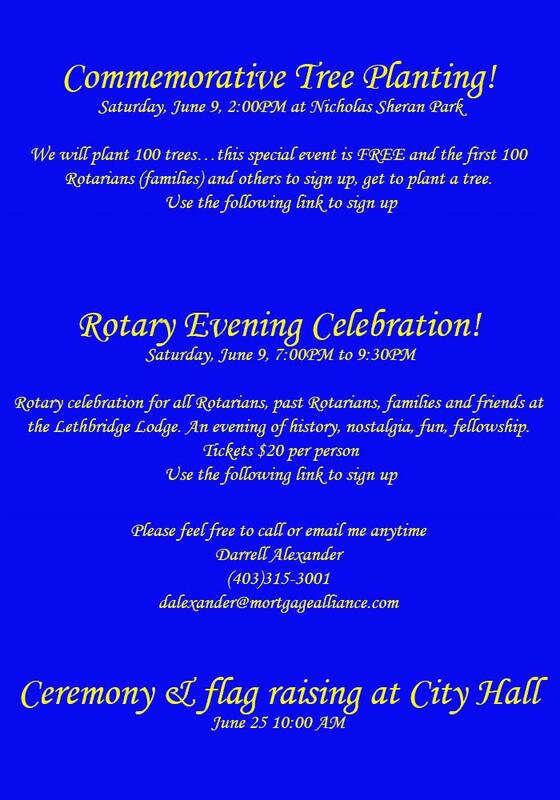 Special thanks to Rotary Club of Lethbridge Sunrise for providing 2 scholarships to Leaders of Tomorrow recipients in 2015. 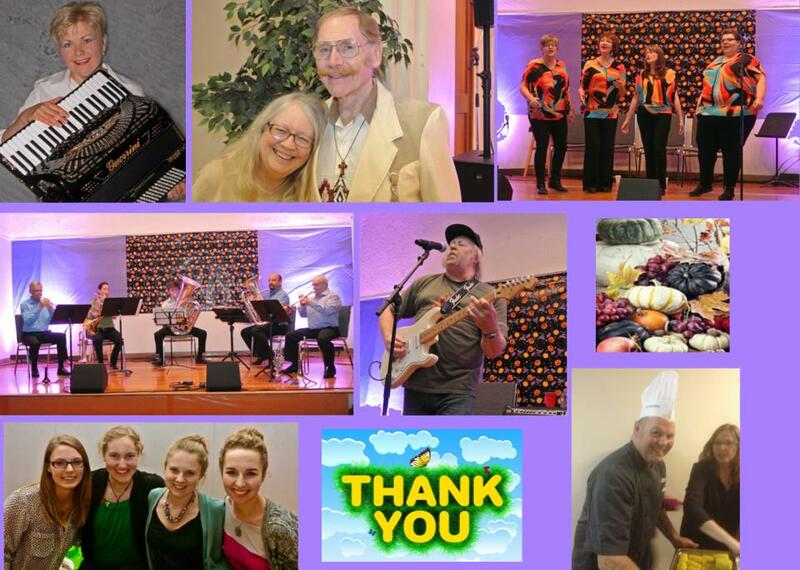 Soup Sisters and Broth Brothers makes nurturing and nourishing soups for women and children affected by domestic abuse and youth in crisis. crisis. 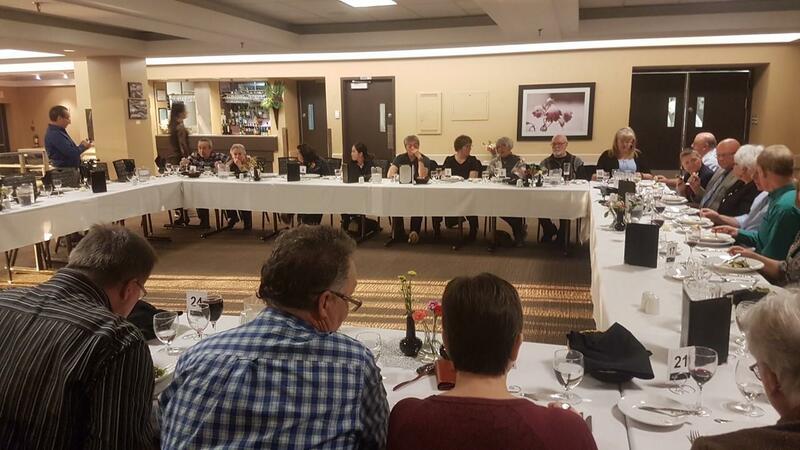 The cost for a Soup Sisters event is $55/person which includes all of the fresh ingredients, a Chef facilitator, wine and a light meal. 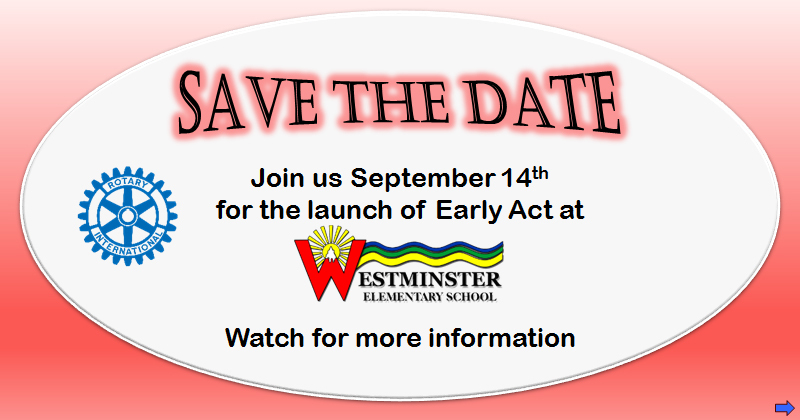 to go to our website calendar for this event and click on the above date to register. The pass code to register is goodsoup. Follow the instructions for payment. 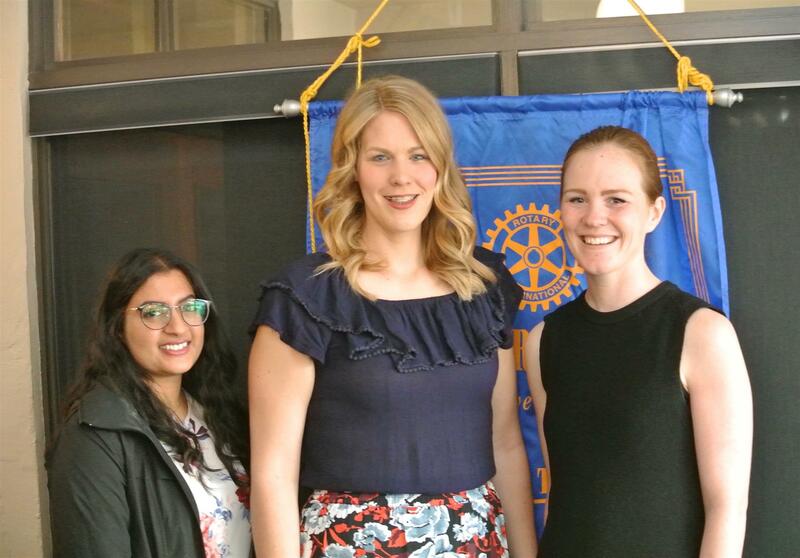 The Rotaract club is trying to get a vocational pairing program going with a goal building connections between Rotaractors and Rotarians, while allowing Rotaractors to gain understand of different vocations they are interested in. 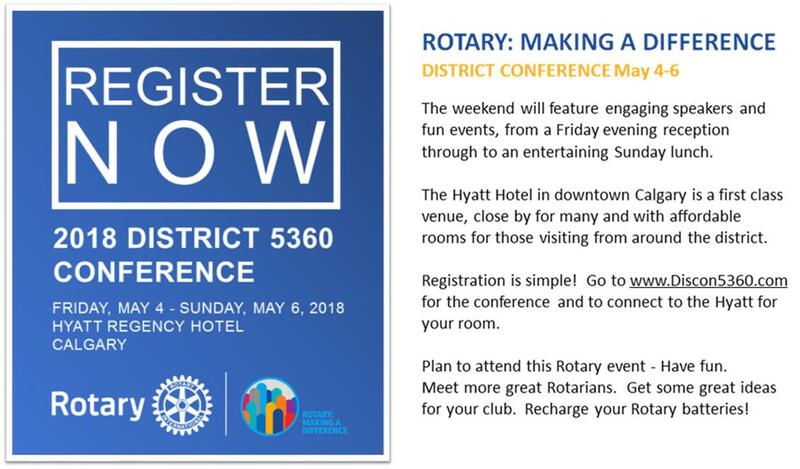 For this program we hope to have a list of Rotarians who would be interested in sharing career advice one-on-one with a Rotaractor who is interested in the field/career the Rotarian is or was employed. 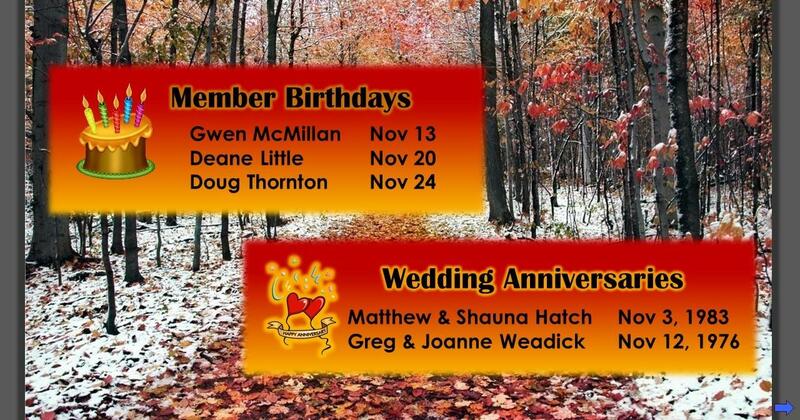 Please let me know if you or any of your club members would be willing to put their name on our list. Putting your name on our vocational list does not guarantee matching but if you are matched with a Rotaractor the time commitment is minimal and may include emails, going for coffee, a workplace tour and/or anything else. 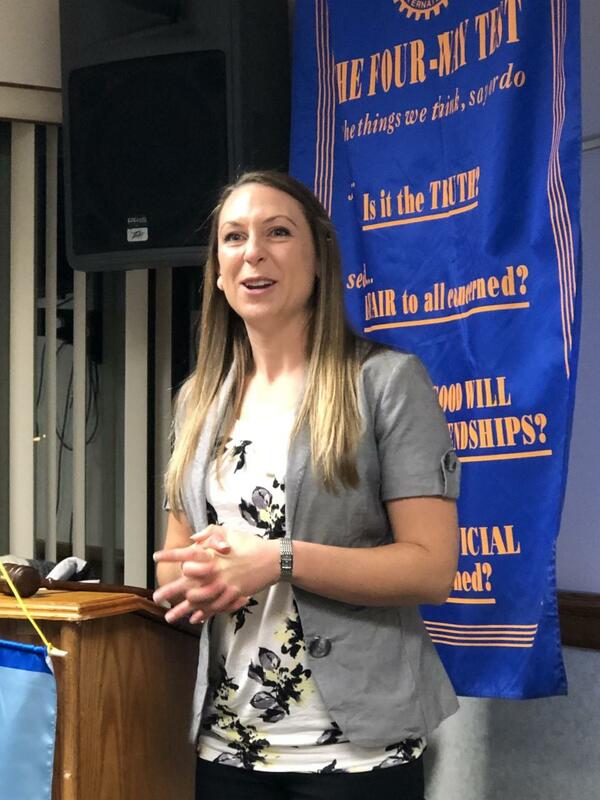 Let Katie Wilson know if you have any questions about this program. Banners - We visit; they visit. 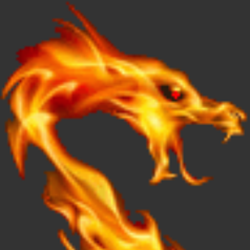 There is now a new menu item on the top of our home page called Banners. 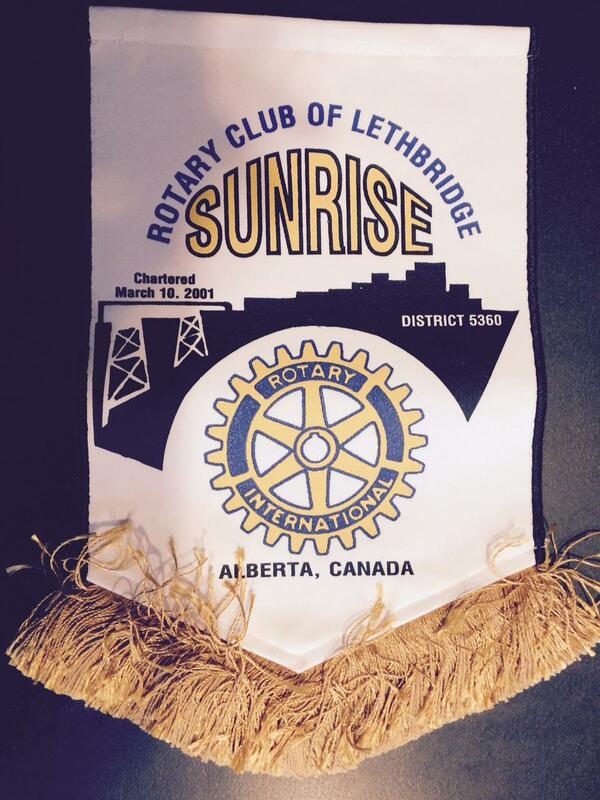 It shows all of the banners that Lethbridge Sunrise has collected/received. 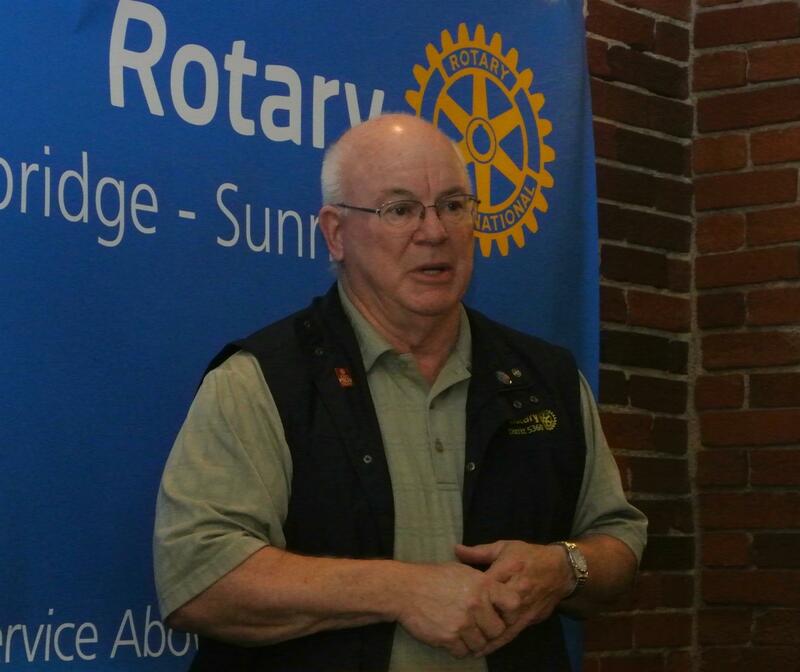 Greg Tiffin speaks about the polio virus. 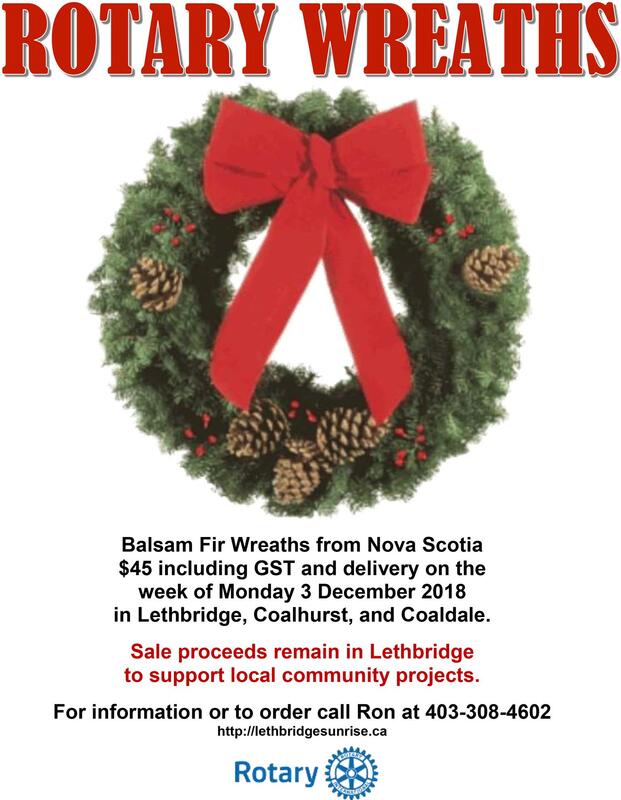 Read all about it in the Taber Times. 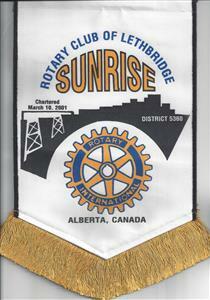 T o make our club's banners available for all to see at any time, we are scanning them and placing them in a photo album on our website at lethbridgesunrise.ca. 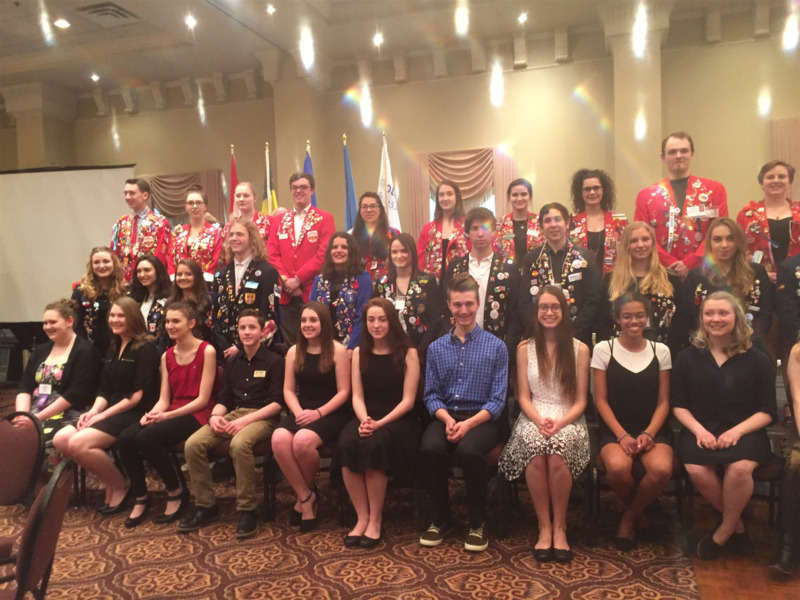 The banners that visiting Rotarians and exchange students have left us and the ones that our members have received through their travels. Please bring in your banners. 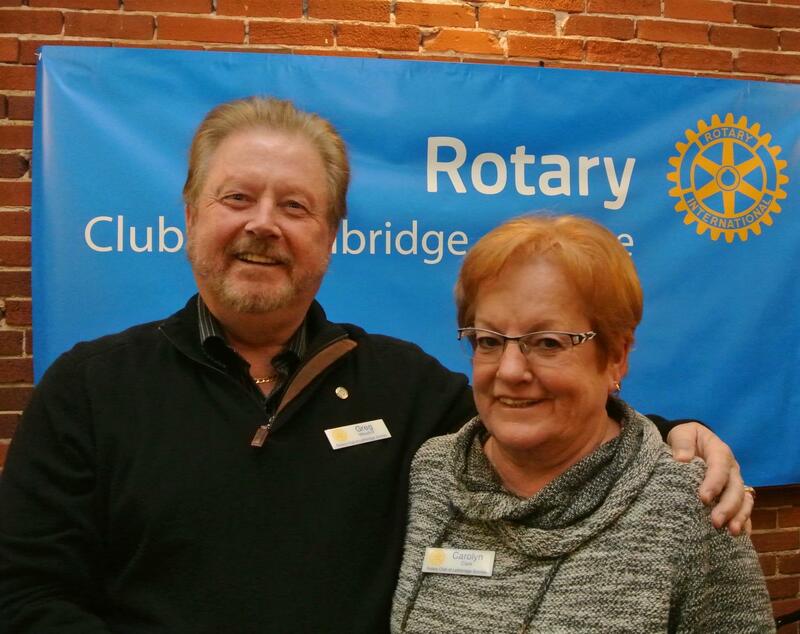 Don and Carol will speak about the Rotary Foundation. 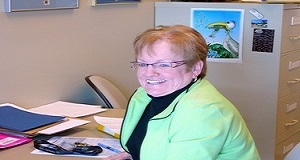 Remember to Congratulate former president Barb Kinahan on her new role as retiree. She finally figured out how to escape to a new life of leisure. and this year win the coveted most visitors award! community owned water projects in Honduras. Join the walk to end polio on Friday 23 October 2015. 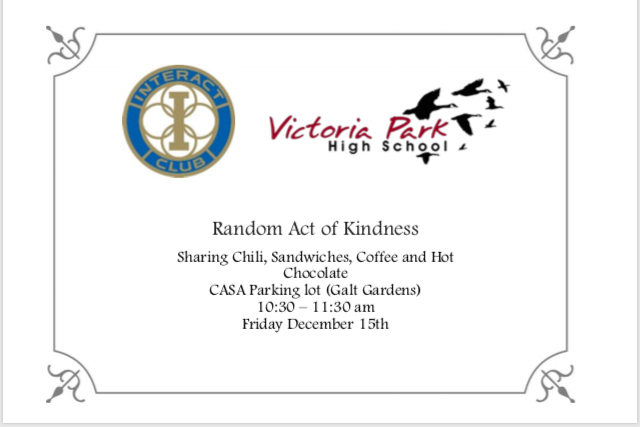 It starts at CASA (3 Ave & 8 St) at 3:30 pm and ends with a reception at City Hall. Last year's walk participants all received lovely red rain jackets! 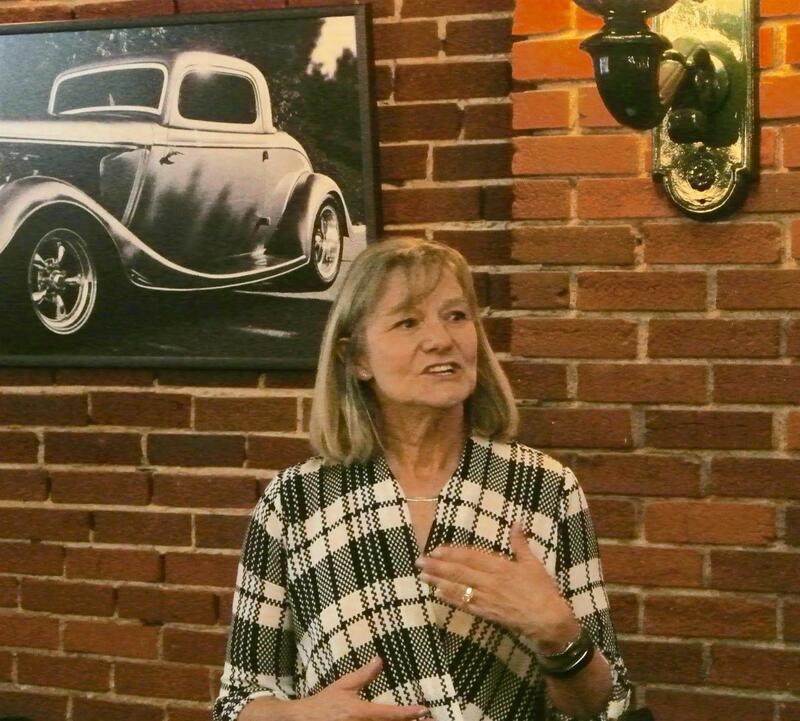 Last Thursday we had an impassioned speaker. 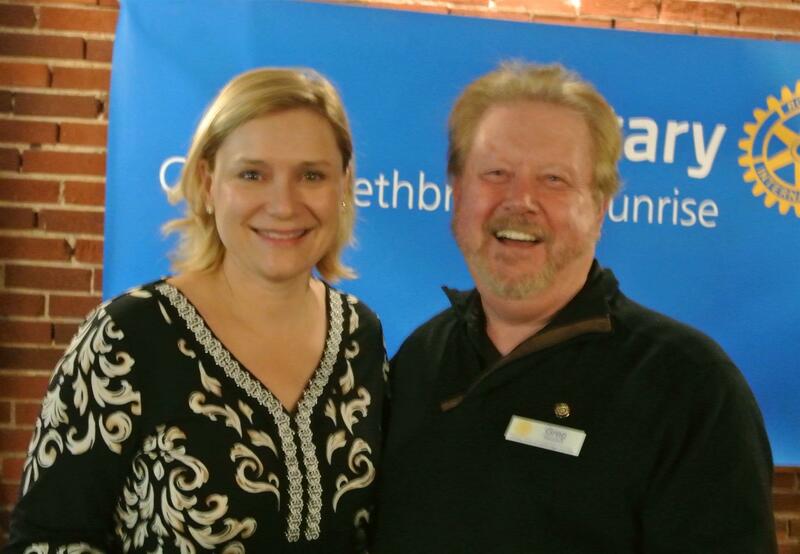 Dr Robin Bright from the University of Lethbridge shared some of her research into Middle School Literacy. 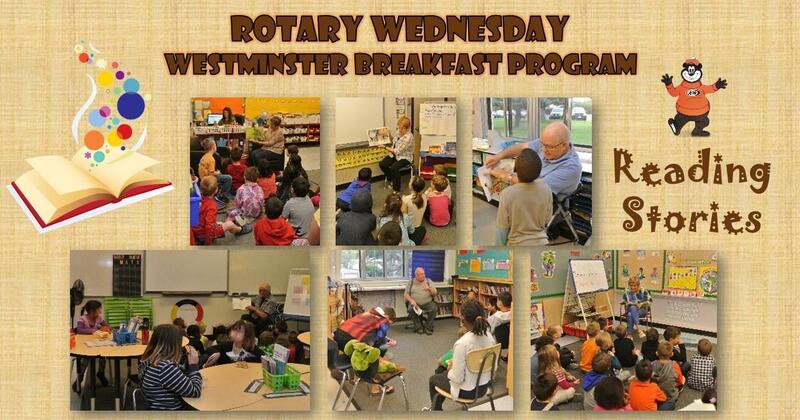 It was delightful to hear someone speaking so passionately about literacy, which is one of Rotary's areas of focus. 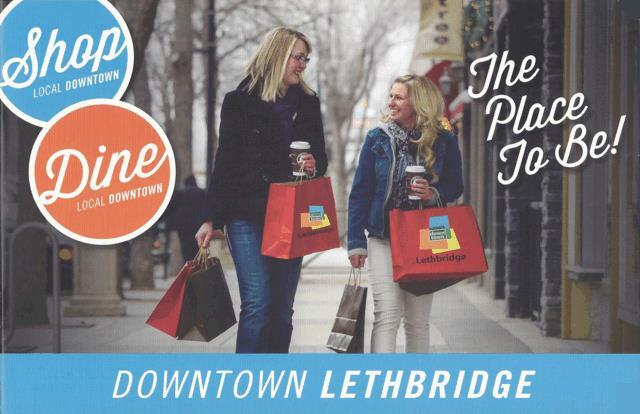 It's great to hear about the good work that is happening right here in Lethbridge. Chris Ritter took his first trip to Honduras just this past April. 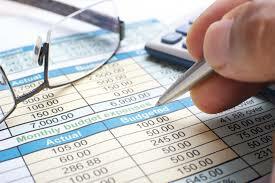 His classification is accountant and he has done the math. 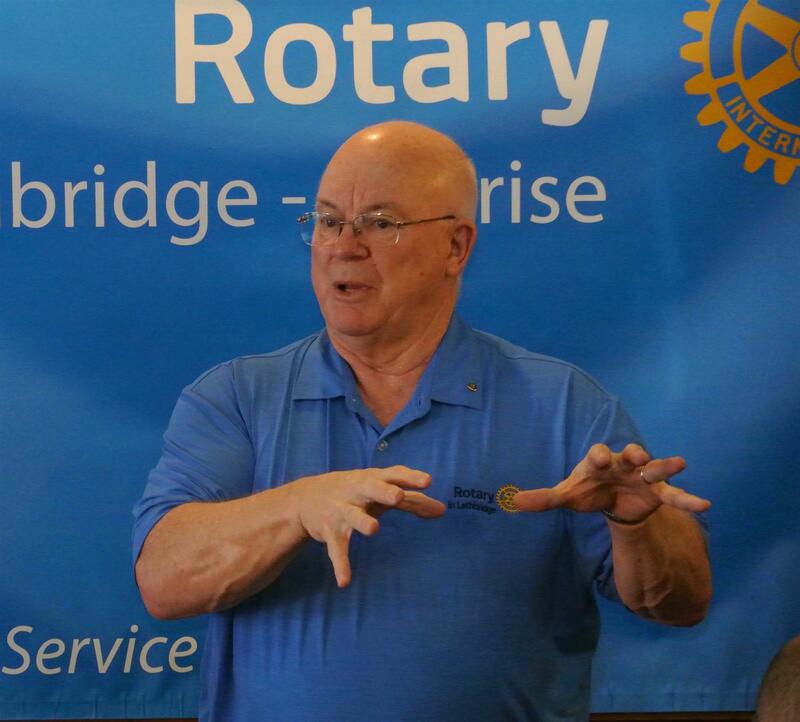 His Rotary Moment was in the realization that microcredit offers the most impact for the dollar and how many people are able to benefit. 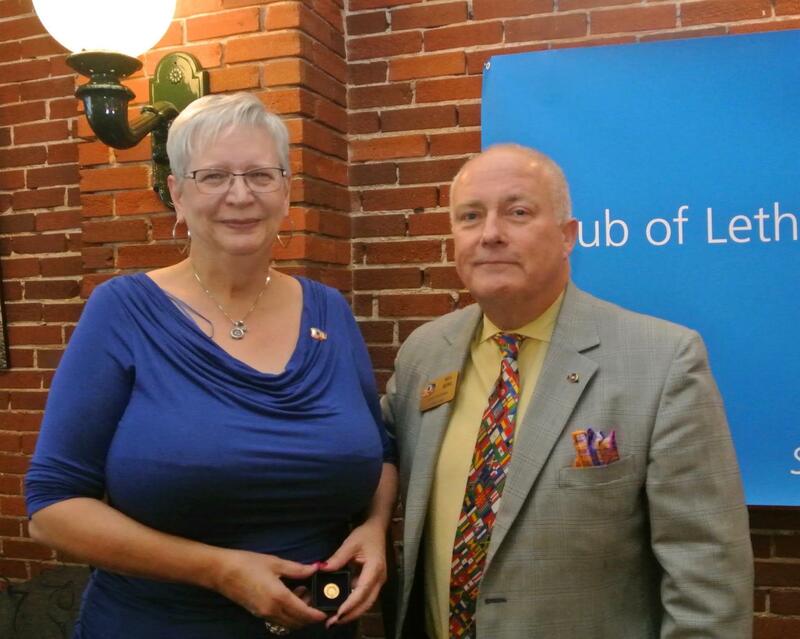 Ian Greg and Judi recieve Paul Harris pins. 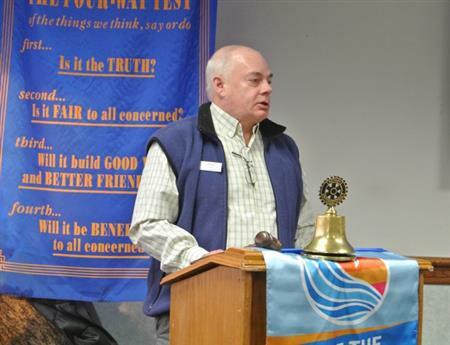 DG Martin Harvey visited our club last week. 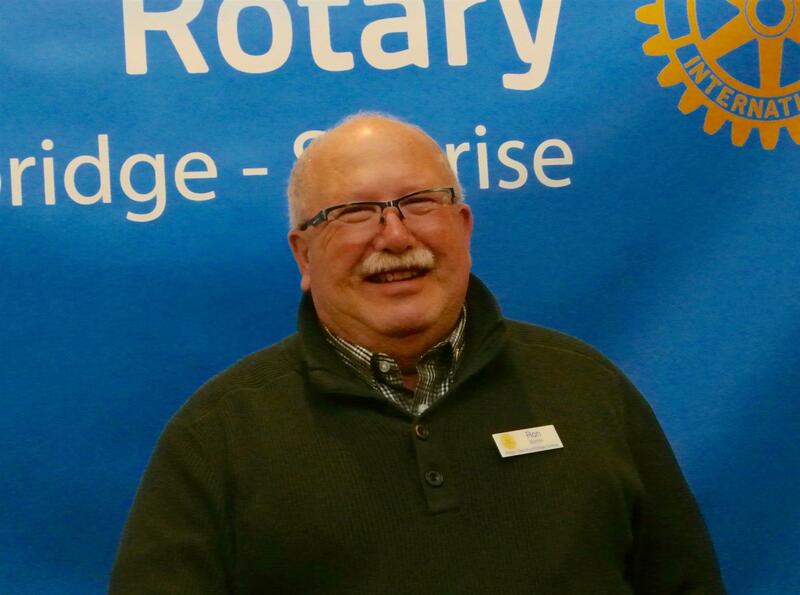 Welcome to our newest member, Don Robb. 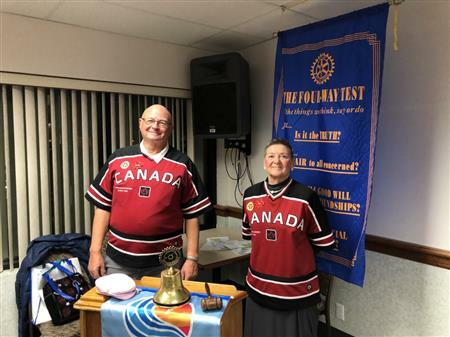 Club Meeting October 27 at 7pm in Andy's Place. Click on More...for a map to Andy's Place. 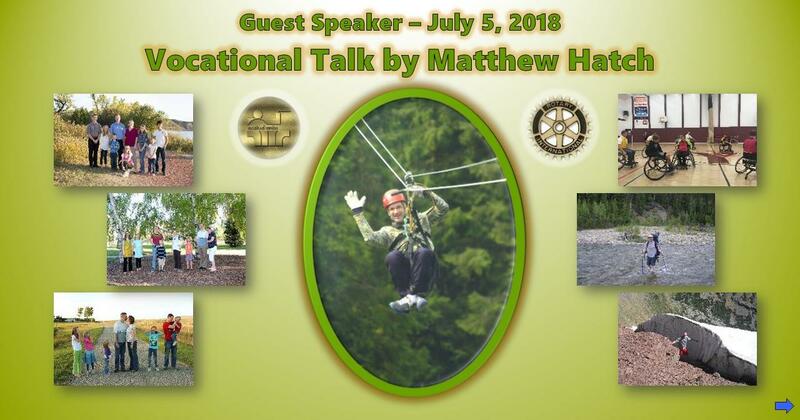 Our next speaker is the District Governor with two first names, Martin Harvey. 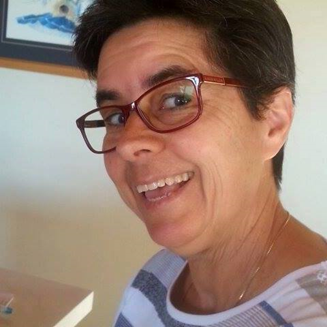 In memory of our dear friend, Inga Jesswein, who passed away Monday 28 September 2015. 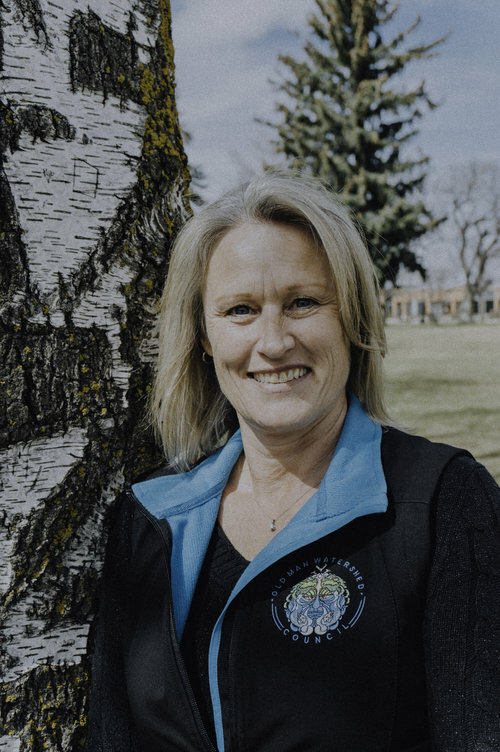 Inga was the sixth president of our club (2006-2007) and was deeply involved in Rotary. 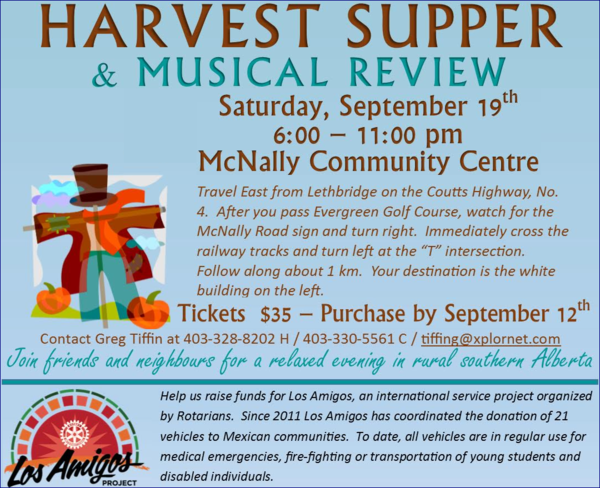 Last Saturday's Harvest Supper and Musical Review to raise funds for the Los Amigos project was a success! Thank you to all the kind volunteers who donated their time and talents. 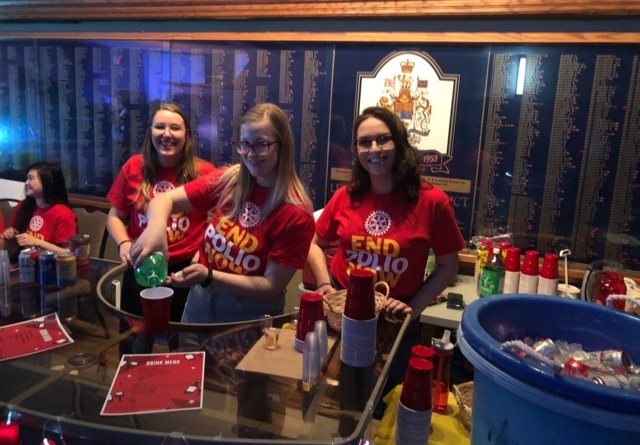 These include the U of L Rotaract Club volunteers, Darrell Harris of DB Lighting and Sound, Chef Wilco van Dijk, all five musical acts (Vi Knox Accordion, Rainey Day Music Duo, Karma Ladies A Capella, Bridge Brass, and Bruce Roome R&R), and of course, our own club's volunteers. 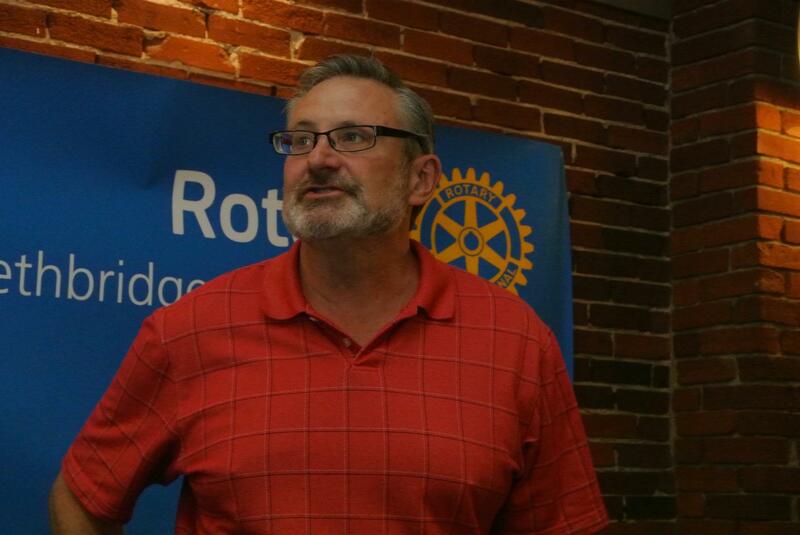 Dr. Drew Cahoon, is a member of the Raymond Rotary Club. 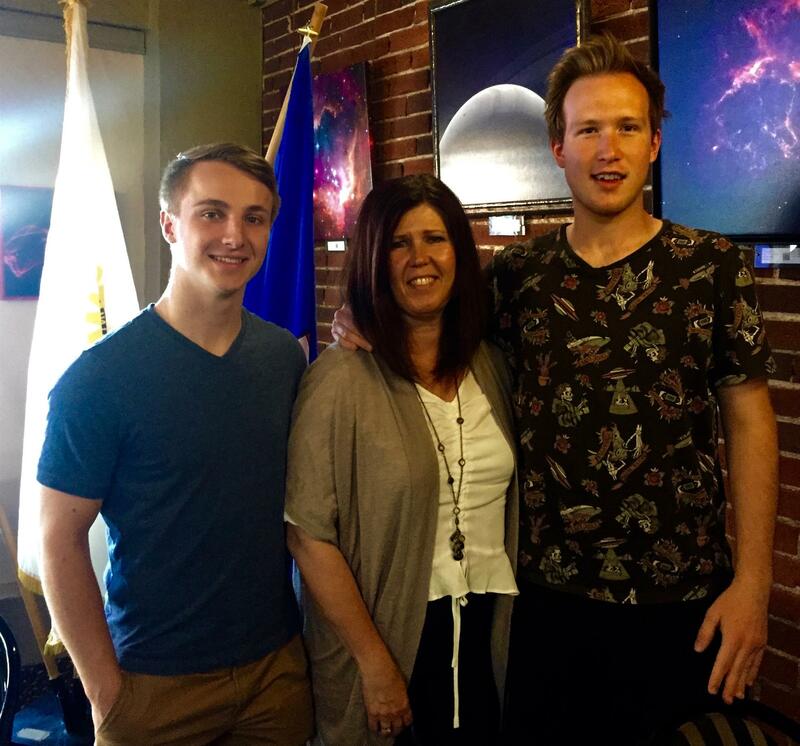 Drew recently returned from a tour of dental facilities in Africa. The reason? He has led a program which has supplied 90 per cent of the equipment to three dental schools in Rwanda, Burundi and Uganda. Also on his itinerary, 23 hospital dental clinics at which his group has supplied dental chairs and a lot of other equipment. We can expect a lively and passionate talk about how a small town Alberta dentist got so interested in dental health in deepest Africa. There is so much more to BRZ than we thought we knew. 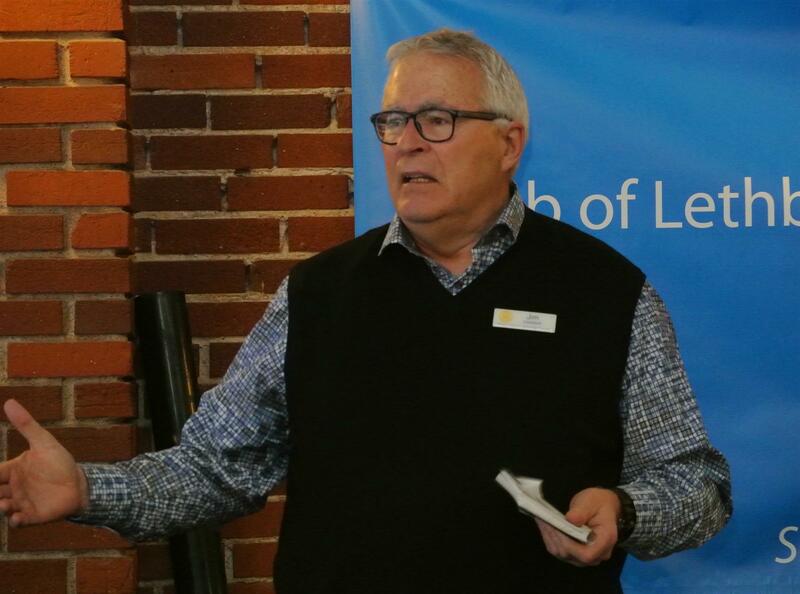 Last week's speaker, Dr. Roy Goldsteyn, spoke of his research into buffalo beans at the University of Lethbridge. 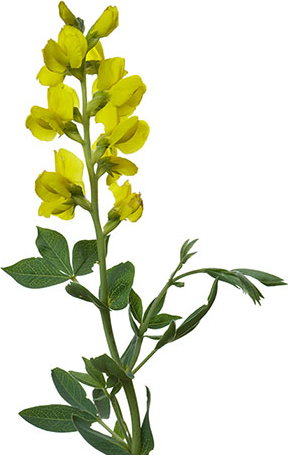 Experiments show compounds extracted from buffalo bean leaves have potential to fight a class of cancers that includes multiple myeloma. 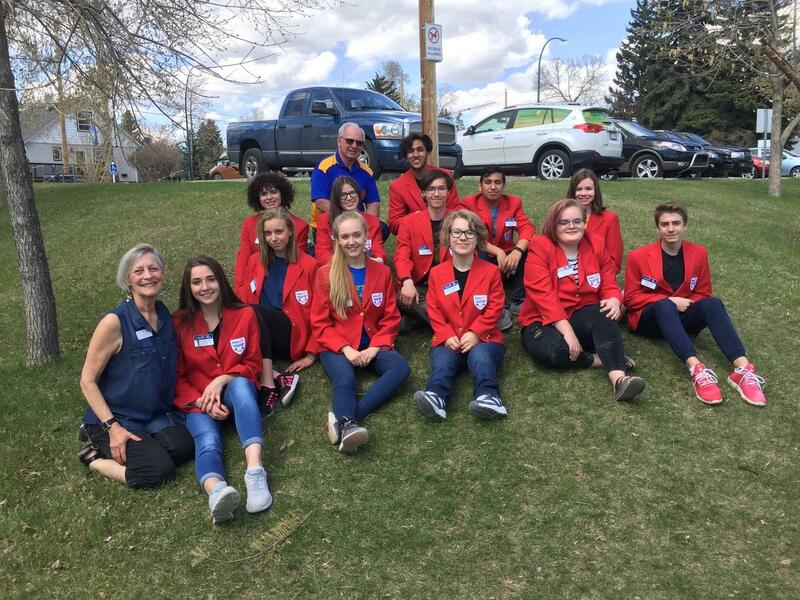 Every year Rotarians from the Areas around Waterton and Glacier gather together for a weekend to celebrate the First International Peace Park which Rotary was instrumental in creating. 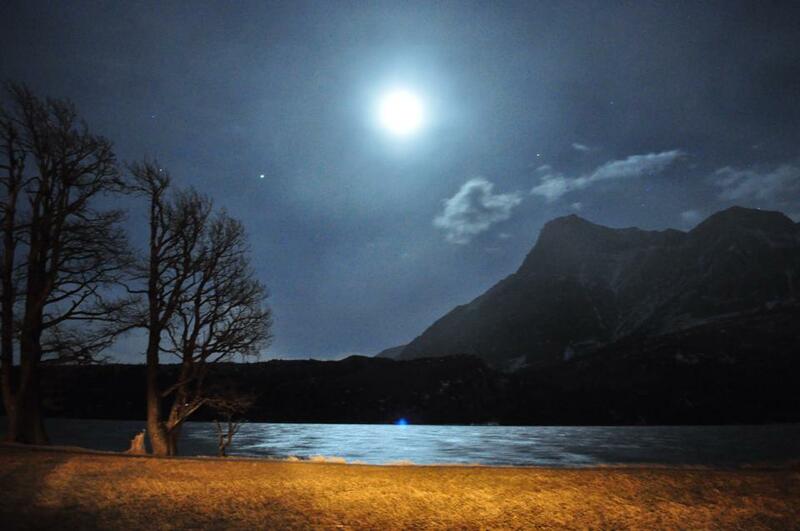 This year the Assembly will be held in Waterton. This Assembly traditionally fills up so do not wait to long to book your spot. And discover the benefits thereof. Katie and Seth from UofL Rotaract Club presented their club's achievements last year and their club's goals for this year (2015/16). Projects supported include: Polio Plus, Cancer Research, Autism Swim Even, and Nicholas Sheran Playground. 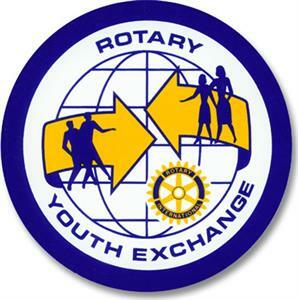 Next week Rotaract is organizing the program and hosting the YEX students at the Peace Park event. 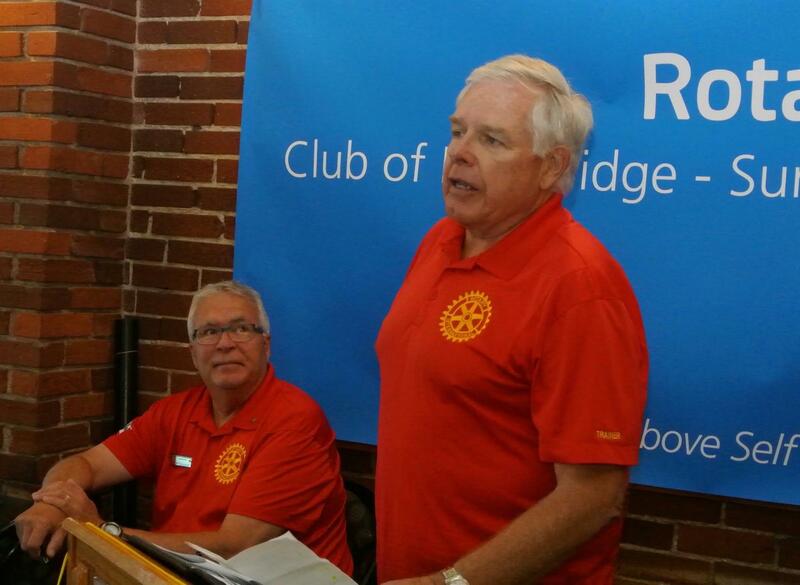 Along with Lethbridge East, Rotaract is supporting the Pallet School project in Mazatlan. Their contribution is $38000 to the $65000 budget. At the last District Conference, they received the Best Rotaract Website award. 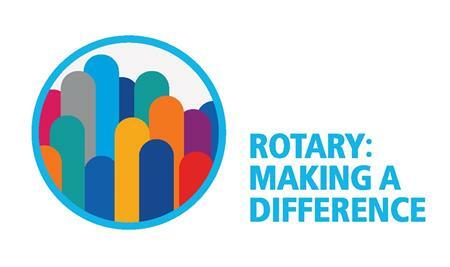 Last year, Rotaract's Attendance Challenge saw 144 Rotarians and Friends attend Rotaract events. This year they hope for even more. Their first meeting this year is at 7:00 pm on 24 September at the UofL campus. Everyone is invited. This video is only 166 seconds long. 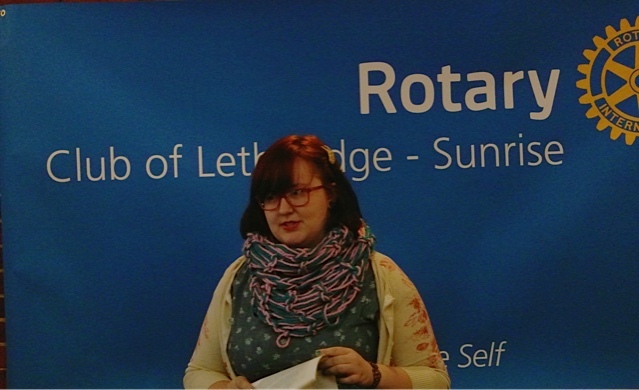 Katie Wilson - University of Lethbridge Rotaract Club. 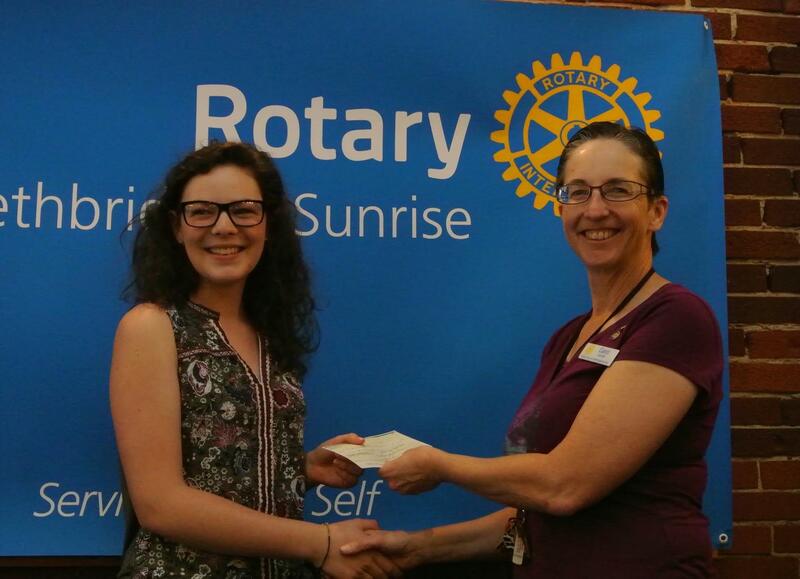 Genna Bourchier, Leaders of Tomorrow recipient, recieves a $1000 scholarship check from President Carol. 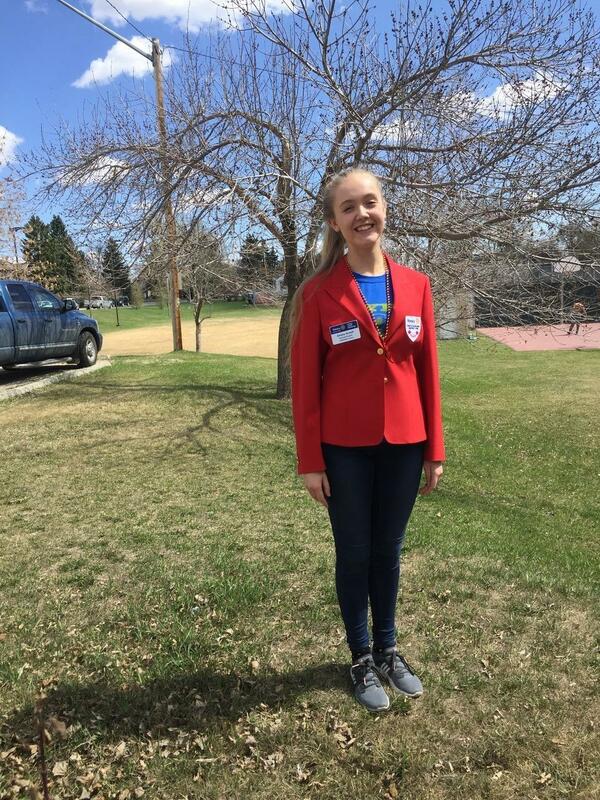 Genna started volunteering at age 13 and has worked with Project Paintbrush, a volunteer group that helps seniors and special needs residents. They completed 24 projects this year. 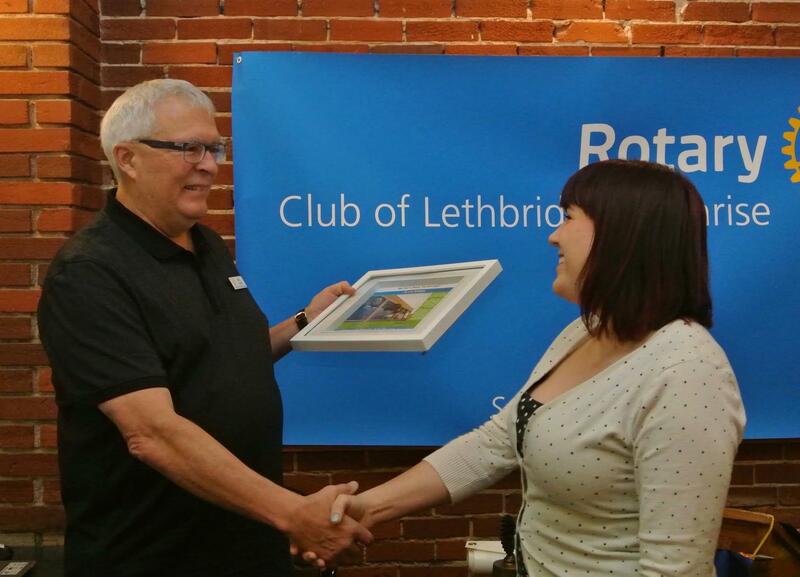 She has also volunteered for Lethbridge Dragonfest. 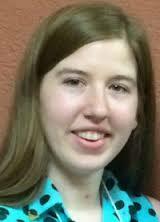 Genna is now in Wolfville Nova Scotia where she is starting a Business degree at Acadia University. Trip to Cote d’Ivoire, West Africa in November 2015 to participate in a polio immunization exercise, attend the 10th Annual West Africa Project Fair, and engage in a hands-on work project. Click here to view a full description and application form on a five page PDF. 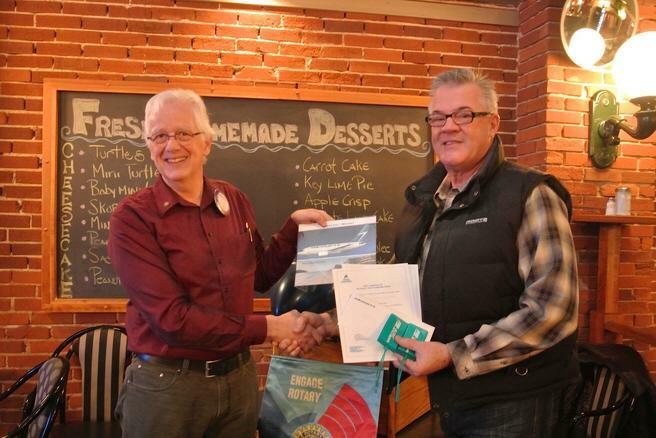 Last week's speakers were Jim Campbell and Wayne Stewart. 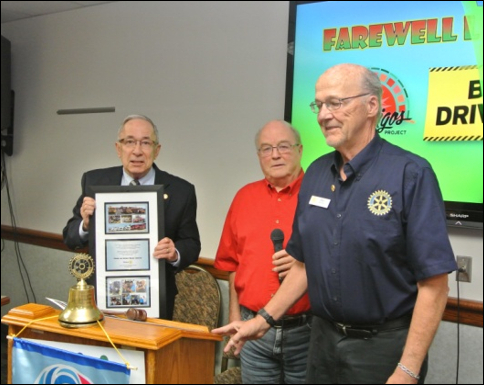 Jim spoke of the first five years of Los Amigos; Wayne spoke of the first year of the emergency service training. 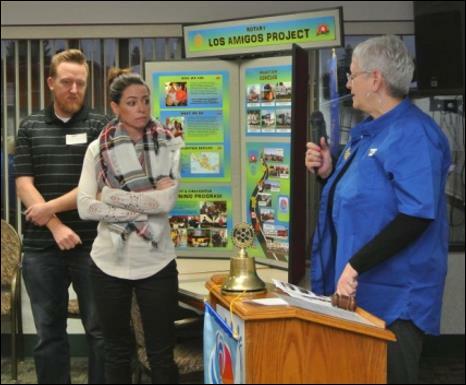 The Los Amigos project is now a well known project in the Rotary 5360 district. 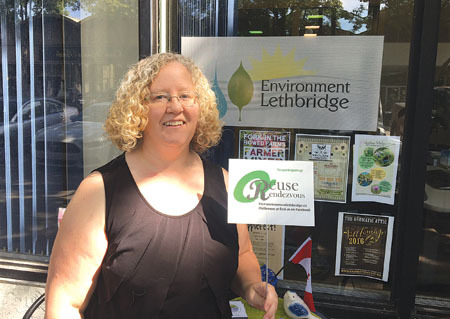 "Have you ever wondered how the streets of downtown Lethbridge get to be so clean and well maintained? Well, all the work comes from a small program that underwent several changes throughout the years and became what is currently known as the Clean Sweep Program (CSP). 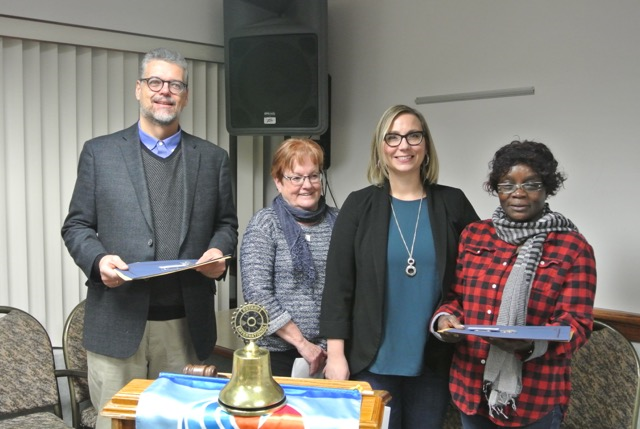 This program is dedicated to helping individuals who are in need of work while giving the downtown core a respectful appeal by cleaning up garbage, sweeping the dirt off the sidewalk, shoveling snow in winter, and maintenance." 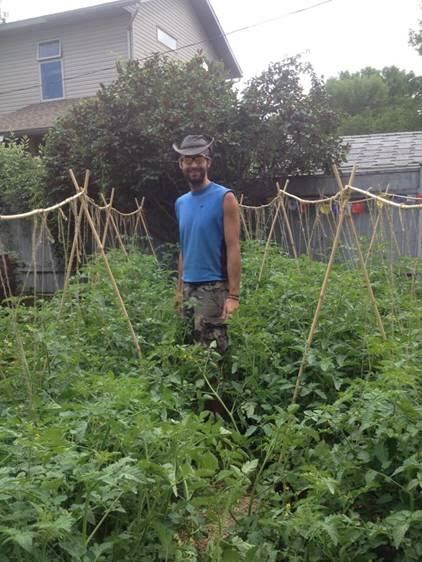 Many of the programs participants are available for odd jobs or occasional work projects. If you are interested in supporting The Clean Sweep Program, please call the Program Director, Jeff Wall, to discuss your needs. Assumption school is building a new playground and are looking for volunteers as their school is quite small. They are doing the build from Wednesday, July 29, 2015 to Saturday August 1, 2015. They require 40 volunteers a day. Some of the work is physical, helping to carry and putting playground pieces together. Some of the jobs are not very physical: attending the first aid station, helping at the water station, or cleanup crew. Currently they have about 10-15 volunteers every day. If you are interested in helping, please let Carol know by Thursday July 23, 2015. Paco reviewed his year with us and shared his sincere heart-felt thanks to his host families and all of us for making this a year of memories. 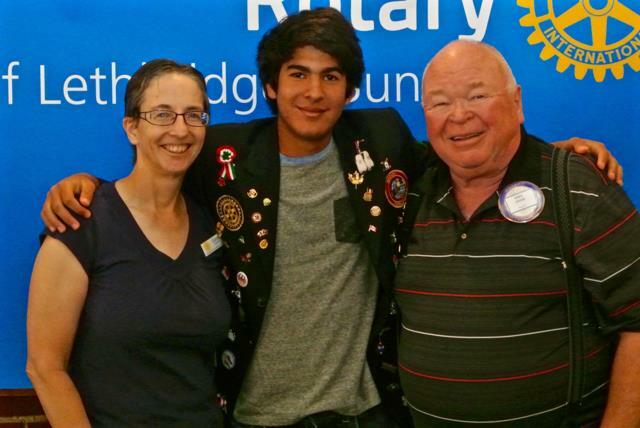 Paco says he wants to stay involved with Rotary. 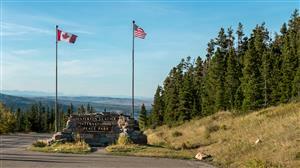 July 29th - Head Smashed in Buffalo Jump field trip from 8:30 am to 4:30 pm. 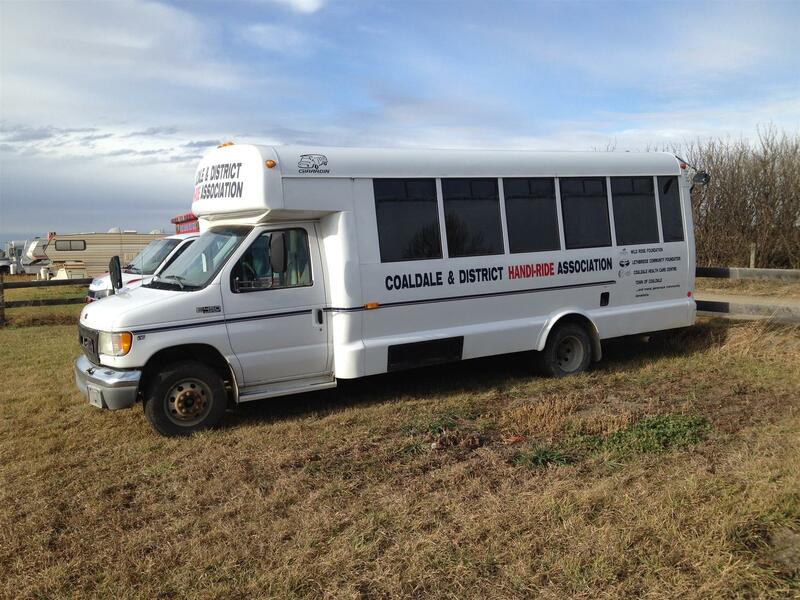 Volunteers would help supervise the kids as they take a bus and learn from the staff about Head Smashed in buffalo Jump. 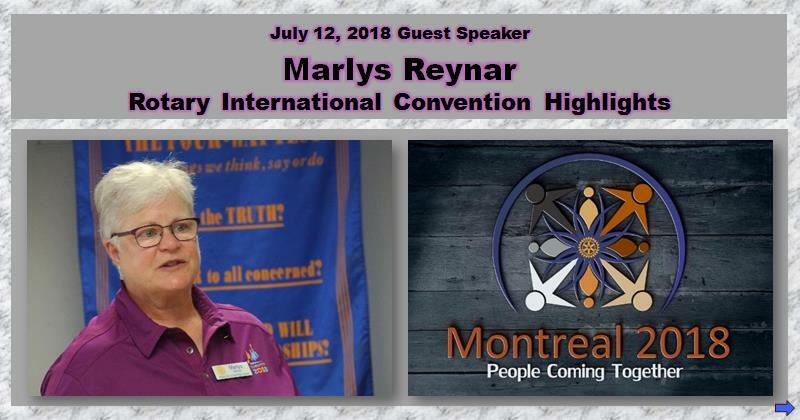 If individuals wish to volunteer, we will need a couple of forsm signed so we would ask for you to respond back to Robin about who is attending prior to July 24th. 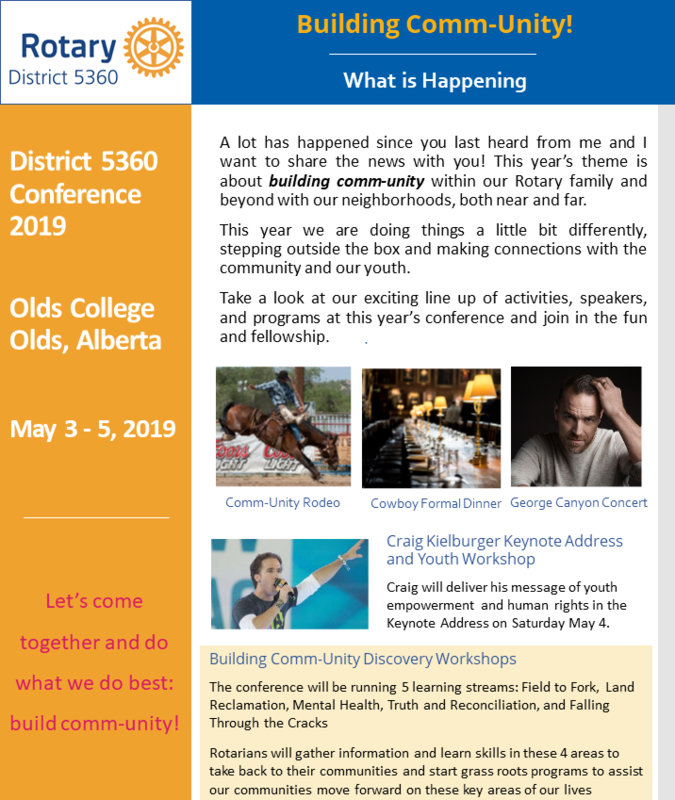 Who read the District Newsletter? 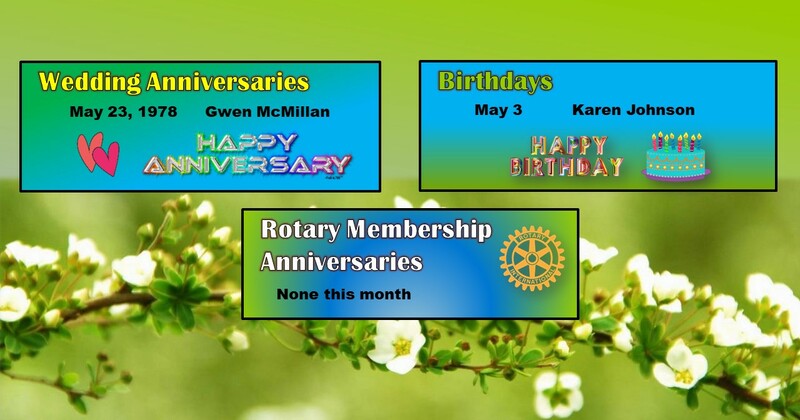 The first person to email Carol with the names of the two Rotarians from our club featured in this month's District Newsletter will win a prize! 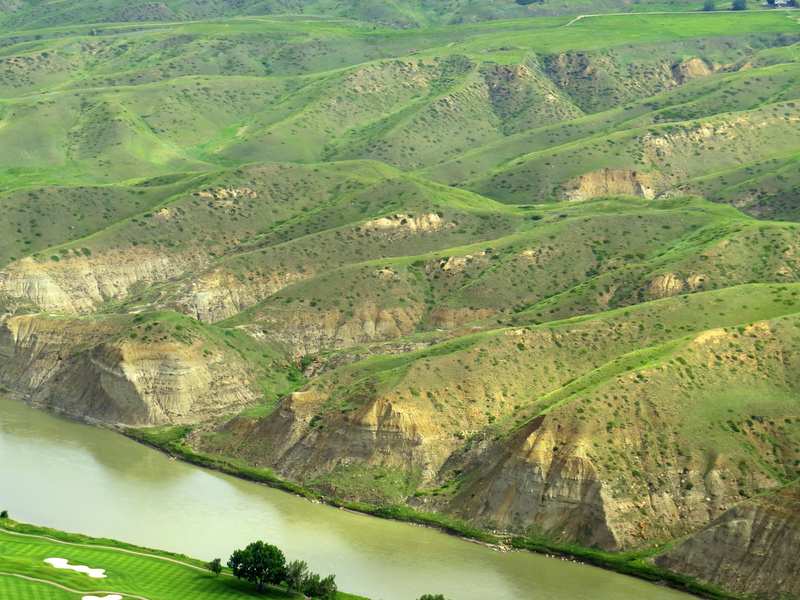 We are just confirming which coulee we will be doing and will report that soon. We will start around 4:30 and go for about 1.5 hours. We would like to make this a family affair so bring along any family or friends who want to help out. We are hoping to go out for pizza after. Los Amigos is on the road! At 3:00 pm Friday afternoon I received an urgent message from Jose Sanchez Reynoso (Pepesan), our primary contact and representative in Mexico for the Los Amigos Project. He informed me that the paperwork for the four vehicles we plan to donate to Mexican communities, was not finalized. Although we completed and sent all documentation, (consistent with the process followed in the previous four years) in early February, the Mexican government was now indicated that the paperwork regarding ownership of the vehicles is not acceptable. Late last night we re-submitted the paperwork and are waiting for clearance to proceed. We do not expect any resolution on this until Monday morning or later. I have consulted our project leadership team and Sunrise club president to chart a course of action. We have decided that we must delay departure and not leave on Sunday morning, as planned. I realize this creates stress and upheaval for many of you. We are hopeful that clearance from Mexico will be obtained next week and allow us to head south. Even with a latest departure date of Saturday April 18th it would remain our intention to return on the flight departing April 26 from Mazatlán. If the paperwork has not cleared by Friday April 17th we will cancel the trip for this year. The training team will proceed as scheduled as their participation is not dependent on the vehicles. If you are part of the driver team please let me know if you will be available to drive at short notice, this coming week. I will keep you updated as information becomes available. 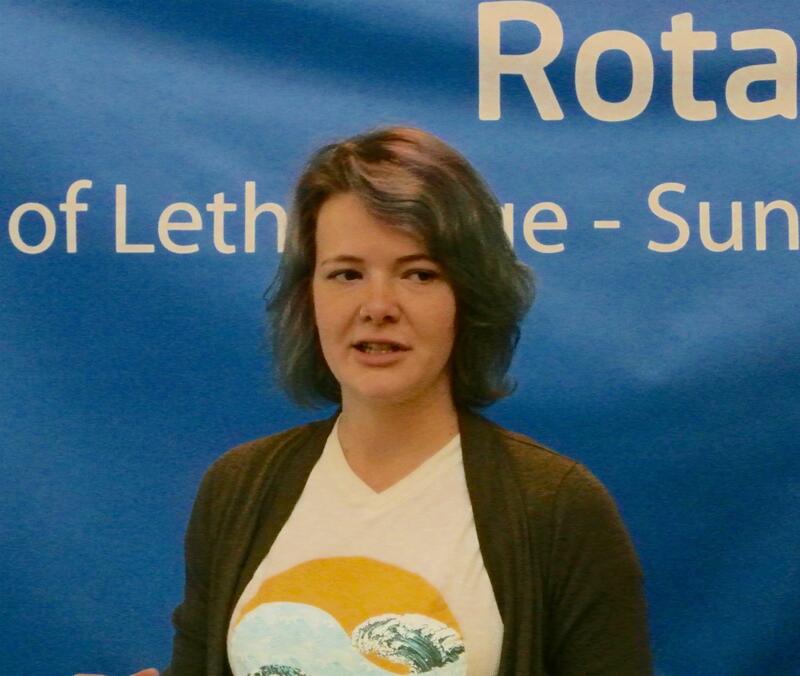 Tasha Silver talks about programming at Victoria Park School and how Sunrise Rotary financial support makes a difference for their students. 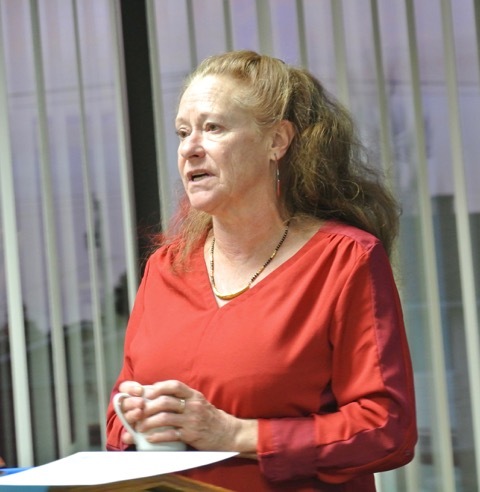 She presented at the February 26, 2015 meeting. Effective January 31, 2015, Terracycle is requiring people collecting the Tassimo discs to become public drop-off locations. I will therefore not be collecting the discs after January 15, 2015. If you have any discs you want to send in, I will do one final shipment before the end of the month so please bring any discs you have to the meeting on January 15. After that, you can still recycle your discs by taking them to the Helen Schuler Coulee Center as they are a public drop off spot. If you are interested in being involved in this Committee, please join us. 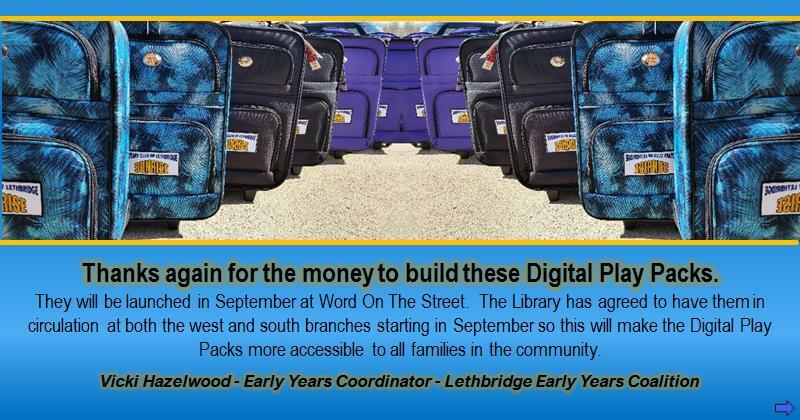 On September 21, 2014 the Lethbridge Public Library will host its fourth annual THE WORD ON THE STREET FESTIVAL. 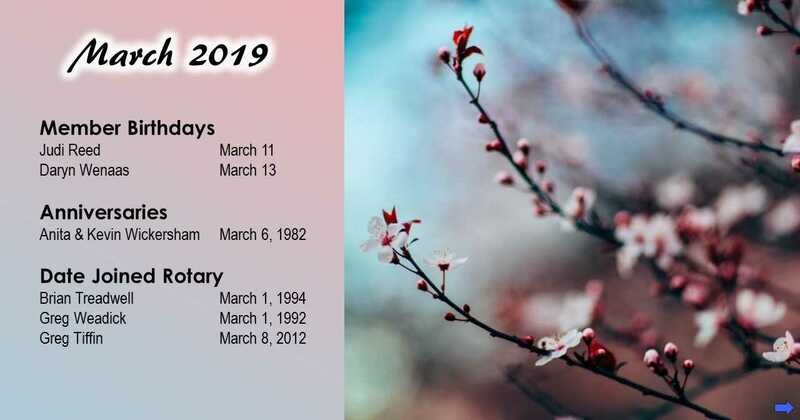 Founded in Toronto in 1990, the Festival's goal is to enhance and enrich a connection to reading and writing in all its forms by showcasing local, provincial and national literary and artistic talent. 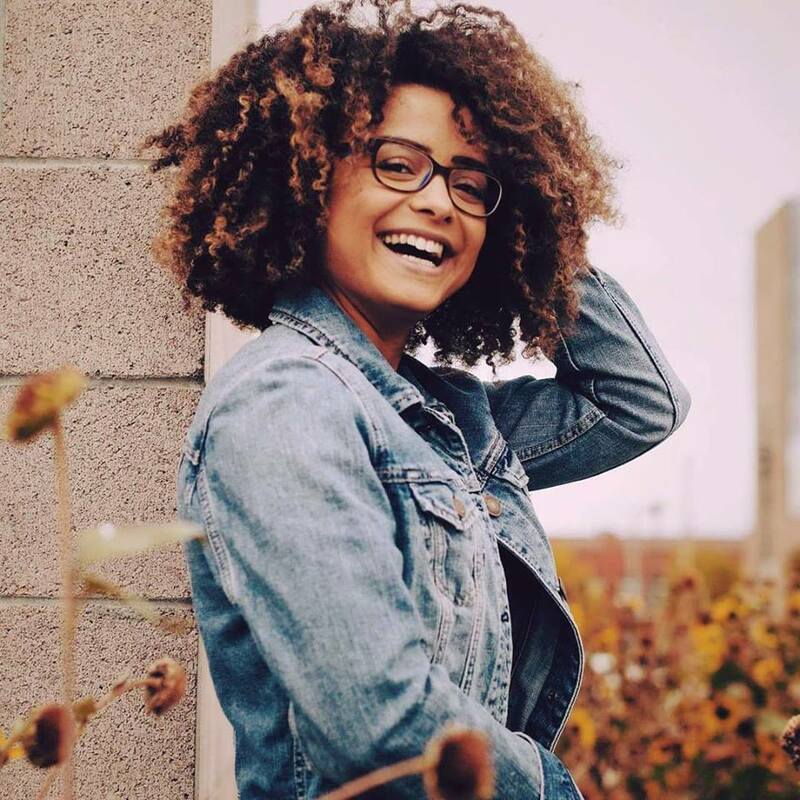 The festival presents established and emerging authors, storytellers, demonstrations and workshops, street performers, live music, and a bustling marketplace. We strive to create a festival that represents the diversity of our community, is appropriate to all ages, and most importantly is lively and fun. 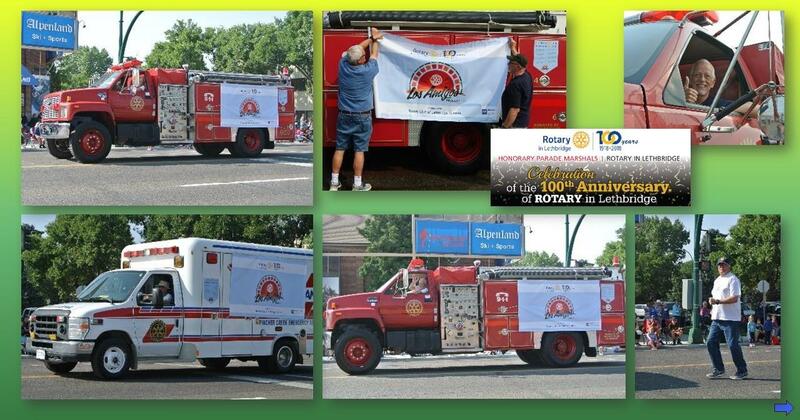 Rotary Foundation: We Did It! 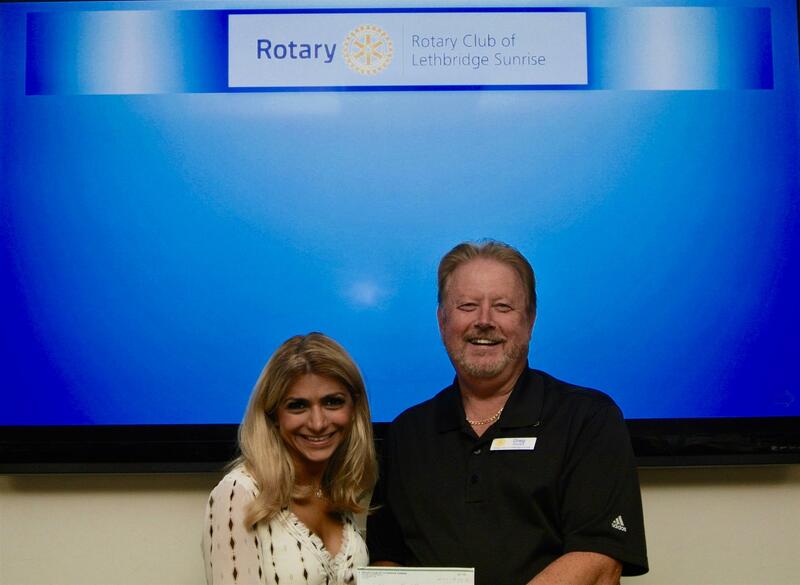 As of 30 June 2014, as a Club we have donated $6800.15 USD to the Annual Fund. Thanks to all of you who took the time to make a donation. 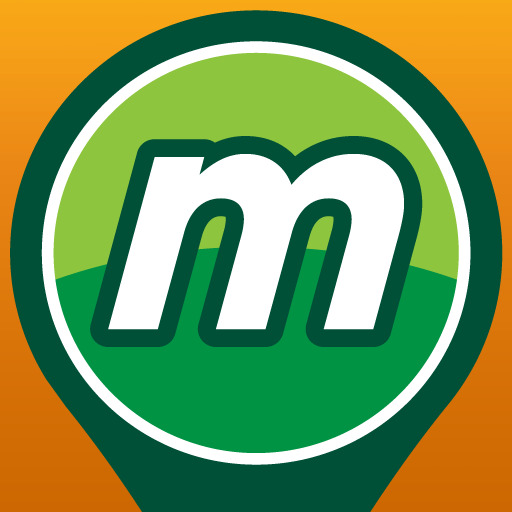 On Thursday, we will be helping everyone download the app for the Munzee Scavenger Hunt onto their cell phones and explaining how to capture the QR codes, so if you are planning on participating in the Munzee Scavenger Hunt at the Fiesta on May 24, 2014 please bring your smart phones to the meeting on Thursday, May 15, 2014. 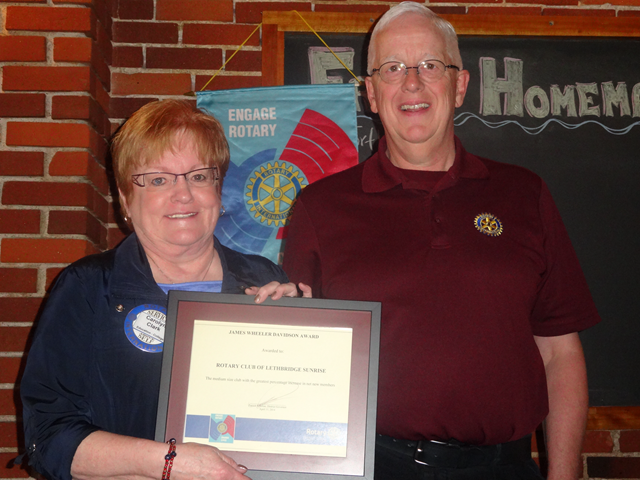 This award is for the CLUB with the greatest percentage increase in net new members.Net membership will be based on reported membership as of March 15th, 2014. 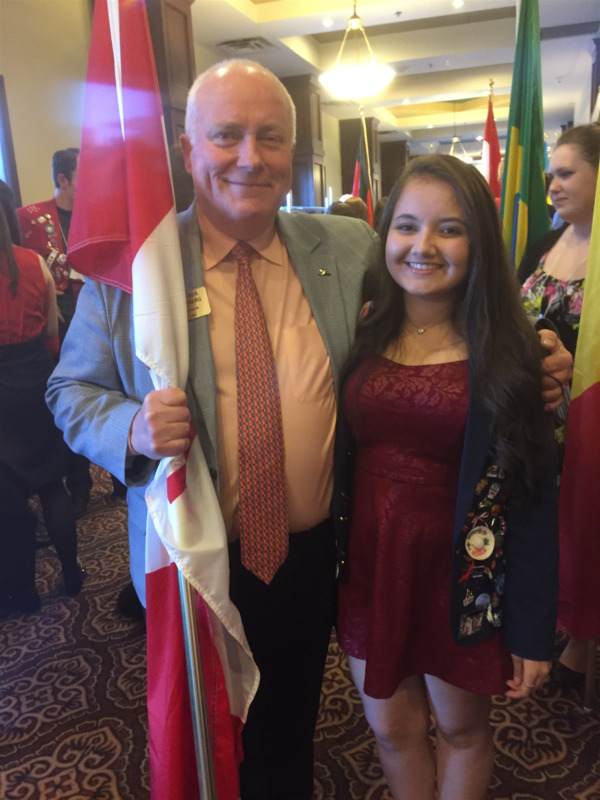 James Wheeler Davidson The man who took Rotary World wide! Jim was born in Austin, Minnesota on June 14, 1872. In his early adulthood he led an exciting and adventurous life trekking from the North Pole to travels into the Far East where he met his wife to be, Lillian, who was a San Franciscan. James and Lillian came to Calgary in 1906 where he established Crown Lumber. 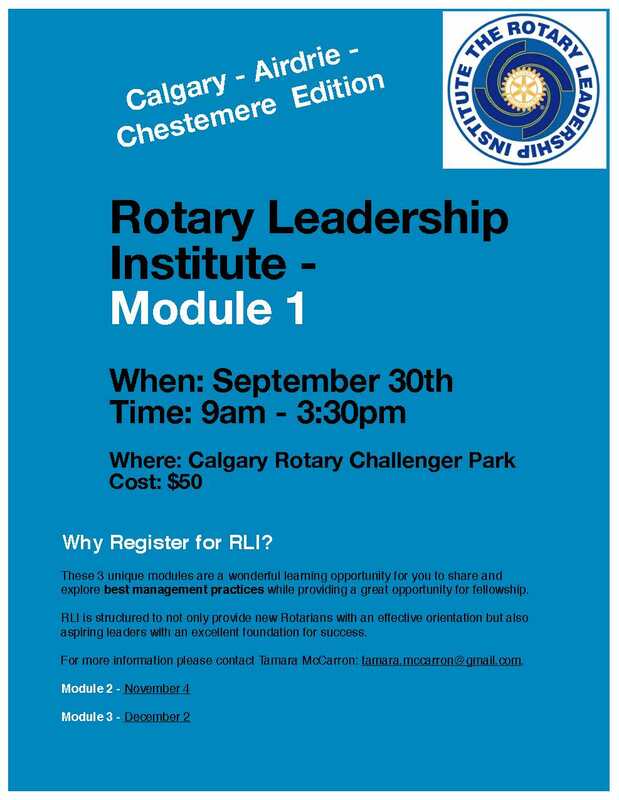 In March of 1914 he became a charter member of the Rotary Club of Calgary. He then went on to become a director and then President in 1919. 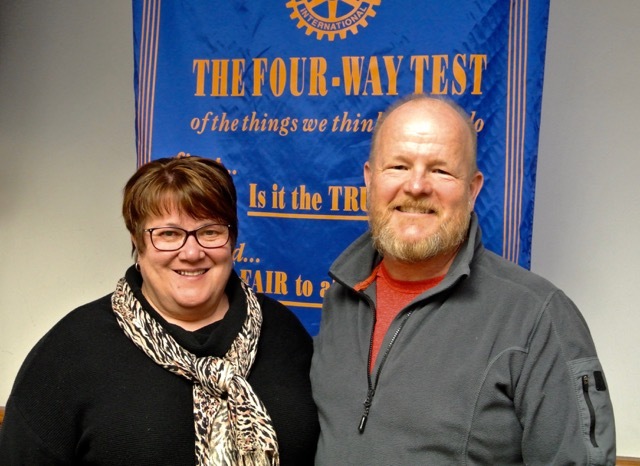 In 1921 Rotary raised $11,000.00 and with it, sent Jim and J. Layton Ralston of Halifax to Australia carrying the goals and ideals of Rotary with them. By 1932, Jim had literally traveled the globe, interviewed thousands of individuals and influenced the development of Rotary Clubs world-wide. 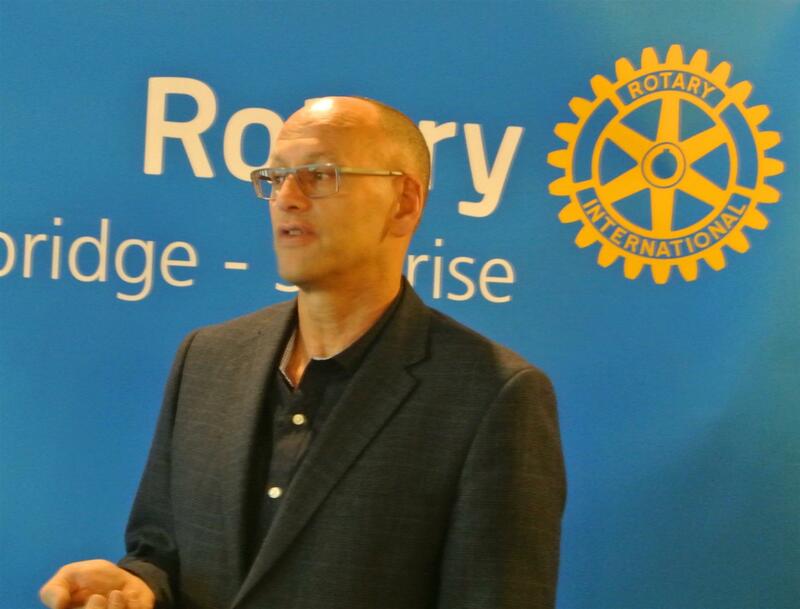 During his travels he chartered 23 Rotary Clubs in 12 countries. Jim served as District Governor during 1923-24. Carolyn Clark receives the Jim Davidson award. 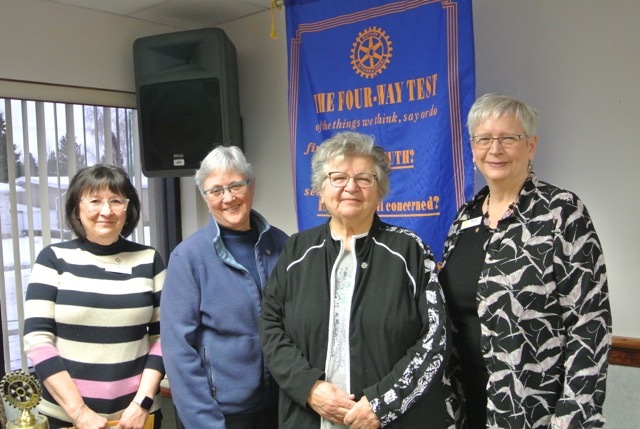 Carolyn Clark, Myrna Procinsky-Longair, and Marlys Reynar. This program is a celebration of the Beatles' 50th anniversary appearance on "The Ed Sullivan Show" and it includes top artists covering the songs the Fab Four performed that night, as well as other Beatles hits. Also shown is archival footage of the historic 1964 broadcast. 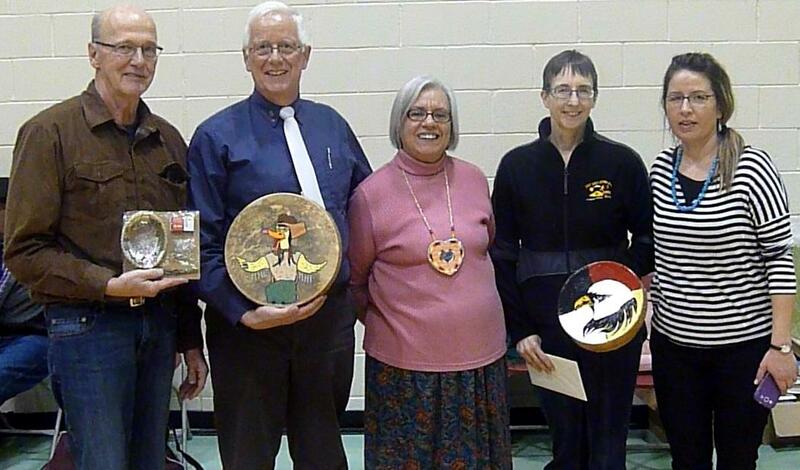 Don, Carol, and Marty attended the Kainai Literacy Day Pow Wow at the Kainai High School on 23 January 2014. 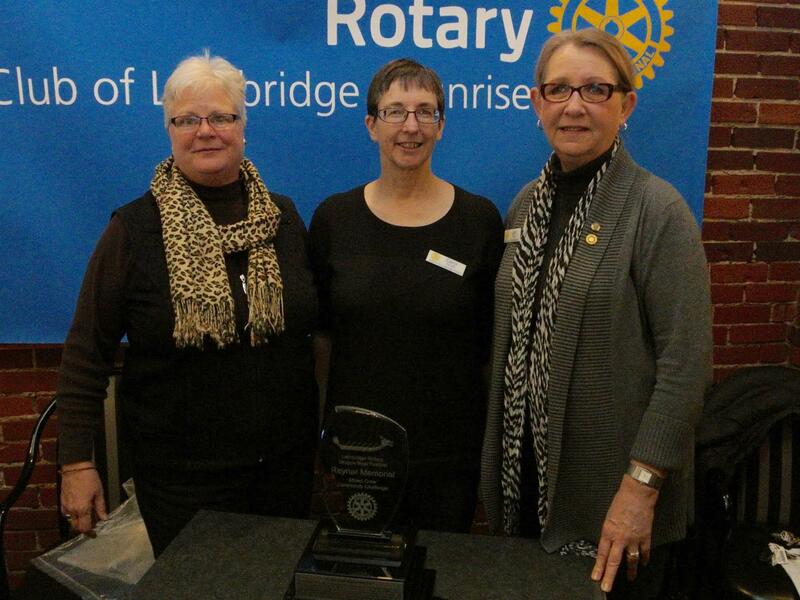 We were honoured for our club making a 78 book contribution to support their literacy day. 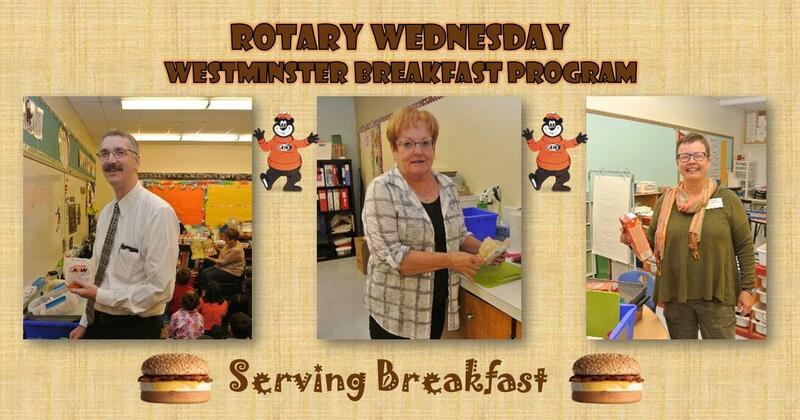 Linda Weaselhead is the Literacy Coordinator at Kainai Board of Education. 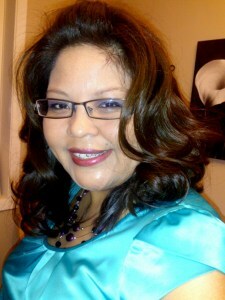 Hali Heavy Shield is a Kainai Board of Education teacher. 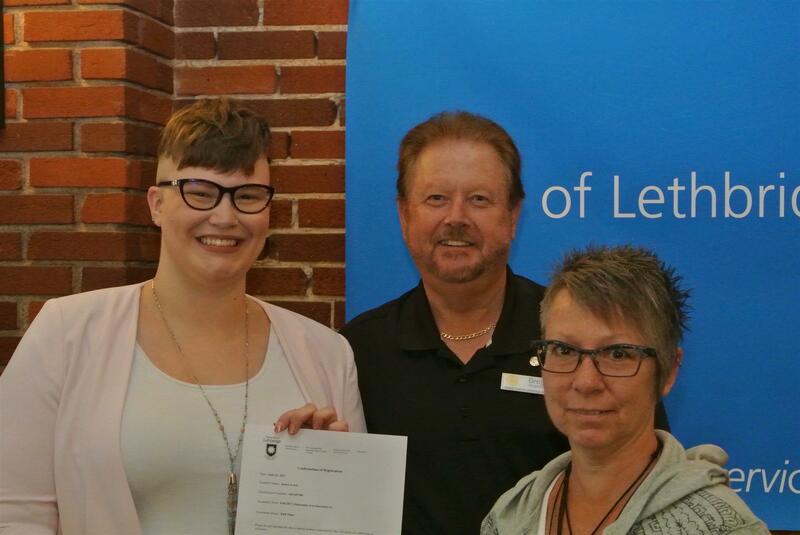 Linda and Hali have been driving spirits behind the Kainai Public Library and its membership in the Chinook Arch Regional Library System. Please click on "Read more..." at bottom-right to view videos of dancers at the Pow Wow. Paul Percy Harris (19 April 1868 – 27 January 1947) was a Chicago, Illinois, attorney best known for founding Rotary International in 1905, a service organization that currently has well over one million members worldwide. 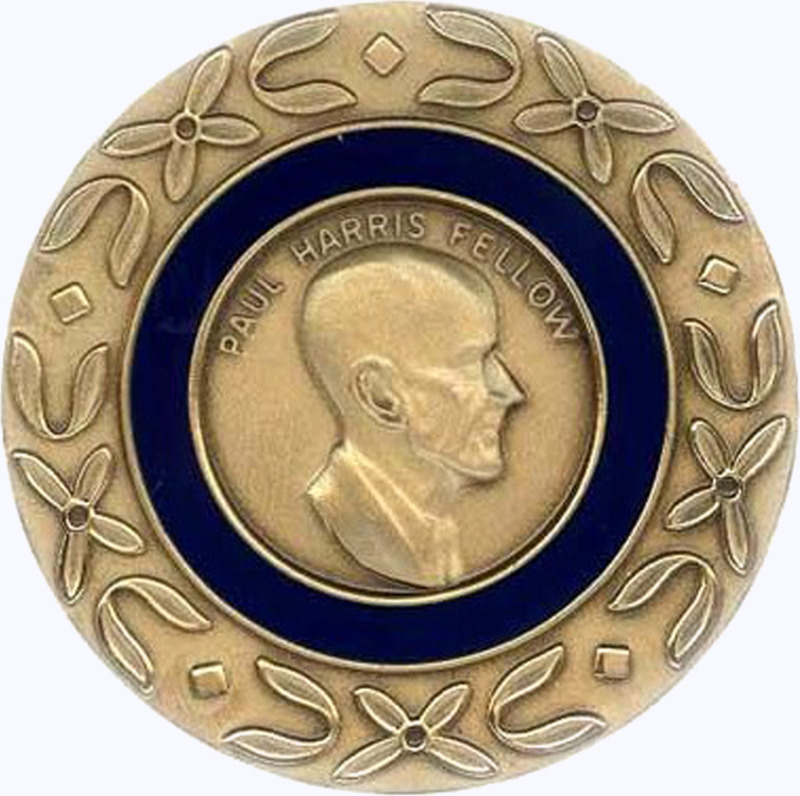 Paul Harris Fellow Individuals who have contributed more than $1000 to the Annual Program Fund, the Polio Plus Fund or the Humanitarian Grants Program of the Rotary Foundation are recognized as Paul Harris Fellows. 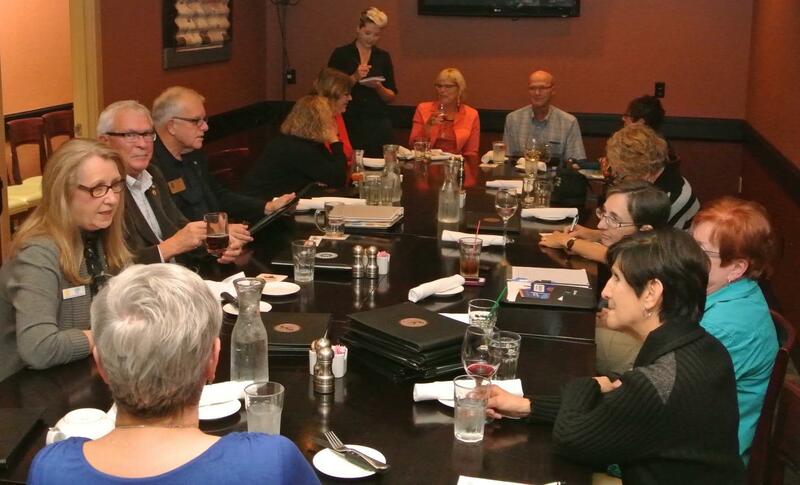 Additionally, individual Rotary clubs may from time to time honor individuals as Paul Harris Fellows. 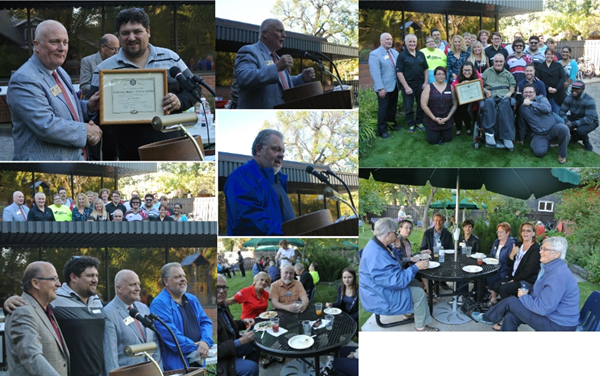 These honorees are individuals who meet high professional and personal standards set forth by Paul Harris. 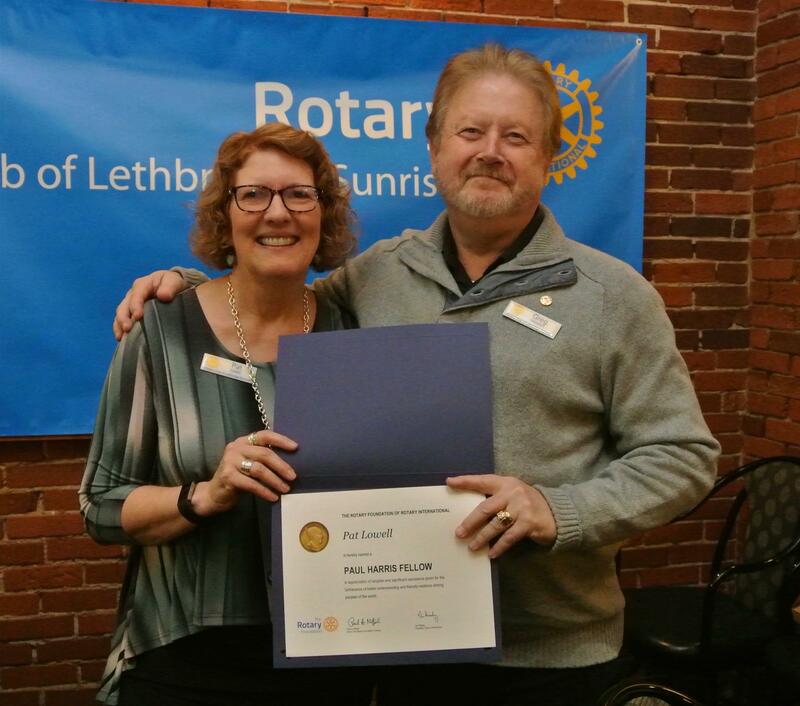 Paul Harris recognition is not limited to Rotarians. Wayne Ens - One week in Mazatlan + two return tickets from WestJet. 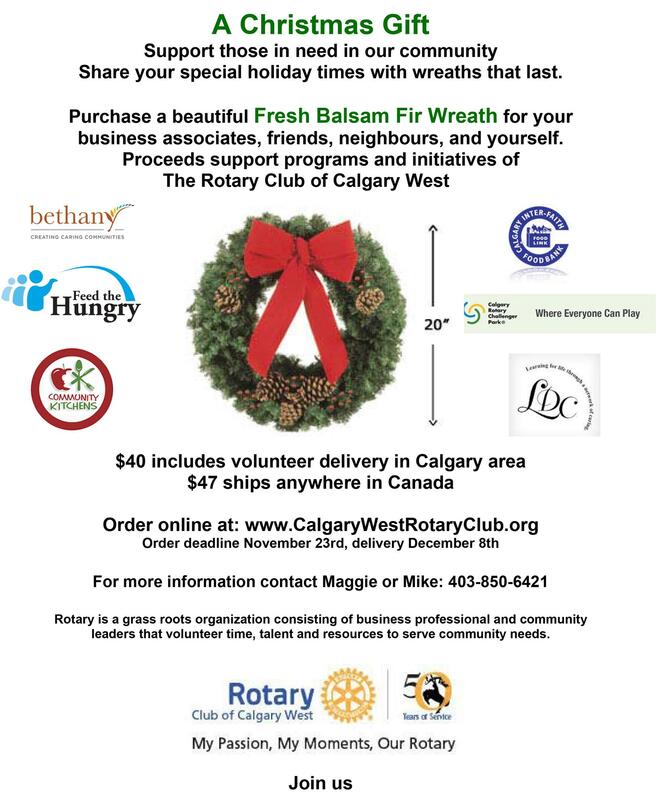 Please support the Rotaract Club by either donating auction items or attending the event. Tickets are $80.00 each or $500.00 for a table of Eight. Student tickets are $40.00 each. 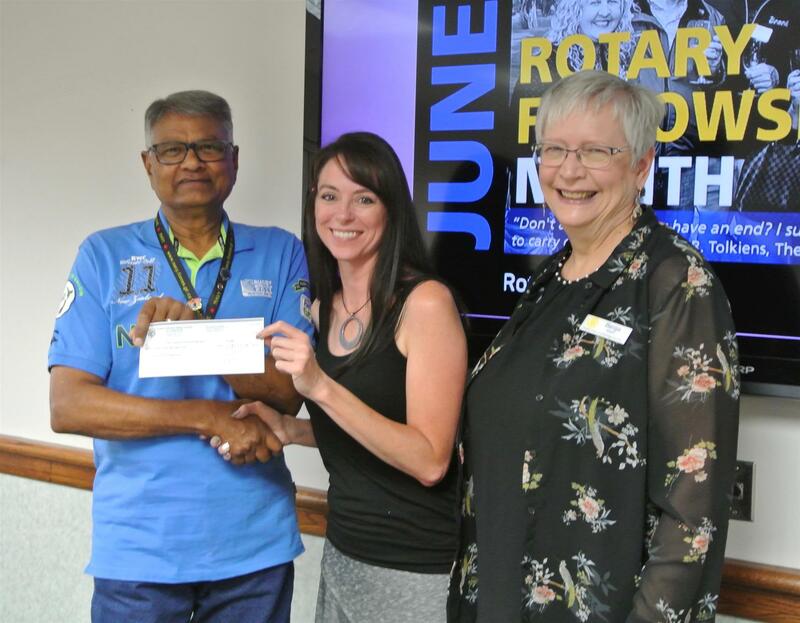 I have always been aware of Rotary from the many fundraising functions that Rotary puts on during the year, but I was not aware of all the roles that Rotary fills in the local community as well as the international community. 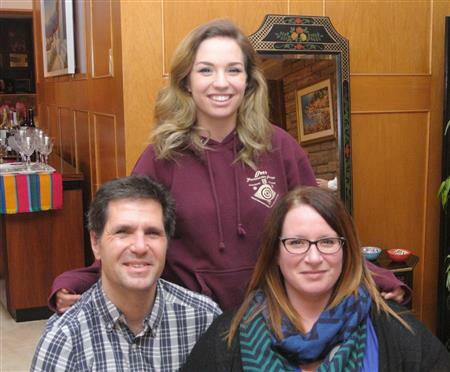 I first became aware of the student exchange role when my niece was accepted as an exchange student. This piqued my interest and it started the process of becoming more aware of the many functions that Rotary fills. 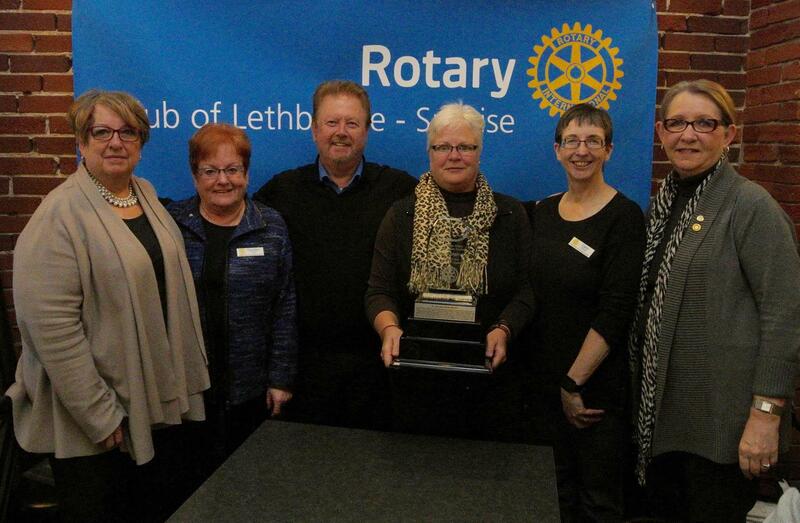 Lethbridge Sunrise receives the 2011 Presidential Citation - WITH DISTINCTION! I guess I have been service-minded for about as long as I can remember. When I was young I was involved in 4-H and Boy Scouts. 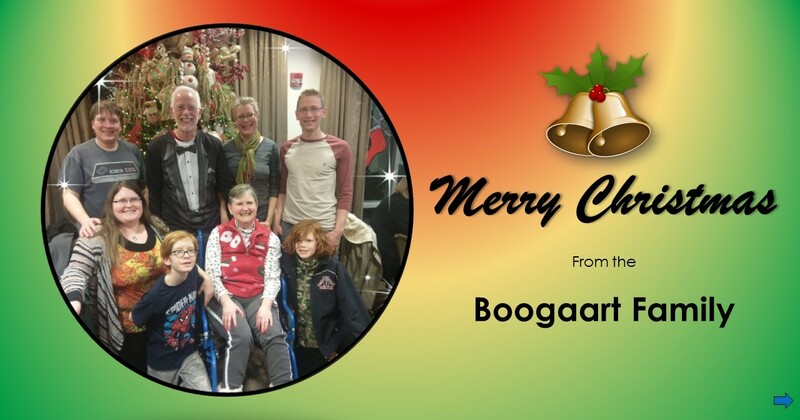 My Dad was always helping out the needy in our small town and was a member of the Lions Club, a school board trustee and a social activist. He lived his life based on Albert Einstein’s statement that only a life lived for others is a life worthwhile. Take a minute and 48 seconds to view this video...it's good. 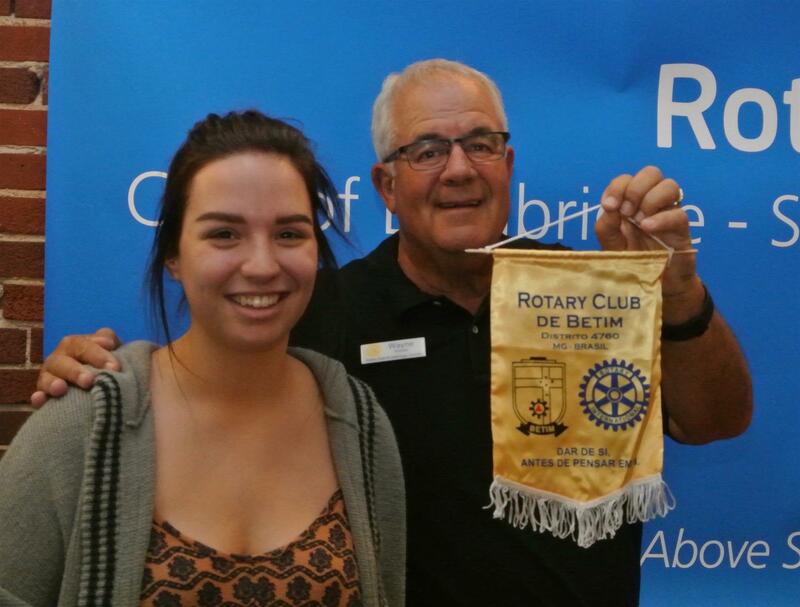 Selene is the Exchange student from Mazatlan who is hosted by the Rotary Club of Lethbridge Downtown. 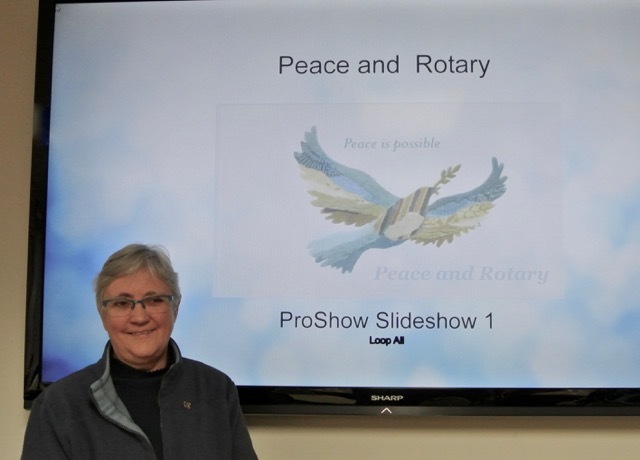 If you would like to see her powerpoint presentation that she gave the to our Club on April 14, 2011, please click the link below. 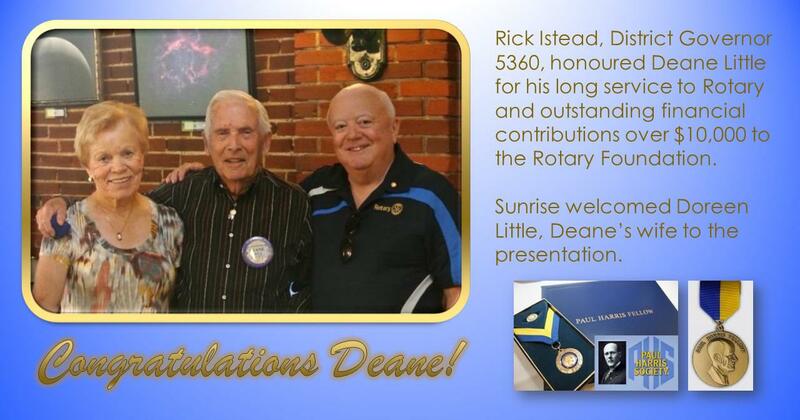 I was first introduced to Rotary through my brother-in-law in the early 80’s. At that time he was very involved with the youth exchange program. Although I felt the exchange program was an excellent program, I was not very supportive of the male only designation of his choice of service club. 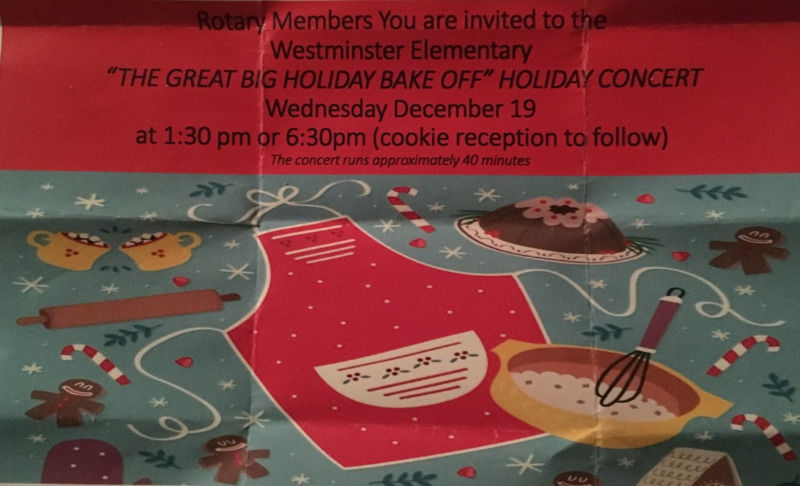 Rotary advanced to open their membership to women in the late 80’s; however, I was still not sure the male dominated club would be my choice. My first introduction to service work and service clubs was almost 30 years ago. It was 1984, Kerry & I were newly married and I was being promoted to Bank Manager and being transferred to Snow Lake, Manitoba. Snow Lake is a small mining town about 700 kilometers straight north of Winnipeg. My former boss had relocated numerous times and suggested I join a service club as a way to connect with other business people. 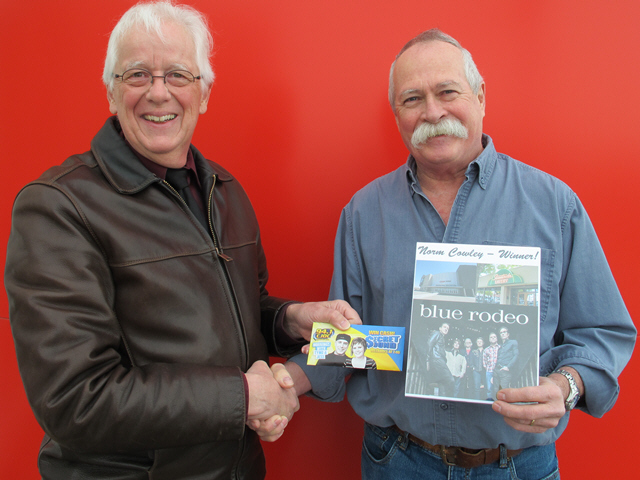 I took his advice and wound up spending the next 14 years actively involved with Kinsmen.